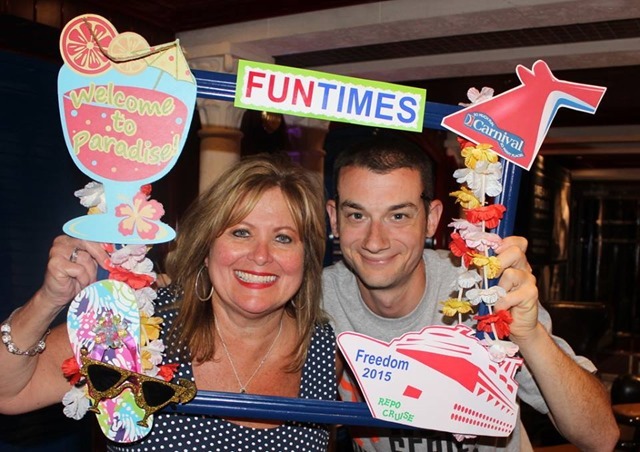 The repositioning cruise of the Carnival Freedom in February 2015 was one of the most incredible cruises I’ve experienced – and I’m not the only one who feels that way. 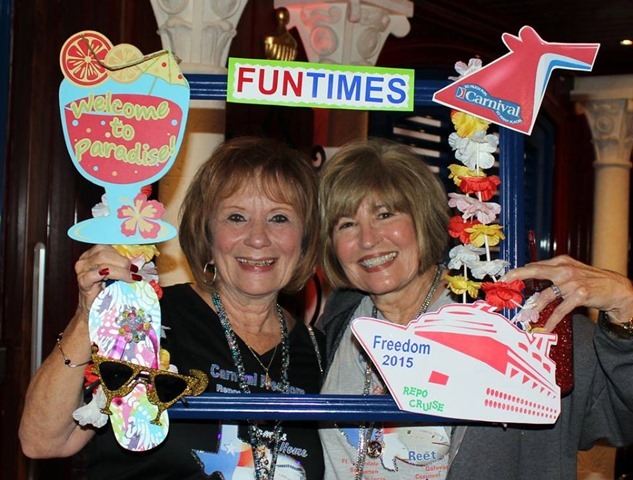 It wasn’t just (or even mostly) the itinerary, although it was a wonderful itinerary and was the reason I initially booked the cruise. 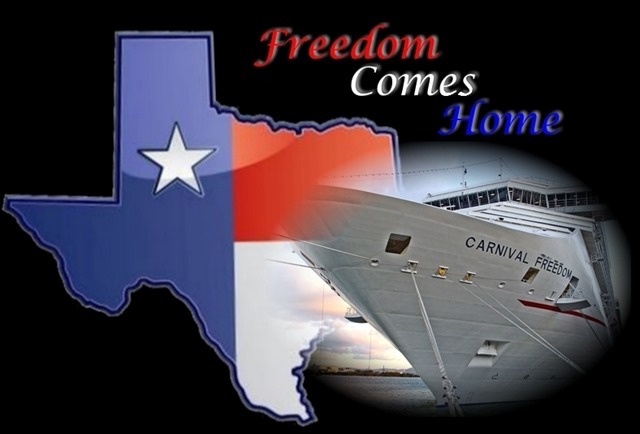 The ship was being moved from Florida to Texas, and I, along with hundreds of other Texans, was there to make sure she got safely to her new home. 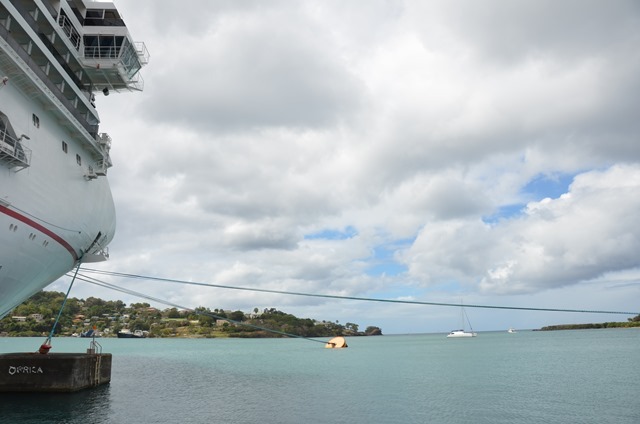 It wasn’t just (or even mostly) the ship itself, although I absolutely love the decor, the general layout, special venues such as the Fish & Chips restaurant and special cabins such as the Scenic Oceanviews and Grand Scenic Oceanviews. 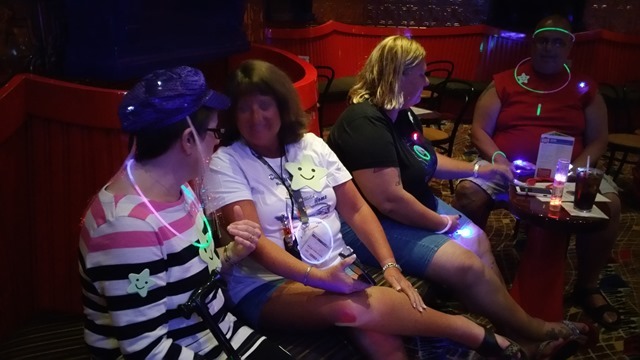 It wasn’t just (or even mostly) the length of the cruise – twelve beautiful days – although the longer duration meant fewer little kids running around, a more experienced cruising crowd, and more time to relax and explore the ship at a more leisurely pace. 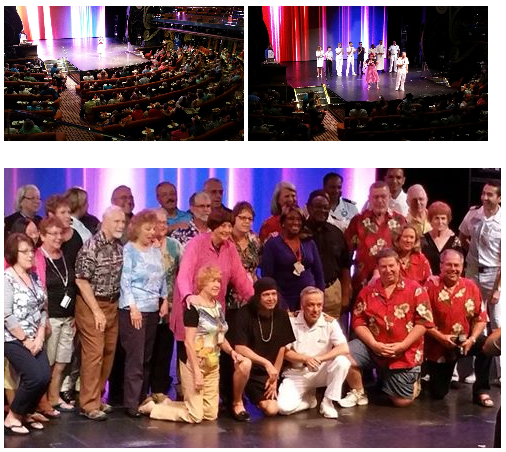 The thing that made this cruise stand out above most of the rest (rivaled only by my fantastic 20th anniversary cruise on the Carnival Breeze in December 2014) was the very special group of people who started the journey in Fort Lauderdale, Florida and ended up almost two weeks later in Galveston, most near tears at the thought of saying goodbye. 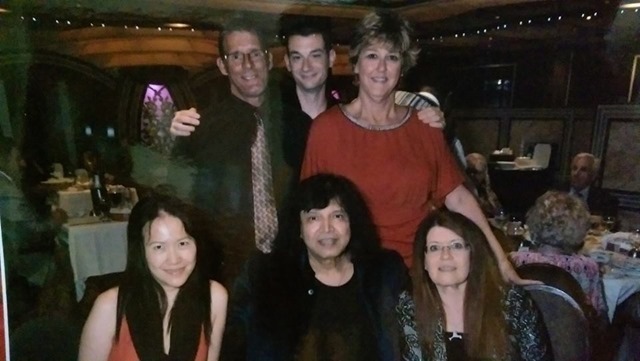 In the time between our first Meet & Greet at sailaway and our big farewell party on the last sea day, something almost magical happened for many of us. 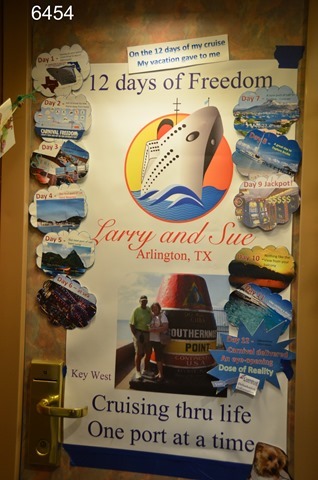 Twelve days of Freedom changed our lives – in a very positive way. 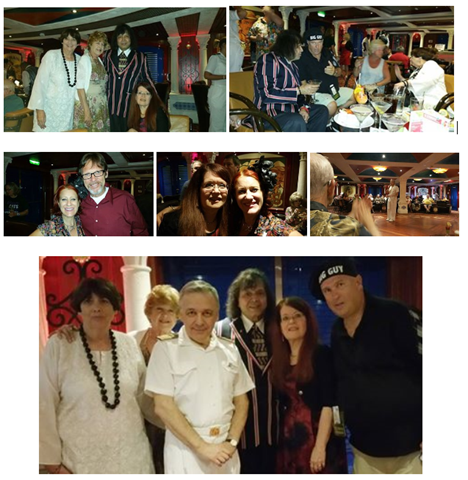 It all started long before the sailing date – nine months before, when I first heard the announcement of this repo cruise and started a Facebook group, as I had done for some of my prior cruises. Those previous groups had anywhere from 20 to 150 members. Some were pretty active and some weren’t very active at all. 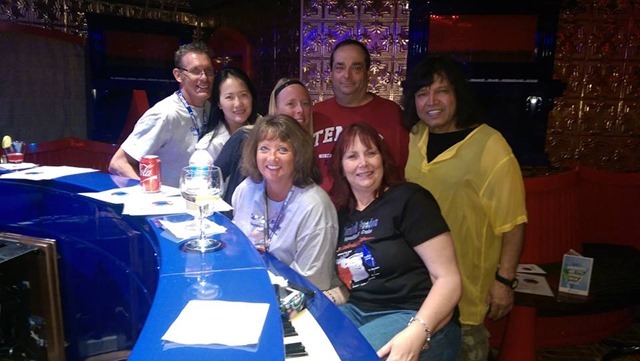 Some of the group members usually met up on the first day – sometimes just an informal get-together at one of the bars and sometimes in a reserved room with an organized paid cocktail party – and then we all went our separate ways. 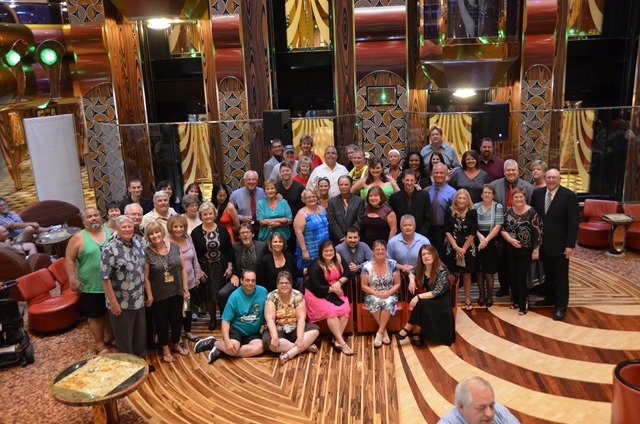 We would greet each other in passing on the ship, some of us saw each other on excursions if we’d booked the same ones, sometimes we gathered again for a drink later in the cruise, but that was about it. That’s not how it was with Freedom. From the beginning, it was a group with character, and it became more over the subsequent months as more folks joined up. I never anticipated that we would end up with more than 600 members. As with any large group of people, we had all types, and inevitably there were conflicts. Some members didn’t like the way I ran the group, and formed their own. Some members didn’t like what other members said or did, and deluged me with complaints about it. 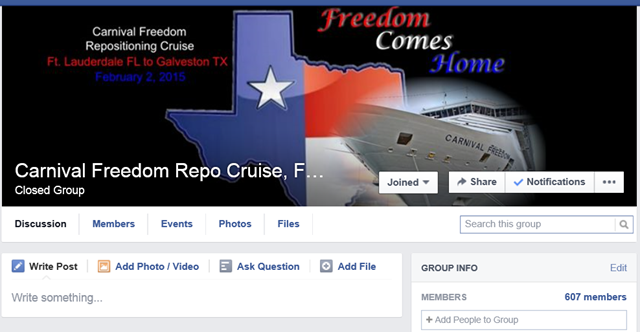 Some members even cancelled the cruise. Some left and then came back. We had drama – both manufactured and real. There were petty accusations, behind-the-scenes gossip, inexplicable actions (someone kept deleting all of our group documents). In any group of almost 700 people, there is sure to be some drama along the way. In addition to the mysterious disappearing files, there were disagreements that led to some small groups breaking off and forming their own groups. 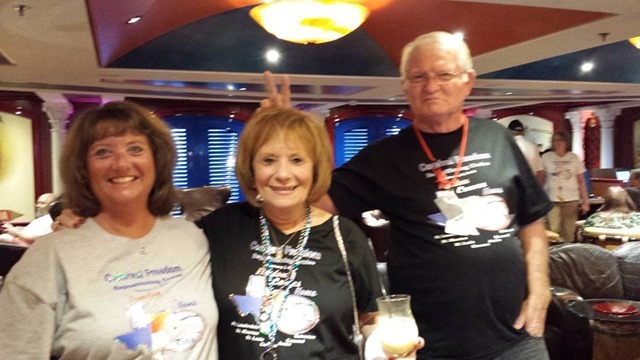 There were hurt feelings over tee shirt designs, private parties that were planned and then cancelled, a major schism over the administrative decision to allow group members to advertise “for pay” activities and products (privately arranged excursions, memento challenge coins, makeup parties). 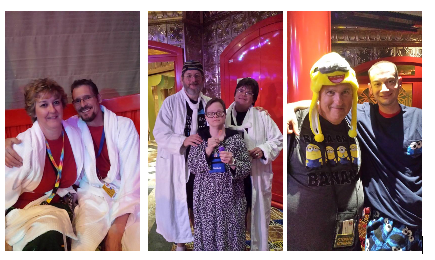 But for the most part, we grew into a solidly bonded group of friends long before we ever laid eyes on one another in the “real world.” There were extraordinary acts of kindness and incredible shows of support for fellow members in need. 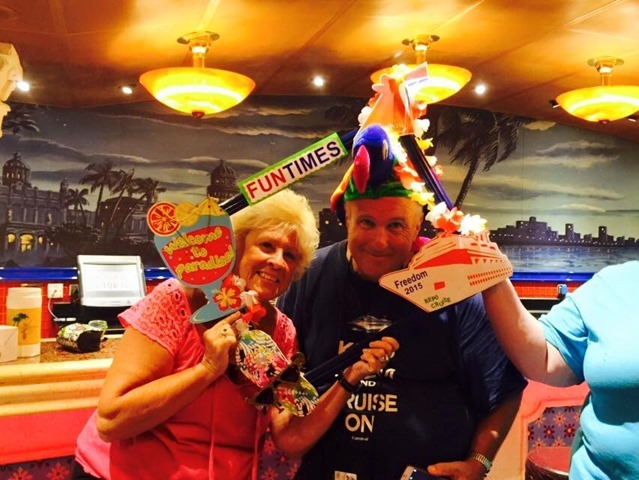 There were serious illnesses, accidents, personal crises that threatened to prevent some of our members from going on the cruise. There were deaths in families, lost jobs and other tragedies. 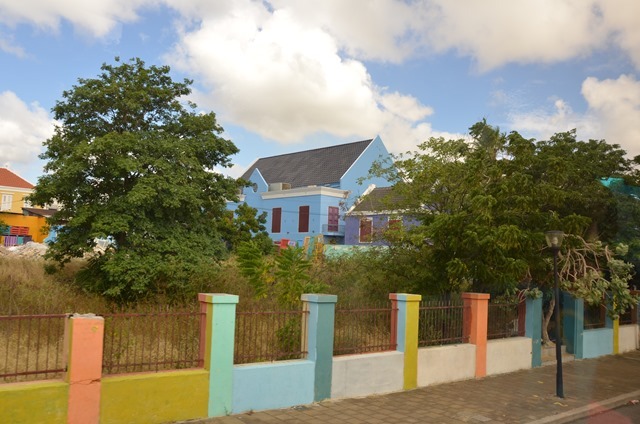 Group members came together and showered those affected with love and practical assistance. The tee shirt design controversy was resolved (with a few different options offered) and Patti Dressler Brower at www.wepromoyou.com took my designs and those of others and printed these absolutely dynamite shirts, available with optional “bling” (rhinestones outlining the text and elements), to help us identify other members of our group and announce our presence to the rest of the ship. 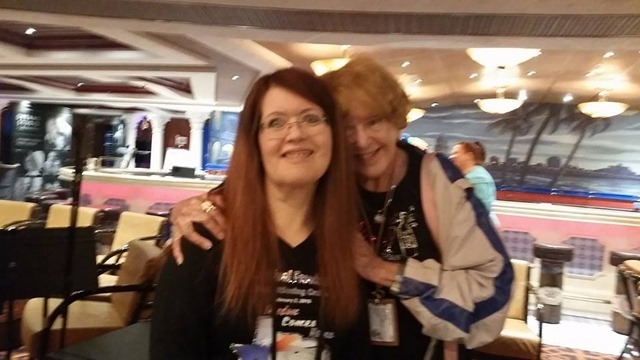 🙂 Patti is really great to work with and I’ve used her services to print group shirts for several cruises. 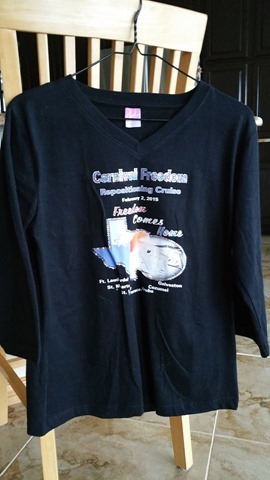 Some folks did their own designs and some had them printed by Angela Williams Gray at www.customcruisewear.com, who also does an excellent job and is great to work with. 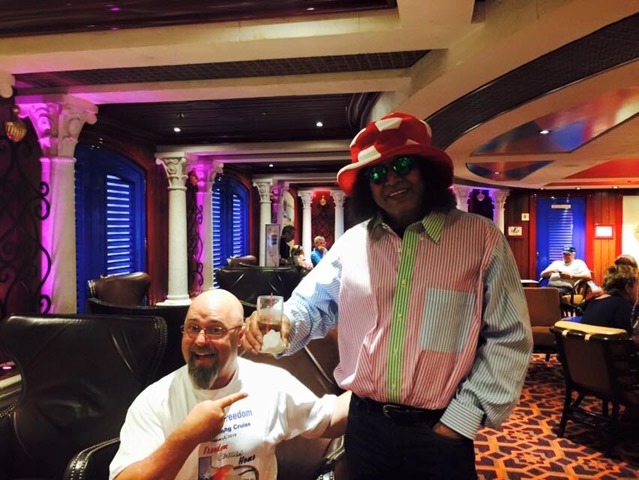 We cruise aficionados are lucky to have two fantastic choices for printing shirts and other cruise-specific memorabilia. 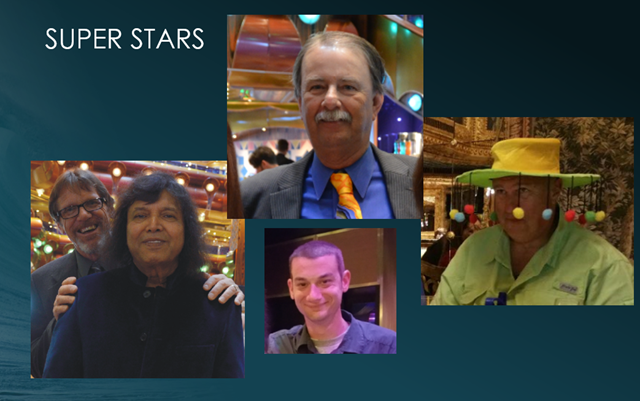 There were group members who stood out, whose dynamic personalities dominated the page. There were members who joined and then lurked, never heard from. 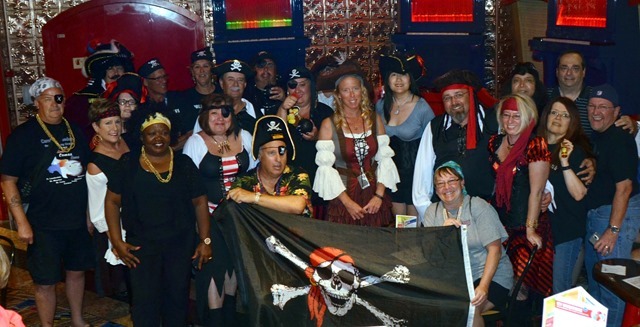 There were first time cruisers and there were Diamond-level members with hundreds of days of sailing under their belts. There were big families sailing together and there were people sailing solo. There were people wealthy enough to spend every cruise in the grandest suites and there were people who had scrimped and saved to afford to share an interior cabin with three other people. It didn’t matter. 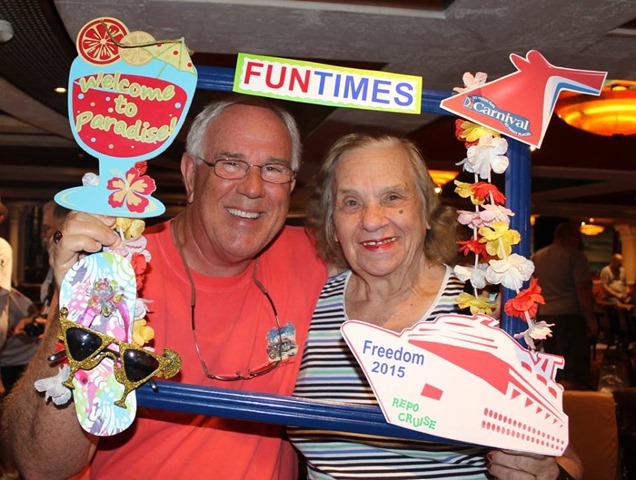 We all had something important in common: We loved cruising and we were eager to bring Freedom home. 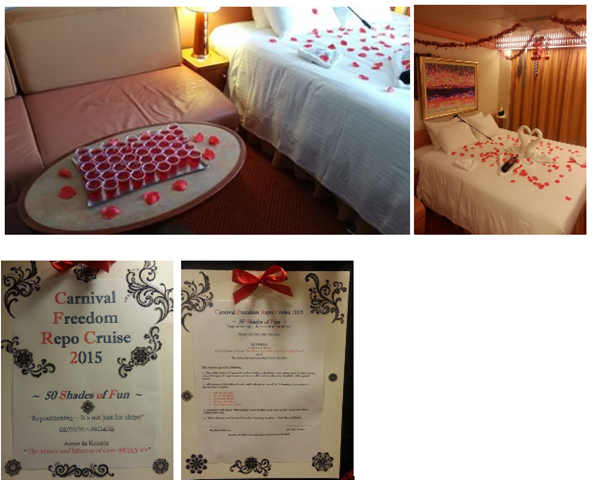 As the group grew, so did all the ideas and suggestions and plans for onboard activities. 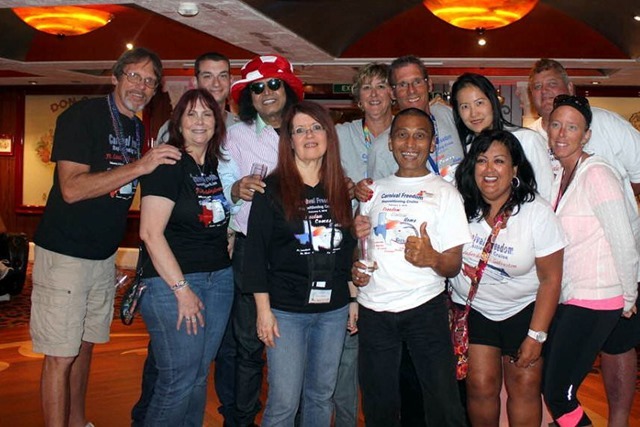 Early on, it became much too much for one person to handle, and there were wonderful people who volunteered their time and effort to help me manage the group, to lead various activities, to take care of the many documents that we generated, to have special mementos made for those who wanted them, to organize shore excursions and onboard parties, to open up their staterooms for others to see in a cabin crawl, to print door decorations for those without access to a printer, and so forth. 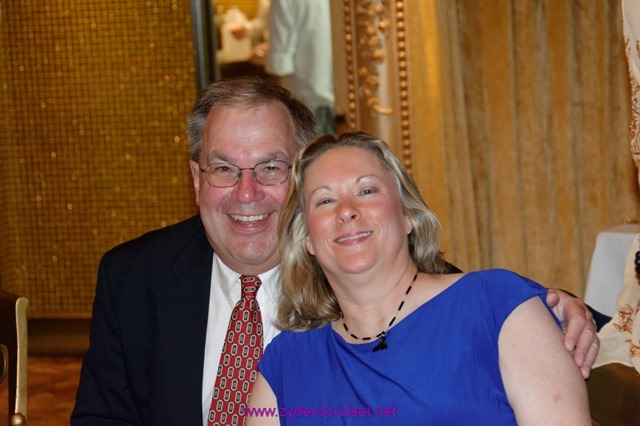 Terry Carberry was first and foremost among my co-admins. As the “keeper of the docs,” he made sure all the information was there – even in the face of adversity when those files kept being deleted. 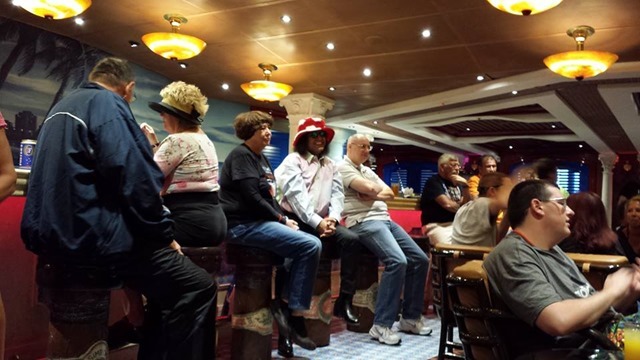 The Man in the Funny Hats (Stormin’ Norm) was instrumental in arranging piano bar parties and using his influence (born of almost 500 days spent on Carnival cruises and many more on other cruise lines) to cut through the red tape and get “special favors” such as a room and projector for our goodbye party. 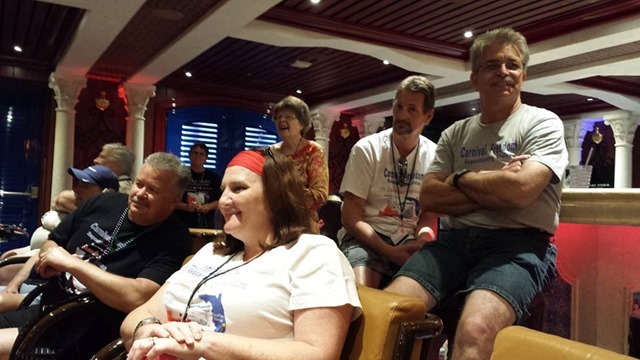 The excitement and enthusiasm grew as our cruise plans became inextricably entwined. 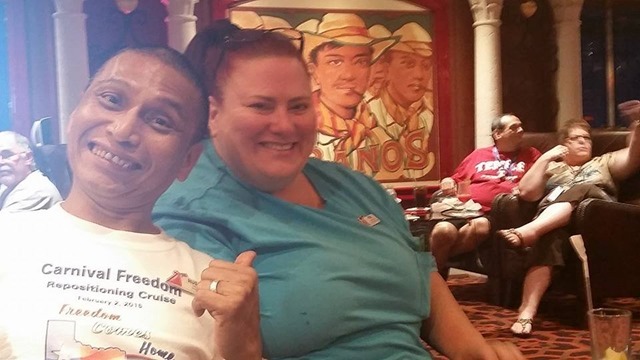 We made reservations at the same hotels, plotted to meet up at the airport, mapped out our schedules to do things together both pre-cruise and on board, coordinated our dining times, even had parties to meet up at restaurants or group members’ houses before the cruise date. We talked about it, thought about it, worried about it, dreamed about it, and then, before we knew it, it was finally time to live it. 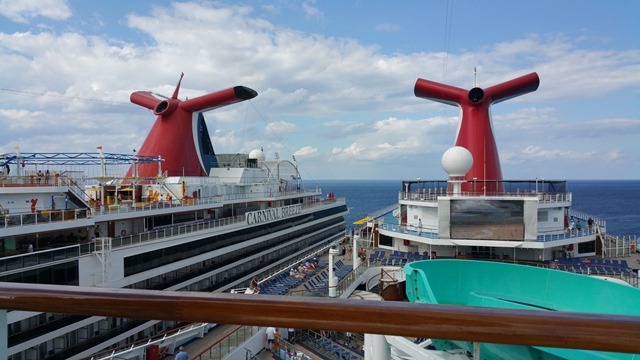 As embarkation day approached, I had mixed feelings. 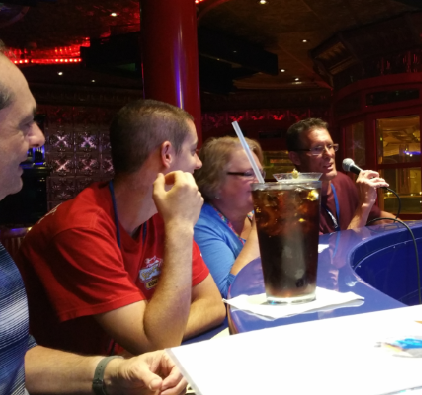 I hated leaving Tom and my canine babies for almost two weeks, but I was really looking forward to this cruise and to sailing with this biggest and most interactive group of people I’d ever seen on a Facebook group. 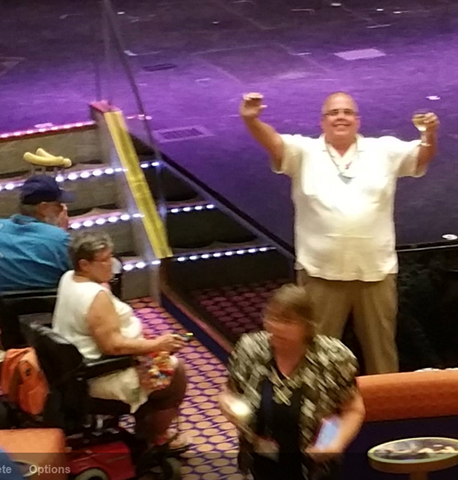 I was also happy that, thanks to price drops, having booked the cruise on board the Miracle, and my CCL shareholder benefit, by the time of sailing I had $837 in on-board credit. I made it my goal not to spend anything over that on my Sail & Sign card, thus making the total cost of this twelve day Caribbean cruise only a little over a thousand dollars for the cruise fare plus $169 for the hotel (my first class plane ticket had cost $2, since I used reward to book it). I met that goal, too. 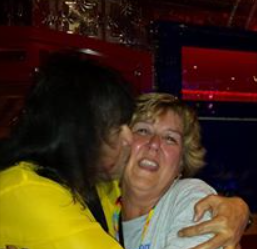 Even though I did a lot, including going to the Chef’s Table and buying a number of things in the Fun Shops and having a few drinks and doing a few excursions, on the last night of the cruise I still had $260 left on my Sail & Sign account. I bought a round of drinks in the piano bar and still had over a hundred left. Since it was non-refundable, I put it into a casino account, didn’t play but cashed it out immediately and went home with a C-note more than I’d started the cruise with. But that was far in the future on Feb. 1. My bags were packed and I was ready to go. Most of us were flying or driving to Fort Lauderdale at least one day before the cruise, and many of us were staying at the same hotels so we could meet up the night before. 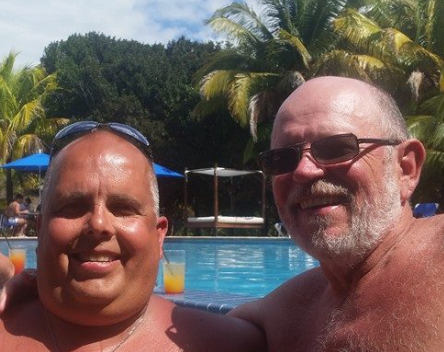 I flew first class (courtesy of having 200,000 award miles on AA) and met my cousin, with whom I would be sharing a cabin and who had taken an earlier flight) at FLL airport. We proceeded to the Hilton Marina hotel. Where, of course, there was a glitch in our room reservation. 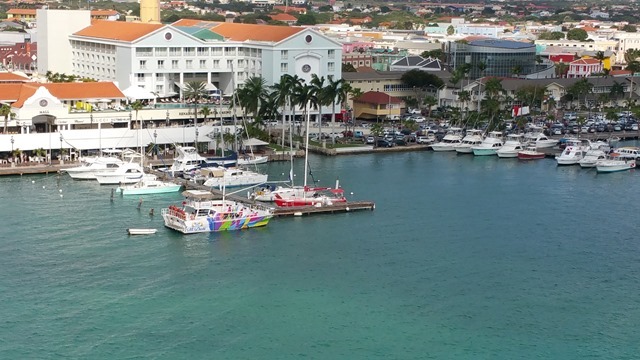 The hotel staff, however, was great and straightened it out without too much hassle, and we ended up in a great room with a lovely view of the harbor. It was a lovely hotel and we met several of our fellow cruisers and walked to the wine store to procure our carry-on bottles. 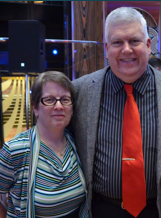 Sharon and I had a nice dinner with Carol and Richard Hoefs at Nanking Asian Grill, and then a great walk along the waterfront. 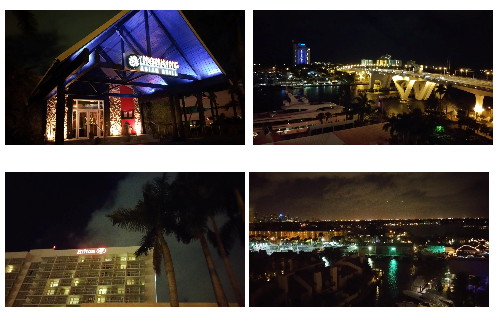 The Fort Lauderdale night time skyline was beautiful. That night, I had a bit of a scare, and for a short while, it looked as if I might not be going on this cruise, after all. Tom and I had arranged to do a Skype call before bedtime, so I got back to the hotel room at the appointed time and connected. We talked for a bit and then he decided to take the laptop downstairs so the dogs could hear and see me. Well, as he was walking down the stairs, suddenly the display on the screen spun, there was a crashing noise and an expletive, and then – nothing. 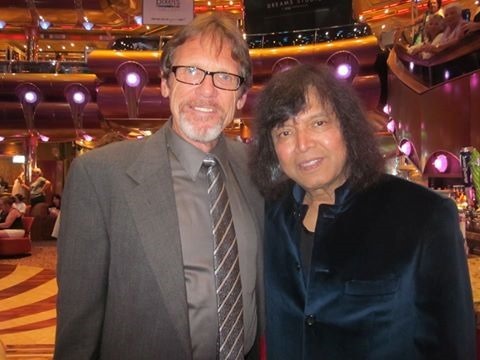 The next morning, Feb. 2, I talked to Tom and he said he was a little better. The sunrise over the bridge was gorgeous and we got our first glimpse of the Freedom from the hotel balcony. She seemed to be calling to us to come sail away. 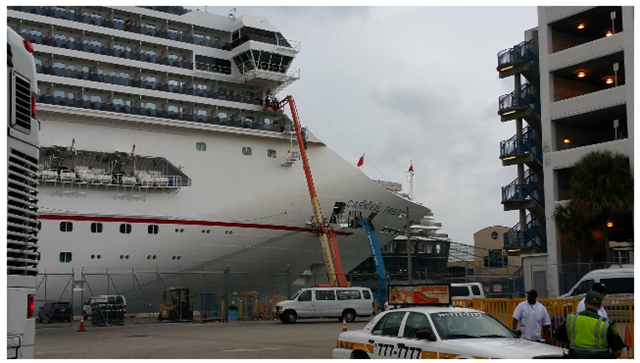 The cruise terminal at Port Everglades was within walking distance but we had a lot of luggage – it was, after all, a twelve day cruise – so we took a taxi. It let us off right next to the ship so we got to see her up close and personal for the first time. What a lovely sight she was. We waited a while for one of the group members, then went inside. The bag check and security processes went smoothly and the check-in line wasn’t long but then we spent quite a while sitting in the VIP lounge, which was very crowded. There were (expectedly) a lot of Platinum and Diamond level cruisers on this sailing. 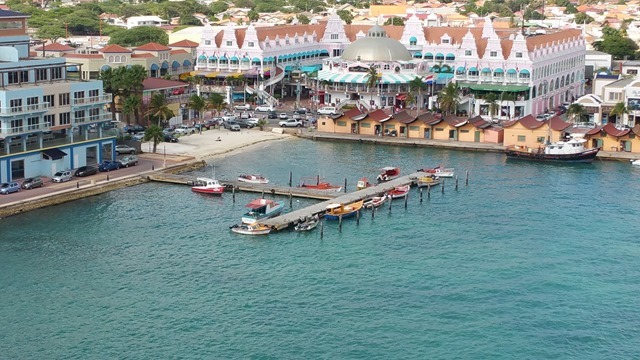 Repo cruises are popular with experienced cruisers because of the more exotic ports and longer durations. After a while, we were called to board and the wait was forgotten. Once you step onto the ship, nothing else matters. 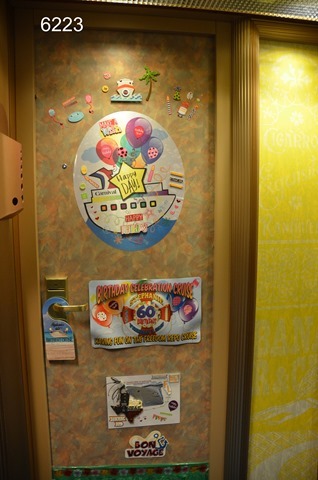 We made our way to our cabin, where we were in for a pleasant surprise. I had known when I booked it that the corner oceanview cabin would be larger than usual but I hadn’t known how spacious it would be. 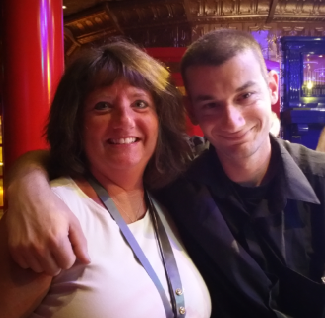 A huge “thank you” to Todd, the Future Cruise Desk person on the Miracle where I had booked this cruise, for pointing it out to me. My next mission after boarding and taking my things to the cabin is always the same when I’m on a new ship: Go out and explore. So I walked around all the public decks, taking photos while she was mostly empty. 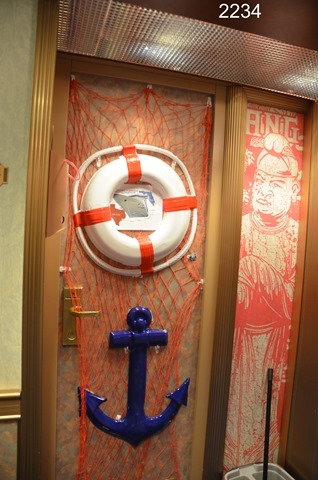 Some people said they didn’t like the dark wood and more traditional style of the ship’s decor, but I loved it. I thought it looked rich and classy. 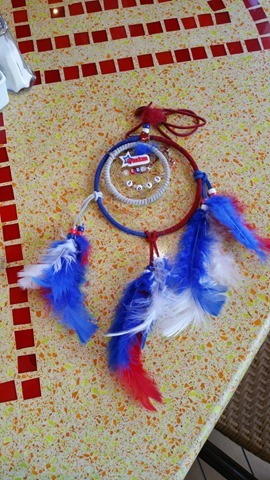 Not ostentatious like the Miracle and not subtle to the point of boring like the Breeze. For me, it was just right. 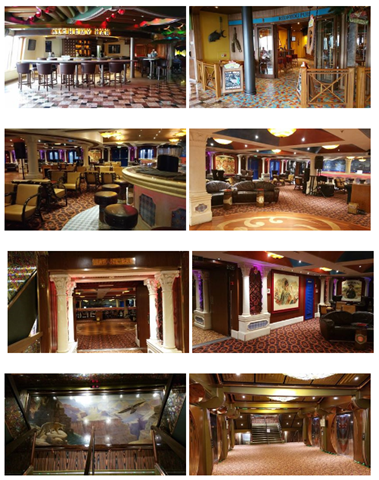 The outdoor areas were a little more generic, as they are on all ships. 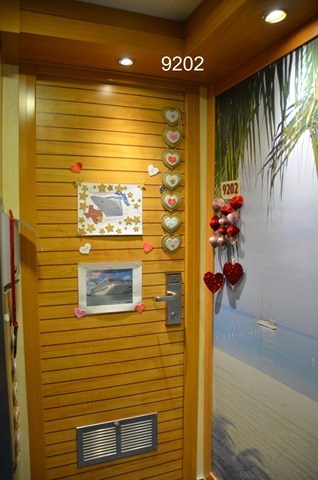 The Serenity area on Freedoms spans two decks, unlike some of the ships. 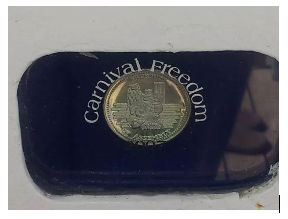 After a bit of searching, I did find the ship’s coin – but I won’t tell here where it is since I don’t want to spoil the fun for others who might want to conduct their own search. After that little “grand tour,” it was time for muster drill, and then sailaway. 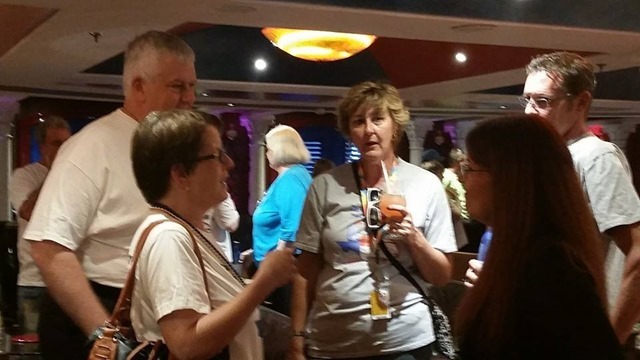 Our group had made plans to meet at the aft bar on the Lido deck at sailaway, so we headed up there, where for the first time I got to come face-to-face with so many of the wonderful people I had gotten to know on Facebook already. Some folks had come bearing wonderful gifts. 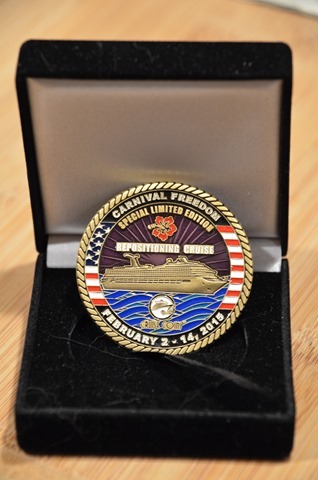 The Dreamcatcher was made by Donna Boyd, the poker chip by Rick Boyd, and Bob Burgess designed and had the incredible cruise coins (challenge coins) made and sold them at cost – wonderful tangible mementos of what was to be a fantastic experience for so many of us. 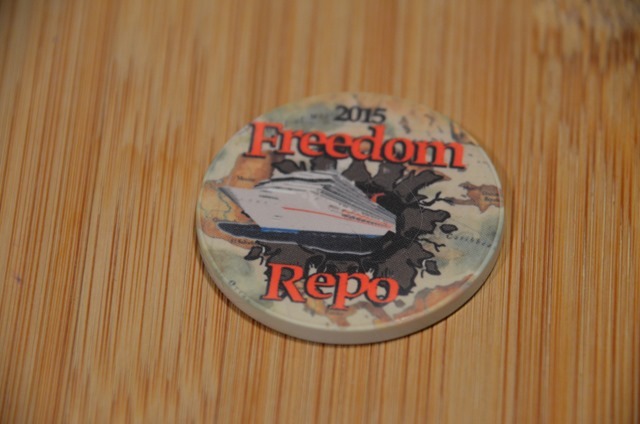 NOTE: The great souvenir poker chips that Rick designed were made by Angela Gray at Custom Cruise Wear, and the coins that Robert designed were made by www.cruisecoins.com. The sailaway party was where I got my first introduction to the infamous tiramisu martini, thanks to Lola Kneip and Sam Das – and thus began two dear friendships and, I fear, a life-long love of the lethally delicious concoction made of Bailey’s, Kahlua, butterscotch schnapps, peach schnapps, Frangelico, Malibu rum, Amaretto, and chocolate syrup. 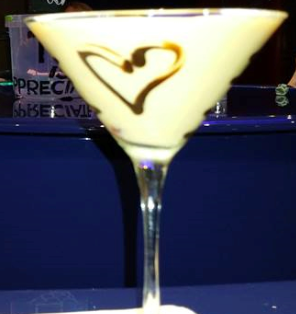 Tiramisu in a martini glass: What’s not to like? After the party was over, most of us went our separate ways for dinner that first night, not yet having formed the sub-groups that would develop naturally as we got to know each other better. 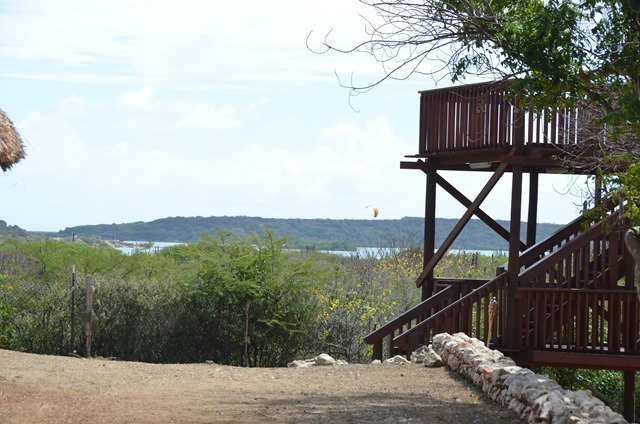 Sharon and I had Your Time Dining, and made our way to the MDR early after having had little to eat that day. The Freedom still had the “old” menus – to my delight, since there are a few favorites on them that have been dropped from the new American Table menu. 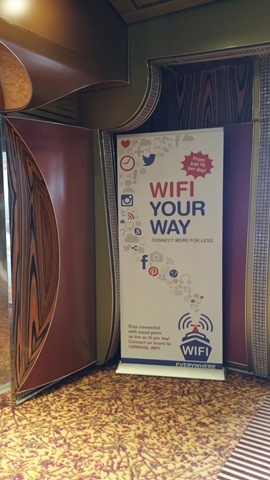 There are some things I like better about the new menus, but I was pleased as (rum) punch to know I’d be able to have my banana gateau and cappuccino pie on this cruise. 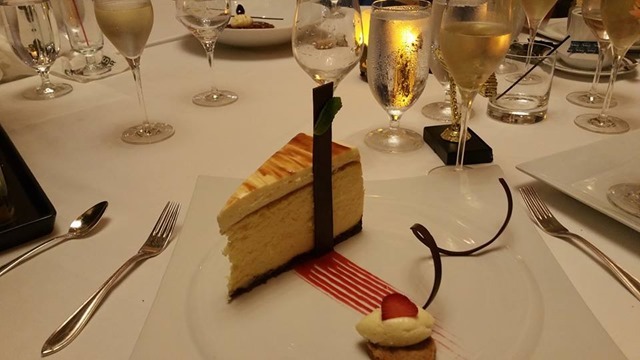 It was still early in the cruise and I was trying to be good, diet-wise, so I ordered my favorite fruit plate and the delicious low-cal orange cream cake for dessert. 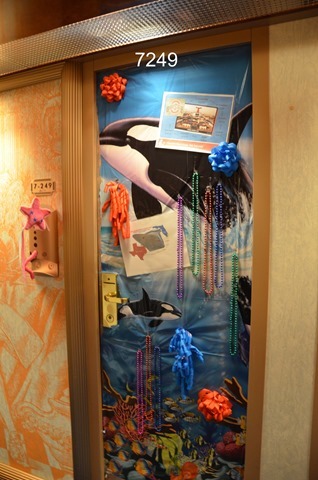 Back in the cabin, one of my first orders of business was to decorate our door – something I always do on cruises. I know some people don’t really care what type of cabin they have and only go there to shower and sleep, but I’m a “nester.” I care. 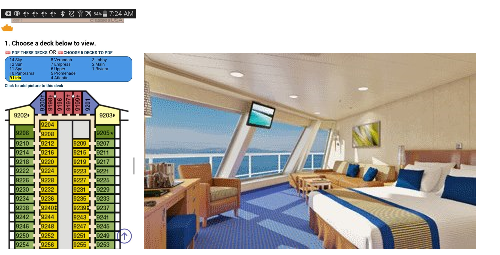 I book a year or more in advance so I can get the cabin I want, and I pick certain ships because they have the kind of cabins I prefer (i.e. 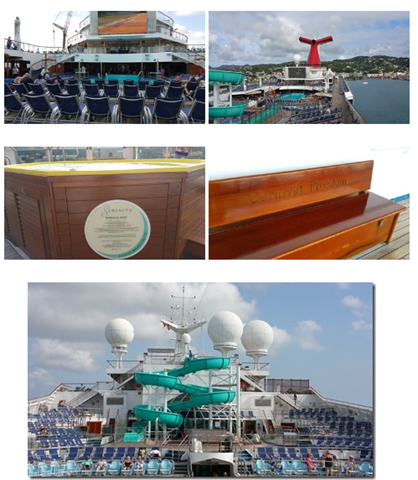 Conquest class for the grand scenic ocean view and Spirit for their oversized premium balconies). I enjoy being in the cabin, on my balcony if I have one, or looking out my windows. 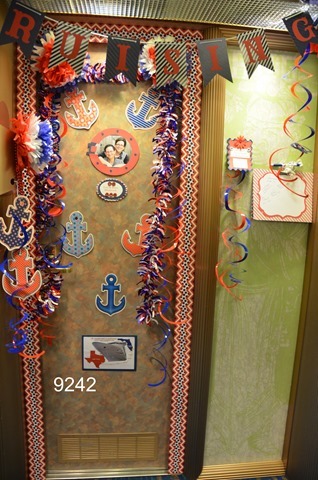 I make the cabin my “home” for the duration of the cruise, decorate it and the door, etc. 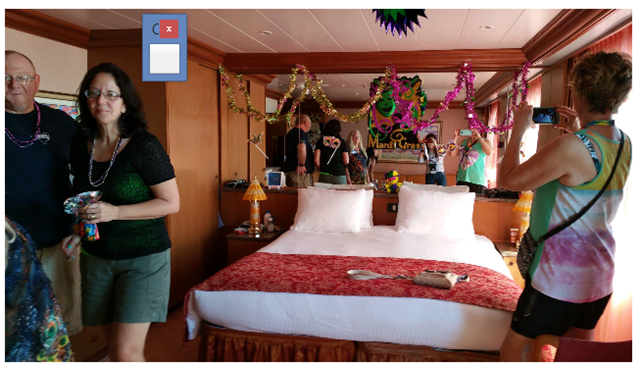 Since this was going to be a “working cruise” – no way I could take twelve days off so I would be spending a few hours writing articles on most days – I also quickly established my in-cabin workspace. This cabin was set up great for it. My little work space also served as my communications center, where I could stay in touch with Tom and what was going on back home. 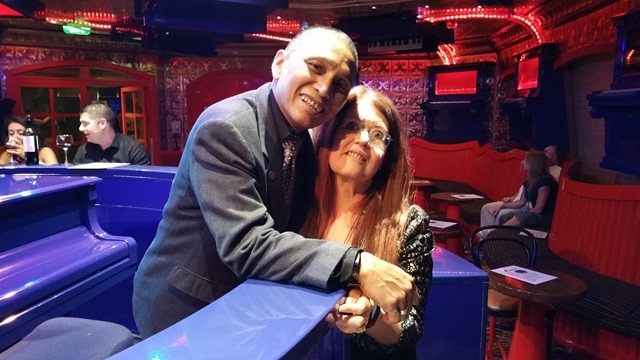 That night, I checked out most of the entertainment venues, said “hi” to about a thousand people as I walked through the ship (or at least it seemed like that many) and got to know the Freedom a little better. I had a feeling she was going to the top of my list of favorites, and I wasn’t wrong about that. 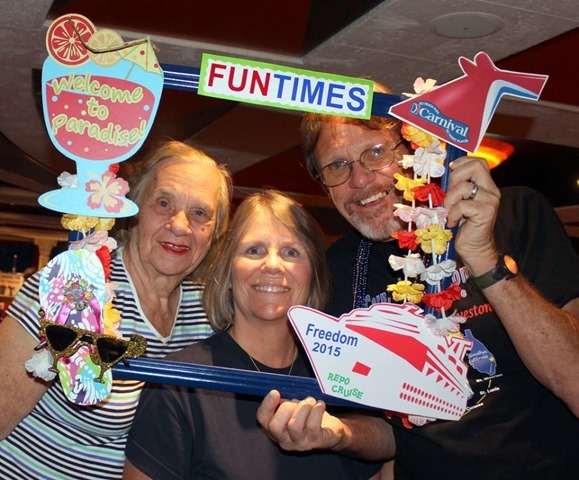 I got back to the cabin that night probably the earliest of any day on the cruise, looking forward to all of the activities that we had planned and ready to roll on this very special cruise. Of course the requisite towel animal was waiting to greet me, along with the next day’s FunTimes. 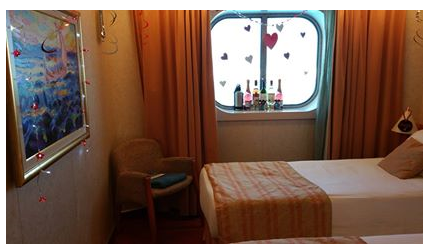 I marveled again at how lucky I had been to get such a great cabin (and at a great price), although I would find out the next day that there were even better cabins on this ship at a great value. Thanks to the great Internet technology on Freedom, I was able to Skype with Tom that night. He was still in a lot of pain from his foot, and that put a bit of a damper on things for me, but there wasn’t much I could do now. It was too late to turn back; I was at sea. 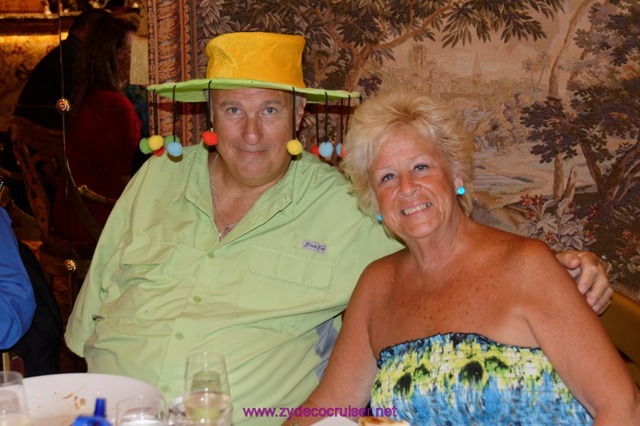 We started the cruise with two sea days in a row as we headed from Fort Lauderdale to St. Maarten, so we had plenty of time for getting acquainted with the ship and with each other. 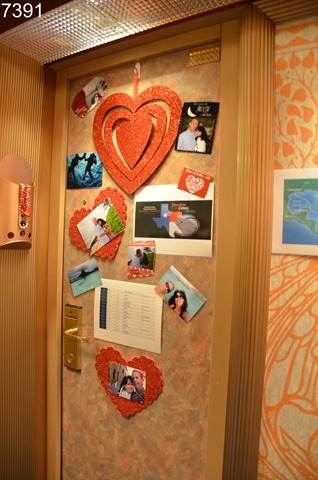 I began that first morning of Feb. 3 with coffee and fruit from room service, and then got busy preparing for our cabin crawl. 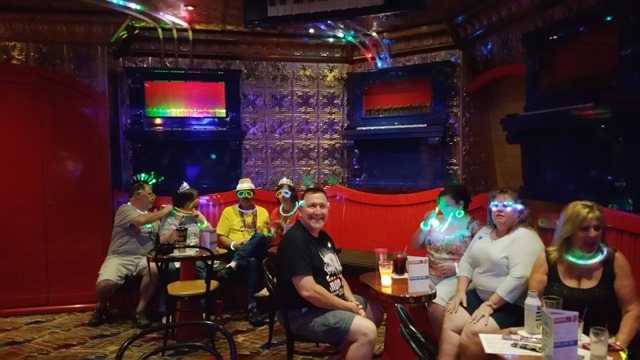 A cabin crawl is a lot of fun and gives people a chance to see different types of cabins to help in deciding what to book for their next cruise. 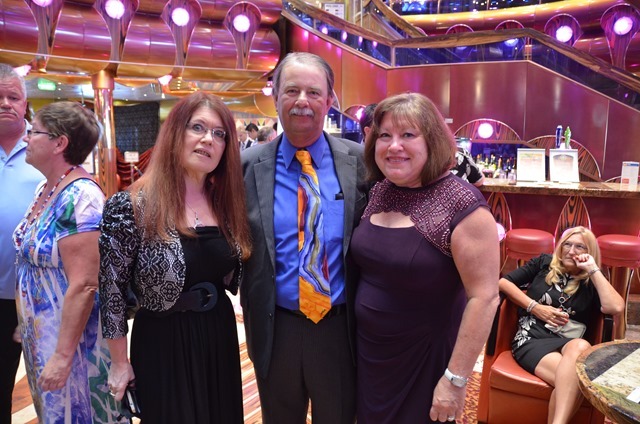 I’ve led quite a few of them now and it’s always a highlight of the cruise, especially for those new to cruising or who have always stayed in the same cabin category every time. We all gather and go from cabin to cabin together, staying maybe 10 minutes in each cabin. 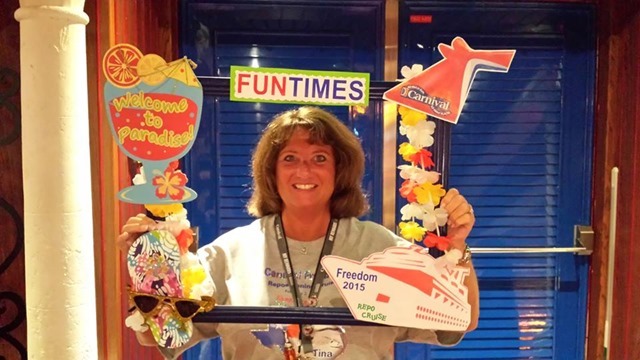 We recruit hosts with different cabin types to volunteer to show off their cabins. 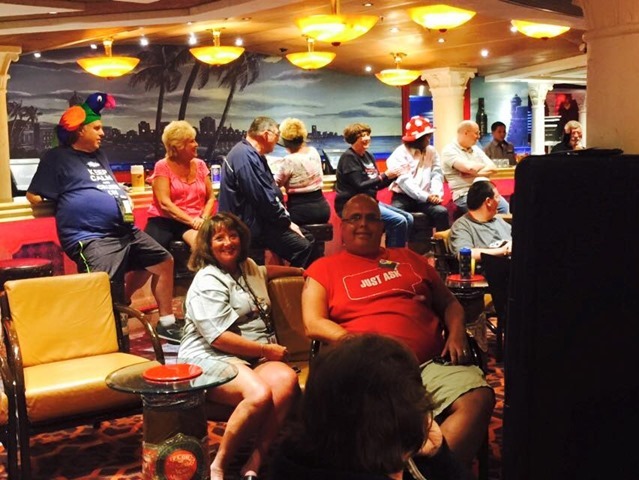 Hosts often provide goodies (food, drink), party favors, and/or some type of brief entertainment (poker draw, trivia questions with prize) for the visitors but that’s entirely up to each host. To keep the time in each cabin down, we try limit the number of crawlers to 20 – 25 or so but in this huge group, it just kept growing. We ended up dividing the crawl into two groups and Lola Kneip kindly volunteered to lead the second one on the second sea day. 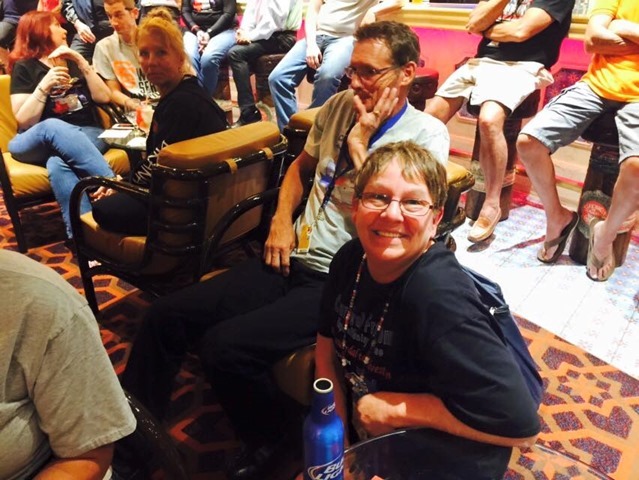 Even so, we each had over 40 people in our groups – but we were determined to make it work, and we did. 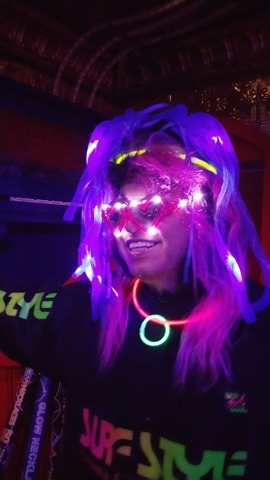 That was thanks in large part to the fantastic hosts who not only opened up their cabins to us all, but also went way above and beyond in decorating the cabins and providing food, drink and goodies for the crawlers. Our outstanding group of hosts included David and Karen Henderson, Rick and Margaret Osmon, Terry and Susan Carberry (who showed off their amazing grand scenic ocean view cabin), Pat and Mike Skinner next door in the regular scenic ocean view, Renay Gray-Strain, Tony and Tami Elam, Sam and Rose Das, Dan and George Reading, Martin and Anne Marie Stakes, Lisa Barksdale, Aaron and Kerstin Lynn (who went all out on the theme decor), Pam Wickham and Nicole Yeh, and Richard and Carol Hoefs, our host and hostess with the mostest, who laid out a magnificent spread in in the captain’s suite. Lola and Travis and Sharon and I also hosted our cabins. There might have been some others on Lola’s list that I left out and if so, I apologize. I really appreciate the efforts of all of the hosts. 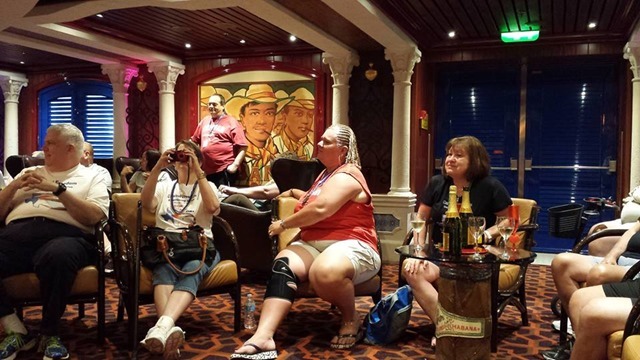 Here is another view of that grand scenic OV, which, a few days later, I managed to snag for myself for the Bloggers Cruise BC9 in February of 2016. 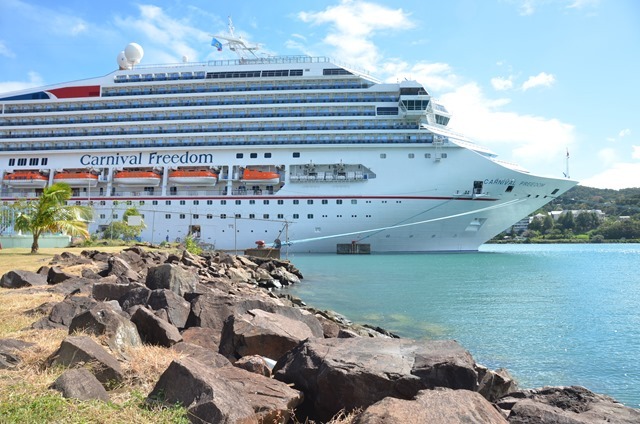 John Heald announced it while we were at sea, and thanks to the Freedom’s great Internet package, I knew about it almost immediately and put a hold on it. 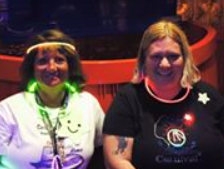 Then I camped out at the Future Cruise Desk until the person manning it (Jennie) showed up that evening, and although it took about an hour for her to figure out how to release the hold (I actually had to call my PVP and have him walk her through the process), we got it booked before someone else grabbed it. 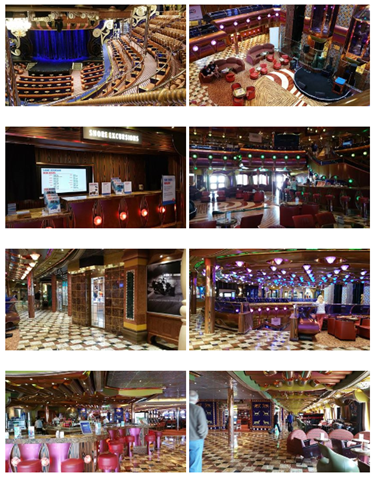 I had already booked the GSOV for my birthday cruise on Freedom in September, so I’ll get to experience this wonderful cabin not once but twice in the not-too distant future. Now back to the cabin crawl. The crawl culminated in our cabin, where those who lingered shared in the Jackson-Triggs ice wine that I had brought on board, and got to know each other a little better as we discussed our impressions of the cruise thus far. 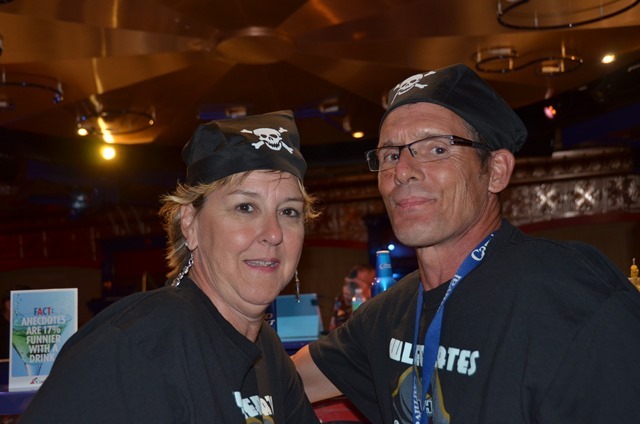 We were tired after walking all over the ship to get to all of the different cabins. A cabin crawl can be a better workout than the fitness center, and even if you don’t partake of any alcohol along the way, you might feel like crawling by the time you get to the end. The cabin crawl took up the entire afternoon, and by the time we finished up, it was time to get ready for dinner. The first sea day was also the first elegant night, so that meant getting all dressed up (it also means a longer wait to get a table). 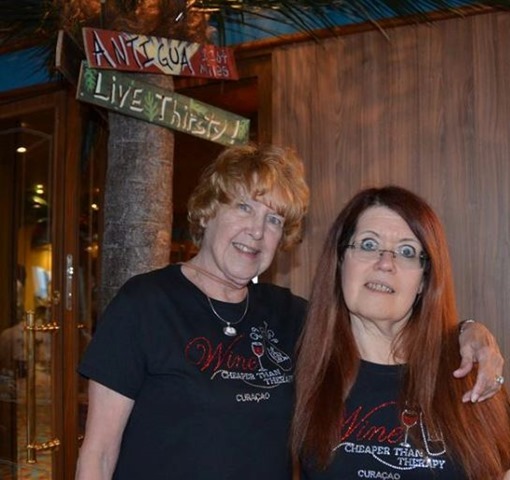 I put on my long red dress and Sharon wore a “basic black” outfit. 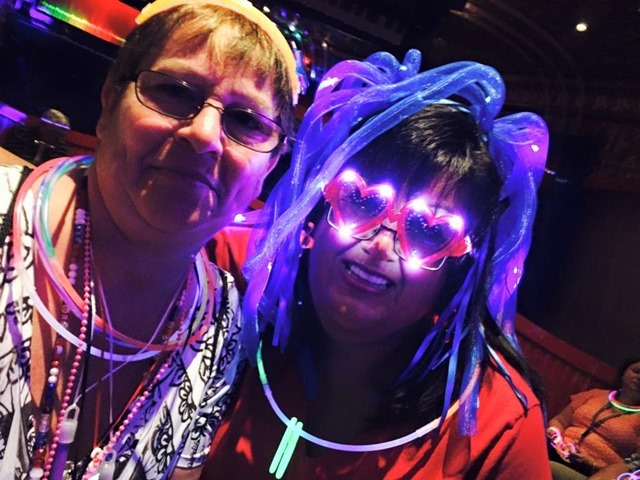 Others were dressed in their finery, too. For me, first elegant night means lobster. Sharon chose ribs (I think; I’m not much of an expert on meat since I don’t eat mammals. LOL). After dinner, there was dancing in the lobby and, of course, the million photographers trying to lure us to pose for them but we resisted (that time). 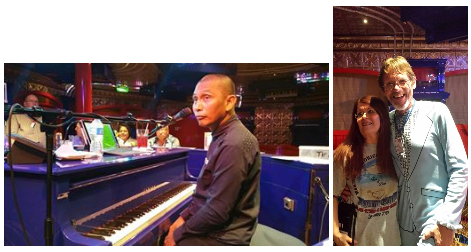 I spent the evening in the piano bar, the first of many, where I met up with some of the folks who would become life-long cruise friends and got to know Russell Agustin Estrada Villarin, a.k.a. 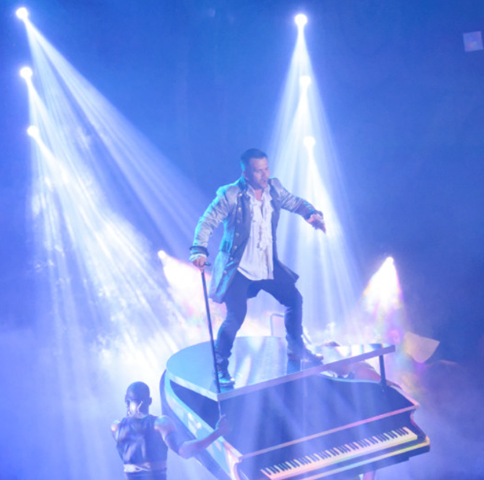 Russell Blue, who is in my opinion the best piano man in Carnival’s fleet. Tom and I had tried the piano bar on the Breeze and had been disappointed in the entertainment. The lady pianist there hadn’t been very good; she forgot the words, messed up and stopped in the middle of songs, and used way too much gratuitous profanity for our taste. We’re certainly not prudes, but she just came across as crass rather than sophisticated or funny. I wished Tom was there; I know he would have loved Russell, especially when he saw what he was using to read the music. Look closely. Yep, it’s a Microsoft Surface. 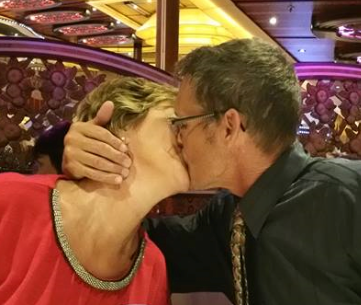 Our second full day at sea was Feb. 4 and it started a little more leisurely. 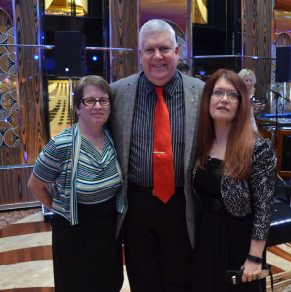 This time, we had time to go to sea day brunch, which is one of my favorite parts of cruising. I enjoy the main dining room in the mornings, when it’s generally less crowded and less frenetic than at dinner time. I especially enjoy getting a table by the window in the aft dining rooms, where I can watch the wake as I, myself, come completely awake. I ordered my usual “being good” breakfast, fruit and the egg white omelet with spinach, tomatoes, onions and Swiss cheese. After brunch, we gathered for the second cabin crawl. Although this one was Lola’s, I had volunteered to help out so I went along for the ride (again). I was glad I did, as I got to see a few new cabins and meet more new friends. 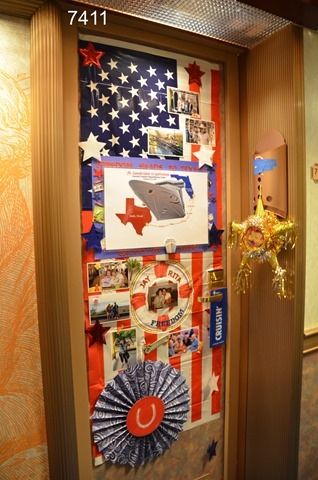 In addition to seeing the cabins, as we walked through the ship we got to see all of the decorated doors. 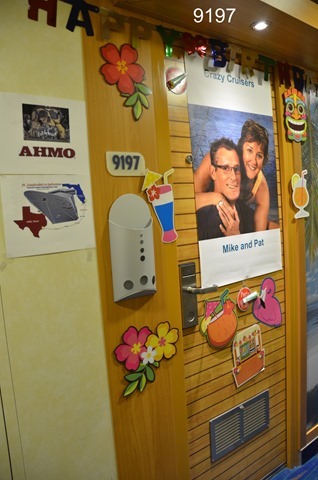 Many cruisers do this – as way of expressing themselves and introducing themselves to the 100,000+ GT world they’re going to inhabit for the next week or two, as a manifestation of nesting behavior or, on a more practical note, so they can easily find their cabins when they’re wandering the corridors after having a few too many of their favorite adult beverages. 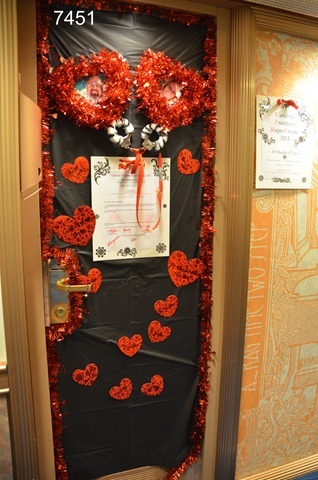 Our group had spiced things up a bit by challenging one another to a door decor contest. The doors that belonged to our group members were identified by a common sign that we had all printed out and incorporated into our design. 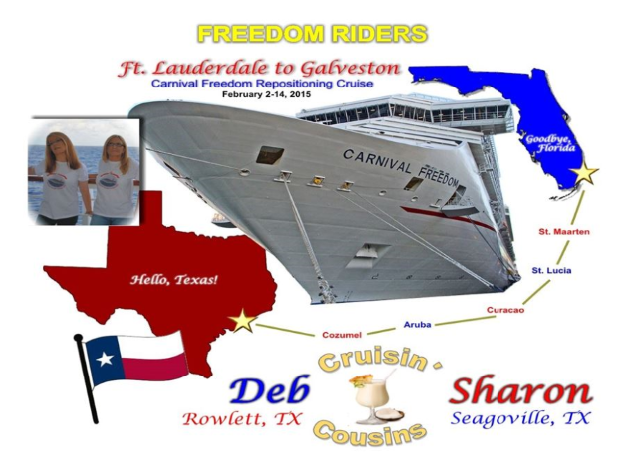 I had designed the basic “Freedom Riders” graphic and then each of us embellished it with our names, pictures and/or additional designs. 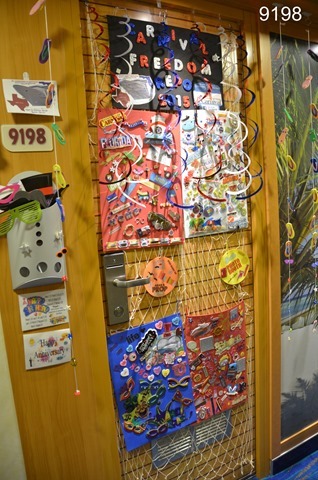 Some of the doors just used the group sign and that was it. 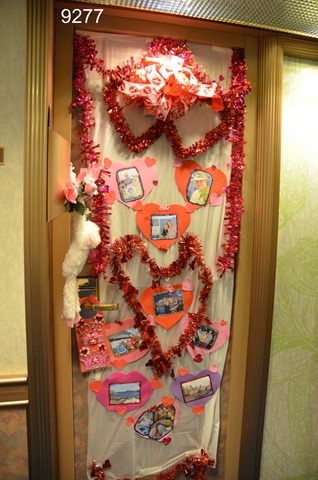 I thought I had a semi-elaborate design but some of the folks in our group really went all out. Some of those doors were absolutely incredible, and when it came time to judge them and pick the winners, the decisions didn’t come easily. 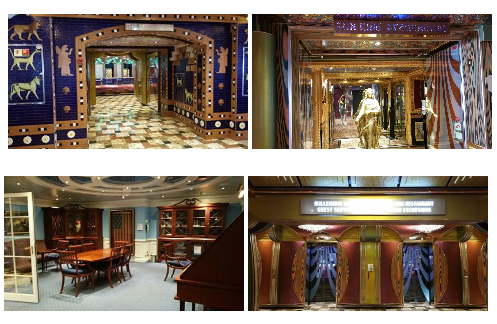 The pictures really don’t do some of these doors justice; a flat photo can’t convey the dimensionality and the totality of some of the designs; you had to be there. 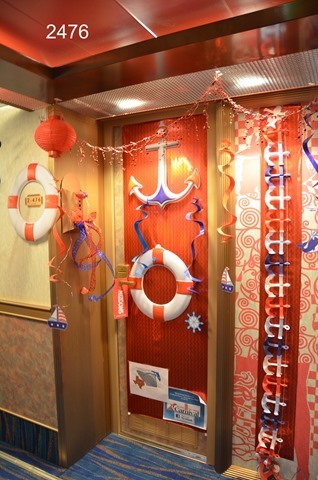 Some had bought cruise-theme party decorations and used them creatively. Others had obviously made their own from scratch. 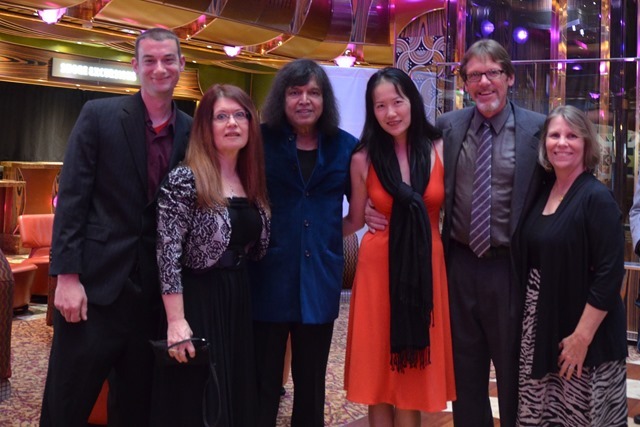 I was amazed to what what truly creative and talented people we had on this cruise. 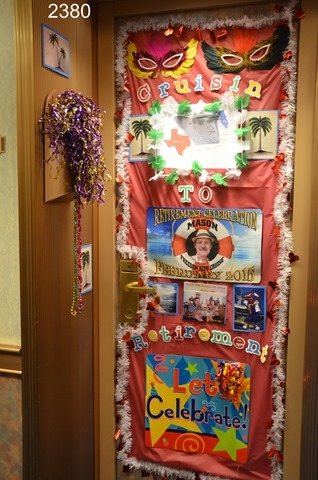 There were Valentine’s Day themes, Texas themes, Caribbean themes, special occasion (birthday or anniversary) themes, and some that didn’t really have a theme but were just designed to look pretty. 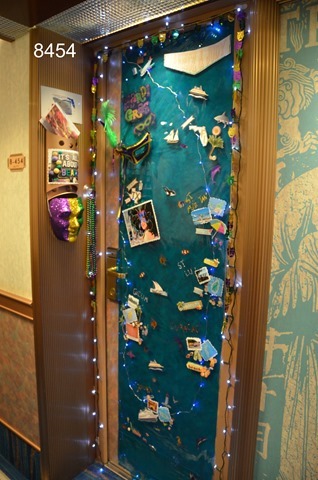 The photos here show only a few of the decorated doors from our group. 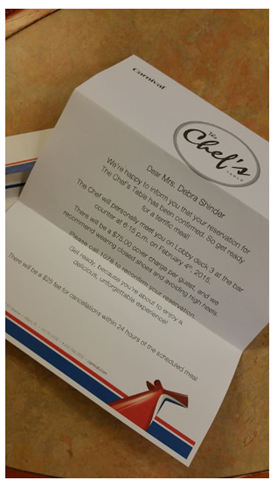 I got back to my cabin that afternoon to find my invitation to the Chef’s Table that night. I knew I’d better not grab a snack as I had planned, as the Chef’s Table is something for which you want to be nice and hungry. Anna Peck had arranged for four different groups of 12 or so each from our big Facebook group to do Chef’s Table on different nights, and I had been lucky enough to get into the first group. 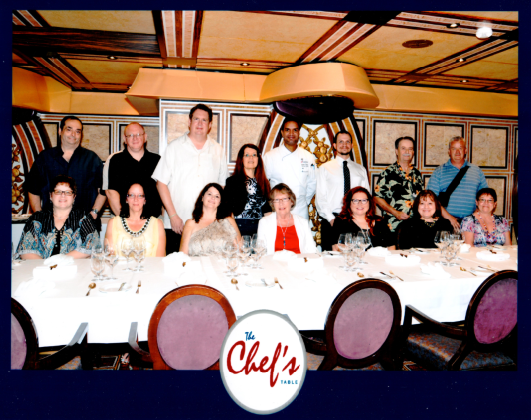 Tom and I had done the Chef’s Table on the Breeze just a couple of months before, on our anniversary cruise, so I knew exactly what to expect, and was looking forward to it. It’s a five-star restaurant equivalent experience. 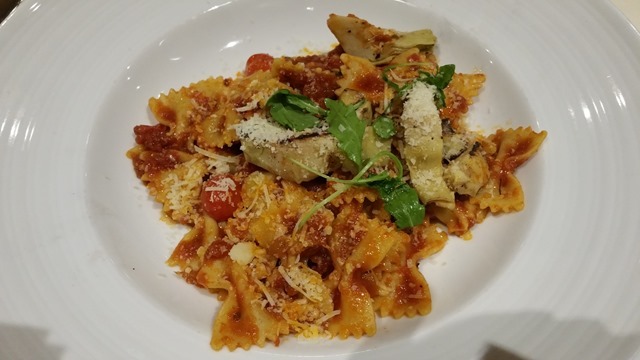 Some of the dishes are a little adventurous, but the Chef will also accommodate you if you have special dietary needs (gluten-free, diabetic, vegetarian/vegan, religious prohibitions or, like me, you don’t eat certain foods). 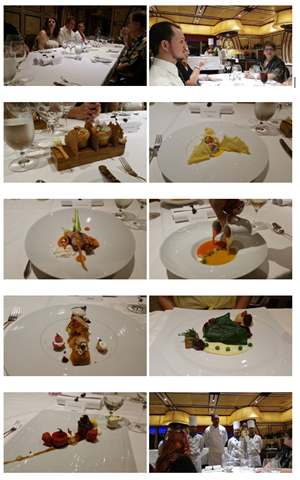 It was another fantastic experience, with each course better than the one before it and the wine just kept on flowing. On the Breeze, the Chef’s Table was held in the middle of the galley amidst all the hustle and bustle of the evening’s dinner preparations. While there is a certain authenticity to that, I prefer the way it was done on Freedom. 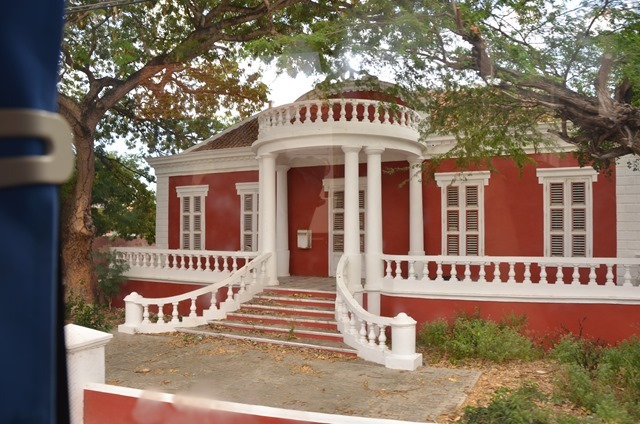 We were served in a small dining annex in front of the MDR, so it was quiet enough to be able to hear the chef as he introduced each dish, and to have conversations with each other without shouting. 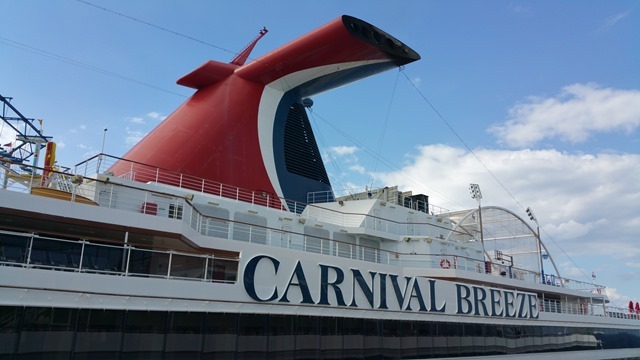 On Carnival’s new ship, the Vista, they reportedly plan to try to capture the best of both worlds by building a glass-walled room inside of the galley just for the Chef’s Table. 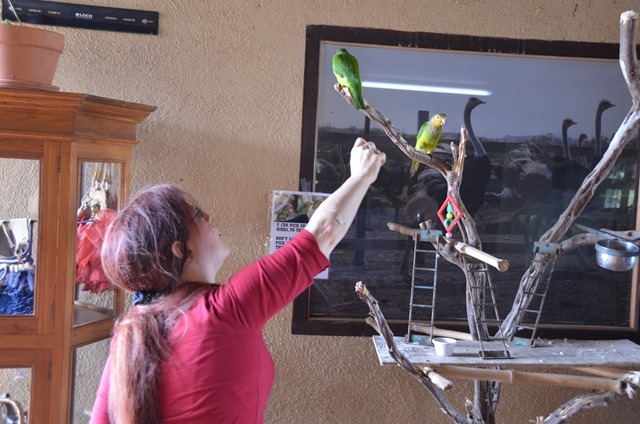 As a bonus, I met some new friends, a young couple who are animal rescuers from Houston, who weren’t part of our original Facebook group but who joined it afterward. Chef’s table is a long (three hour plus) experience and when we left, we were all full (and some of us were a little tipsy after all those magically refilling wine glasses) so I went back to the cabin to rest for an hour or so and talk with Tom and the doggies over the Internet, then went to the piano bar – but I didn’t stay long that night. 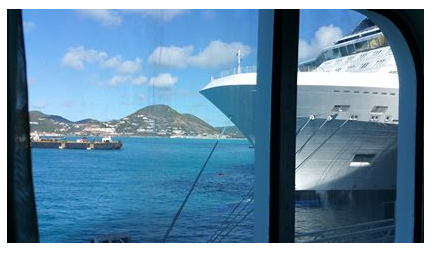 The next day was our first port day, in St. Maarten. 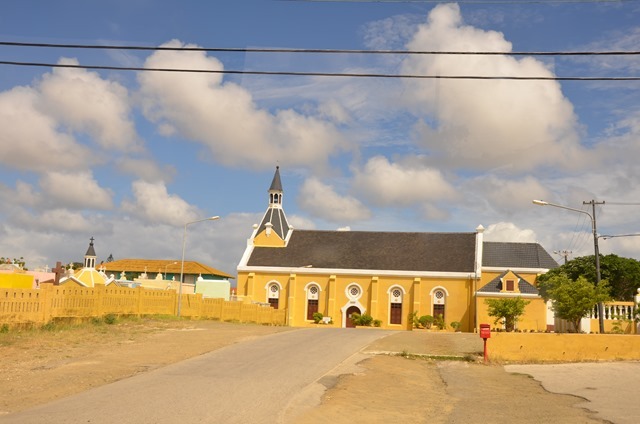 This island has two sides: St. Maarten, which belongs to the Dutch Antilles and St. Martin, which is the French side. Tom, Kniki and I spent a day there on our 20th anniversary cruise on the Breeze in December, and got to know it pretty well. 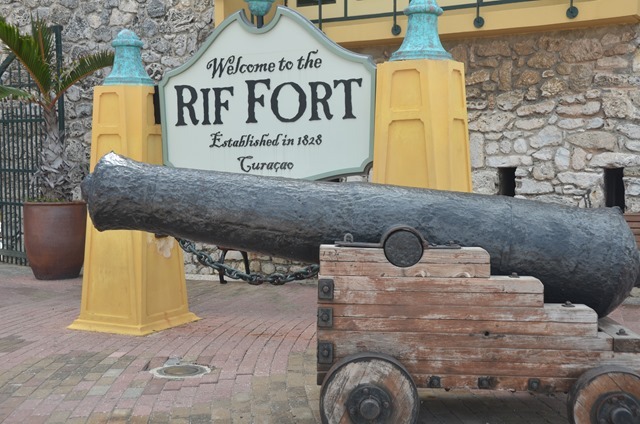 It’s one of my favorite places in the Caribbean. 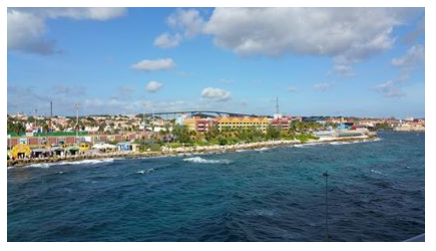 My plan was to get some work done and then take a taxi to Maho Beach to watch the planes come in, where many of my fellow cruisers were planning to be either on an excursion or on their own. It didn’t quite work out that way, as I ended up having to work pretty much the entire day because of a “pop up” article request that came in. 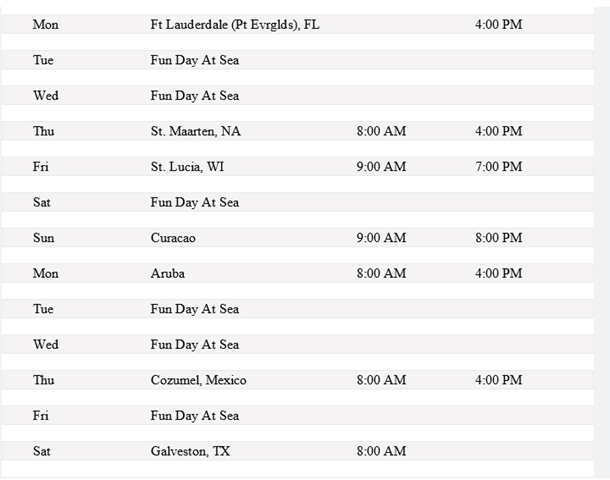 No big deal; I had been to St. Maarten before and I knew going in that I would be working on this cruise. I should mention at this point that having to work was made much, much easier by the new Internet technology that had been installed on the Freedom a few months before. At that time, it was one of only three ships that had the new, faster and more reliable packages (along with the Breeze and the Sunshine). 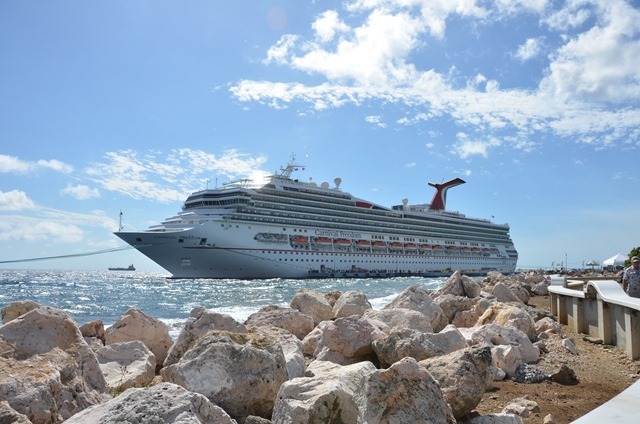 Since then, it’s been expanded to several more ships – although unfortunately, it didn’t make it to the Legend for my May cruise – and according to what we’ve heard, the goal is to have it rolled out fleet-wide by the end of this year. Unlike the old tech, which is slow as molasses and for which you have to pay from 35 to 75 cents per minute depending on how many minutes you buy, the new system uses hybrid technology with land-based antennas that work together with the new satellite system and can deliver speeds comparable to a mid-level cable Internet connection (5+ Mbps down). Being in the technology industry, I probably appreciate this more than most. 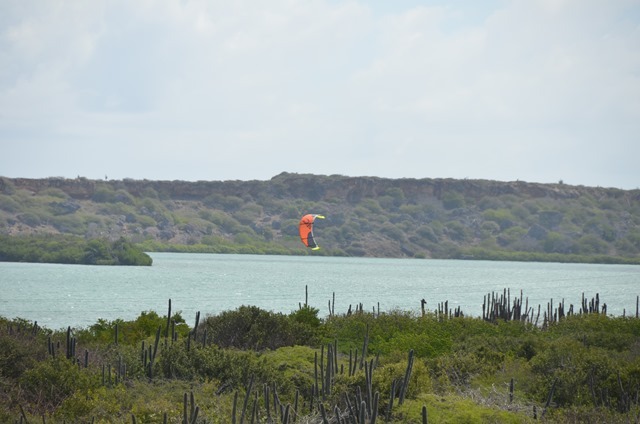 I had already experienced the new tech on the Breeze and loved it, although I hadn’t had to work on that cruise. 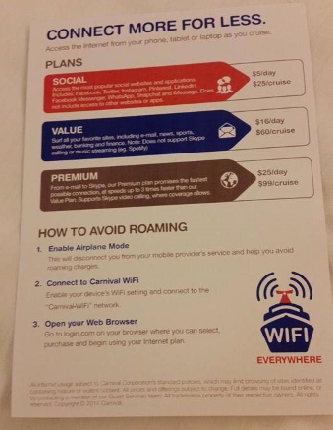 I bought the premium package for $99 and had a great connection most of the time; the only glitches came near the end of the cruise between Cozumel and Galveston. 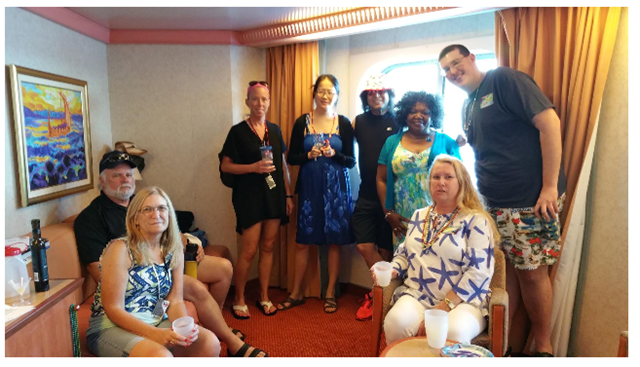 Most of the people in our group bought at least the social package, and we were all able to keep in touch with each other, find one another on the ship, make arrangements for dinner and such using Facebook Messenger. The technology really enhances the cruising experience, at least for me. 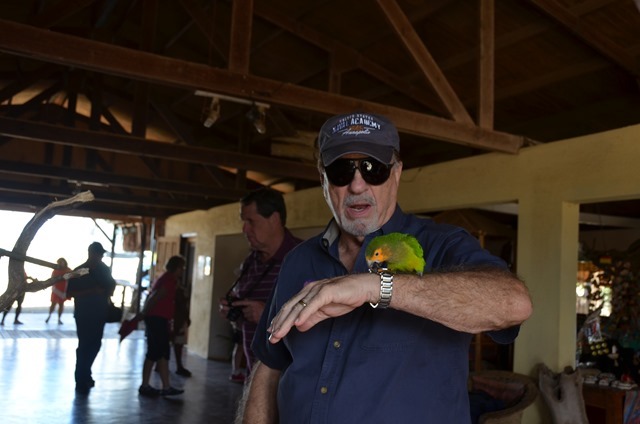 It was also invaluable for my peace of mind in that it let me keep in touch with Tom. That was especially important given his injury. And of course, it made it possible for the dogs to hear my voice and see my face and know that Mommy was still thinking about them. 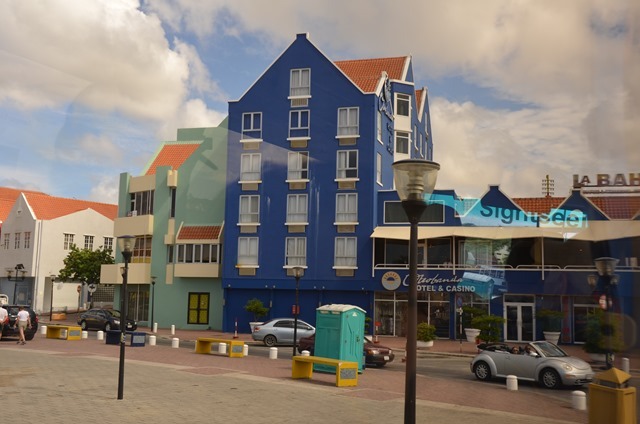 St. Maarten really is a nice place. 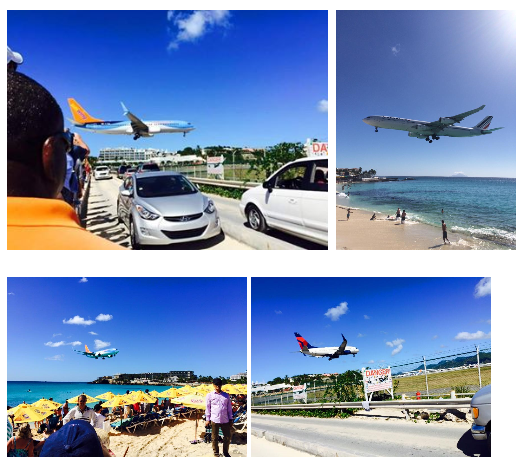 Although I didn’t get to Maho Beach this time, some of my friends brought back some great photos. 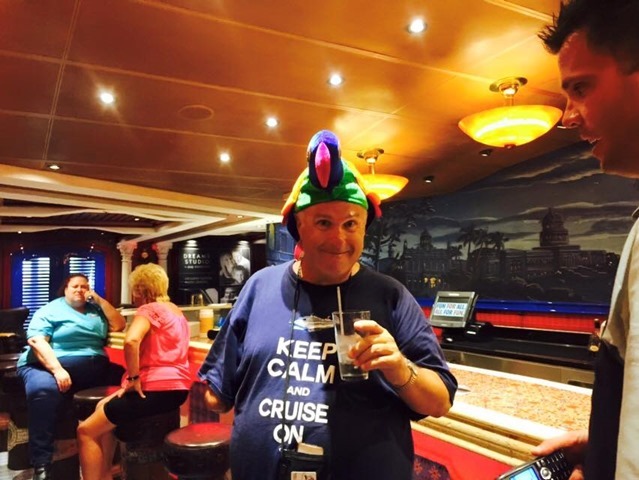 Something else that happened during my day on board at the computer: John Heald announced the next Blogger cruise, BC9, would be held on February 20, 2016 on – you guessed it – the Freedom. 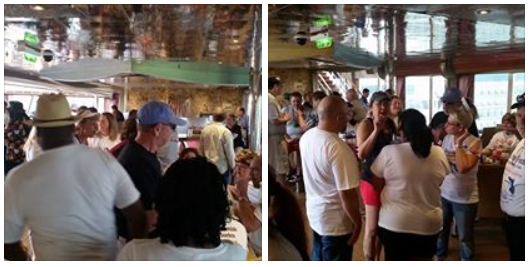 Since most of the people on the cruise were out and about in St. Maarten, many didn’t hear about it. 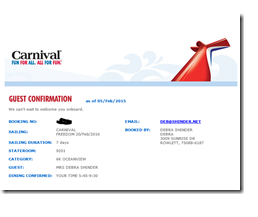 As soon as I got the news, I logged onto the Carnival web site to check for cabins. Sure enough, there was one grand scenic oceanview available. 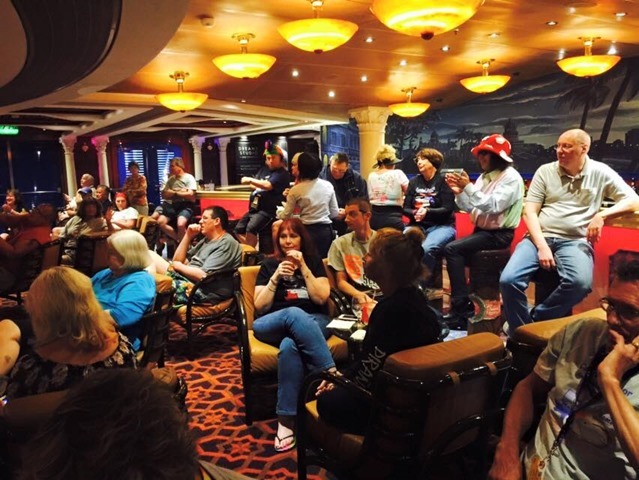 There are only two of those fantastic cabins on the ship so I knew once people found out about Blogger, it would go fast. I went (ran) upstairs to the Future Cruise Desk to book it – but the desk was unmanned; the sign said someone would be back at 5 p.m.
Well, darn. The Past Guest Party I’d been invited to was that night at 5:30 – but hey, this was more important. 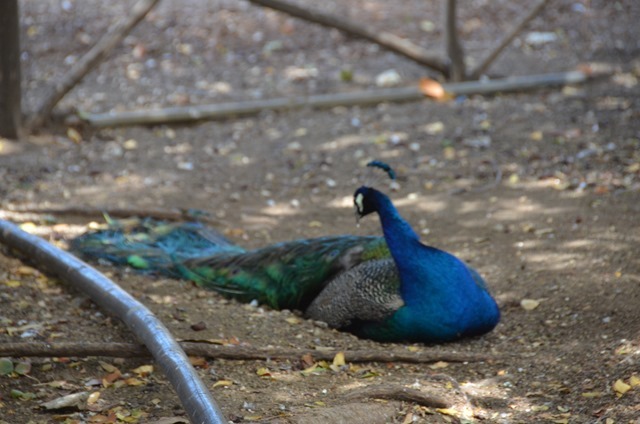 I was there, camped out, at 4:40 – but there was already one couple in front of me. 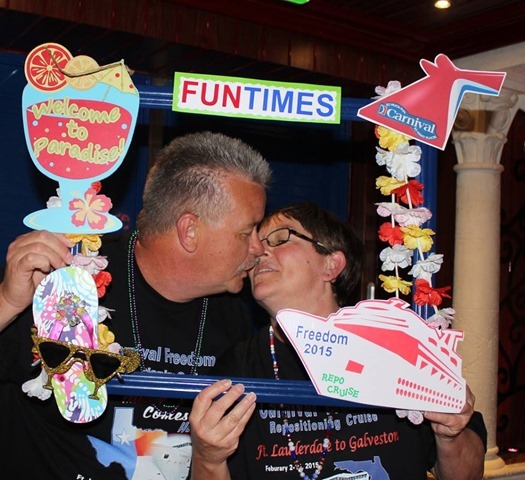 And of course, it was a couple who had no idea what cruise they wanted to book, what cabin type they wanted or anything else. I sighed inside and pasted a smile on my face as I waited, and waited, and waited. Finally they got their booking done and it was my turn. This should have been quick, since I knew exactly what I wanted and had even put a hold on it already. 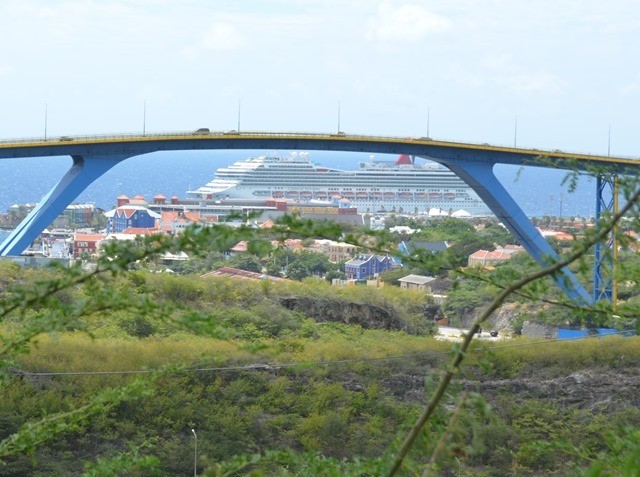 The grand scenic oceanview: Getting it for any cruise is a coup. 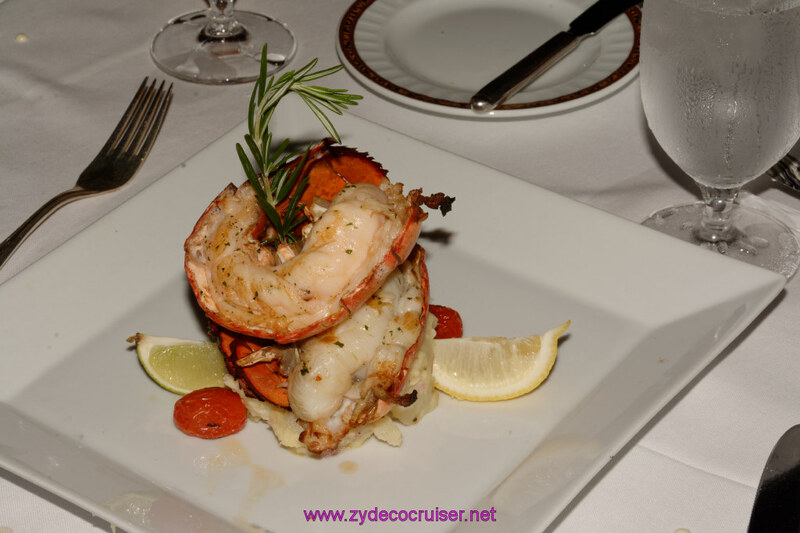 Getting it for a high profile cruise like Blogger’s is priceless. So much for “should have.” The Future Cruise lady (Jennie) was very nice but she couldn’t figure out how to release the hold on the cabin so as to book it. I could get online and complete the booking myself but then I wouldn’t get the OBC and vouchers that you get for booking onboard. She was afraid that if I cancelled the hold, someone else might grab the cabin before she got it booked and I would lose it. What to do? What I did was email my marvelous PVP, who responded within minutes. He told me what to tell her to do to release the hold. We were both still anxious that someone out there was just waiting to scoop it up as soon as it became available, but finally she took a deep breath, we both crossed our fingers and she removed the hold, then initiated the booking. And Lady Luck was smiling on me (maybe I should have gone to the casino) because it worked. 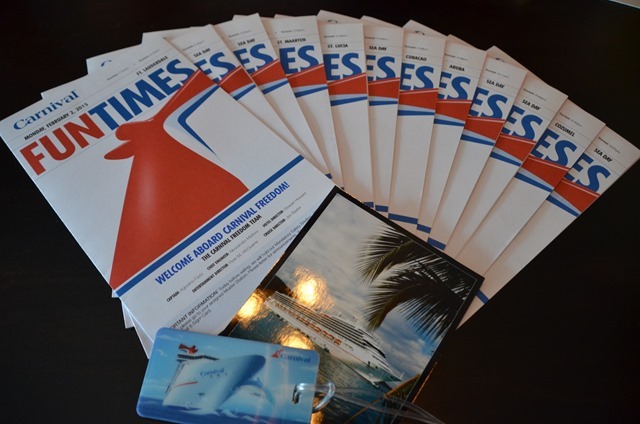 I was booked in the grand scenic oceanview for Blogger cruise and I had two OBC vouchers for my friends. Of course, by that time the Past Guest Party was over and it was time for dinner. No problem; I was on cloud nine. That evening we had another great dinner in the MDR with a couple from our group, Anna and Perry. That was followed by my nightly Skype call, which was short because Tom wasn’t feeling well and wanted to go to bed early. 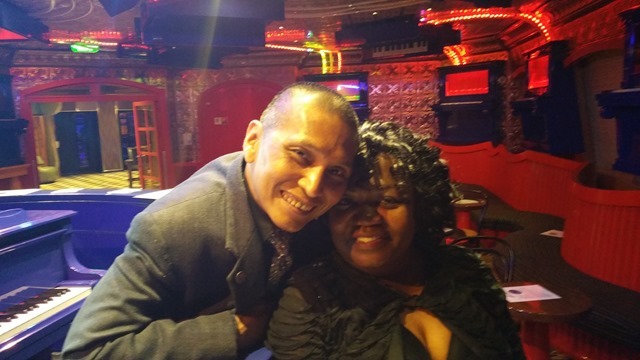 I headed off to the piano bar to meet up with friends again since I wasn’t sleepy at all. After I came back to the cabin, I was hungry but not for ice cream or pizza. Nicole had been raving about the grilled cheese sandwich with tomatoes, so I decided to give that a try – and she was right. It was delicious. 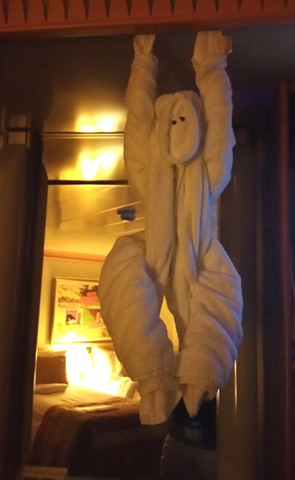 The night’s towel animal was a long-trunked elephant who never forgets. 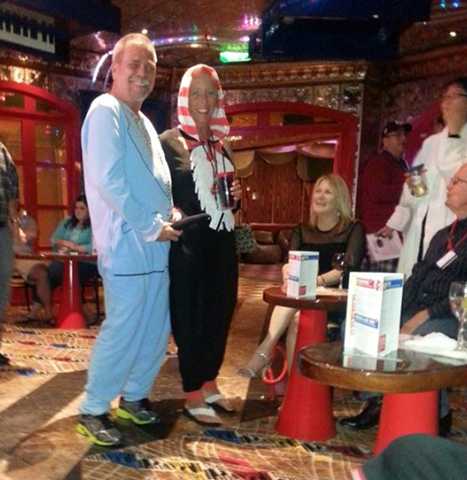 And I knew I, like that elephant, would never forget the fun that I had on this cruise. 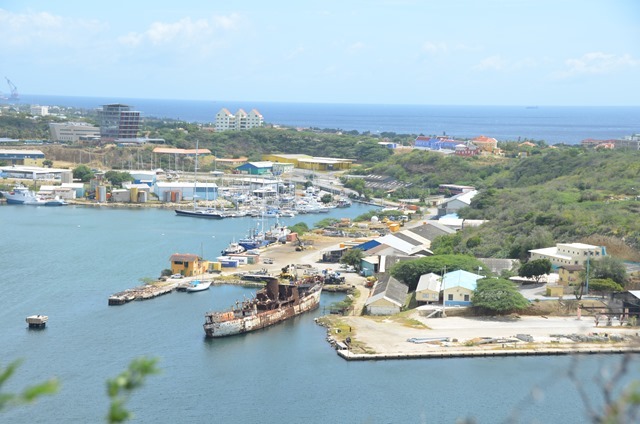 The next day, Feb 6, was another early port day, this time in St. Lucia, which is part of the West Indies. 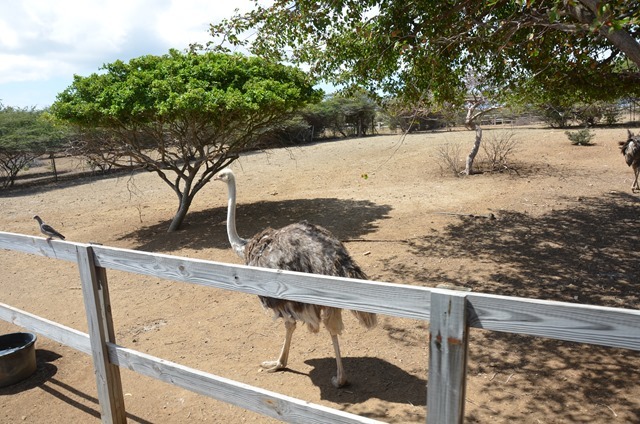 I had never been to this island before so I wanted to get off and see it, and luckily there weren’t any emergency rush articles that had to be written. 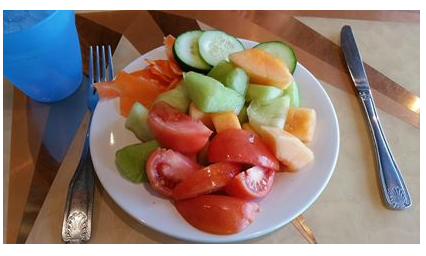 Morning began on the Lido deck with a big plate of fresh fruit and veggies. 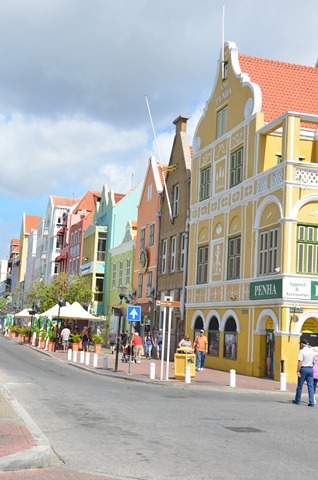 Then we got off the ship to explore, shop, walk and drink in the beauty of the Caribbean. 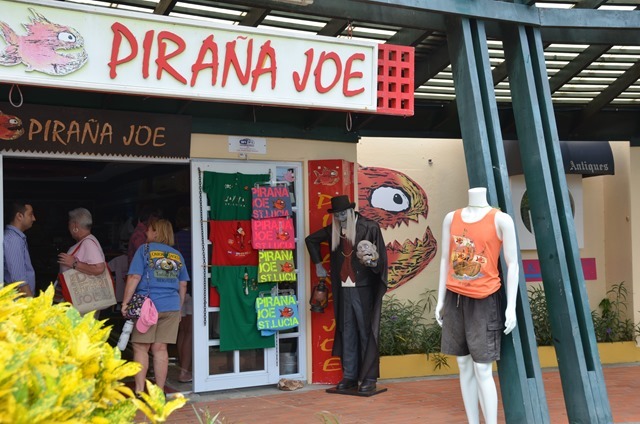 We did some shopping, found some fun souvenirs to take back home, and I also found the best-ever banana rum there, that is only made and sold in St. Lucia. I didn’t get to taste it until I was back home since the cruise line doesn’t allow you to bring the liquor you buy in port back to your cabin; they hold it until the last day of the cruise. After I tasted it, I wished I had bought more than one bottle. 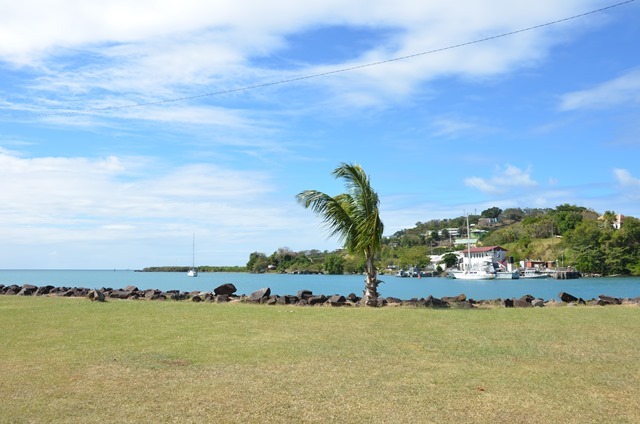 But at least I had a good reason to go back to St. Lucia again. 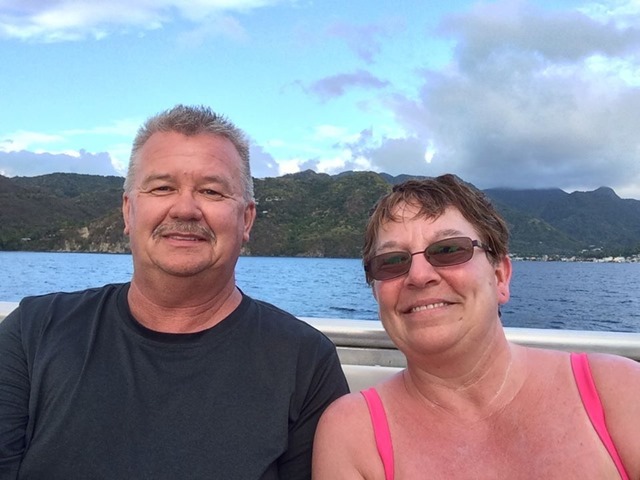 We hadn’t signed up for any excursions that day, so Sharon and I just relaxed and enjoyed the perfect weather and the deep blue ocean until it was time to go back to the ship. 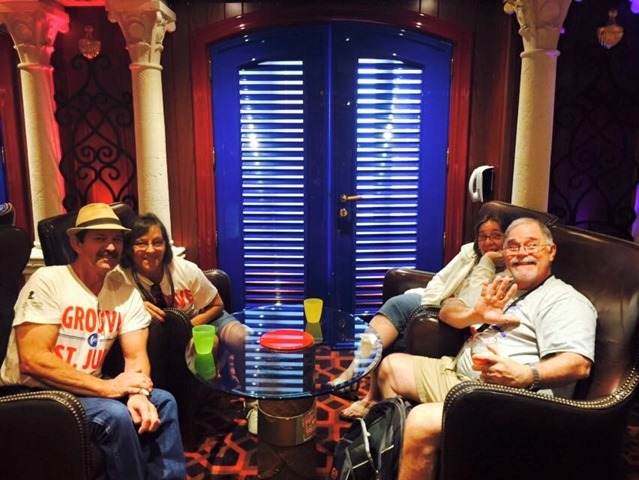 After we got back to the ship, I was hanging out in the cabin when the electricity went off. Went out in the hallway to find that it was out on the whole deck – but according to some reports, other decks had power. I was about to get ready to go up to Lido when the lights came back on. The whole outage lasted maybe 10 minutes. But I’m sure there were some cruising critics who saw it as an opportunity to demand OBC or a free dinner at the steak house for compensation. LOL. 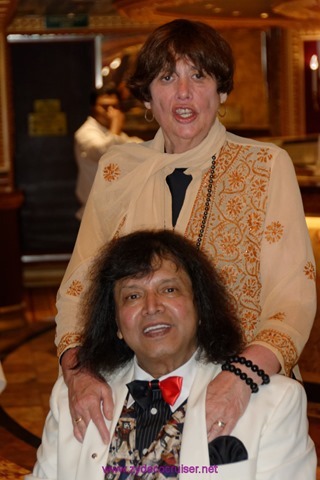 That evening at dinner, Sharon and I sat at Joey’s table again, and they were serving some new dishes. 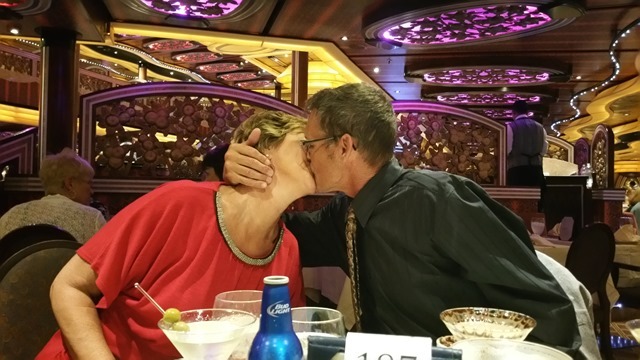 Because this was a 12 day cruise, there were some nights that had items not part of the typical 7 or 8 day menu with which I was pretty familiar. One of those was a very yummy concoction of roasted veggies wrapped in layered phyllo pouches with a delicious cream sauce. 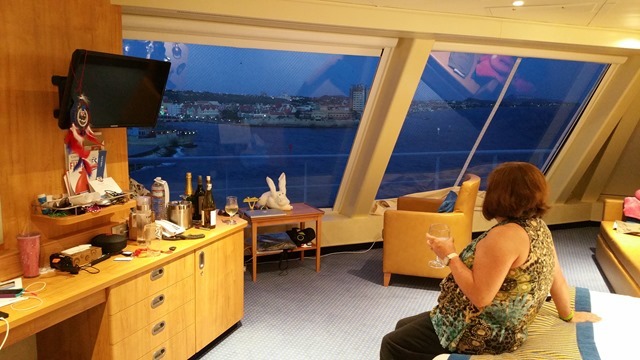 I was a happy camper, and happy to see the bunny that was waiting for me in my cabin with the FunTimes for our next sea day. I skipped the piano bar that evening, talked to Tom and the dogs for a bit longer, and got some reading done. 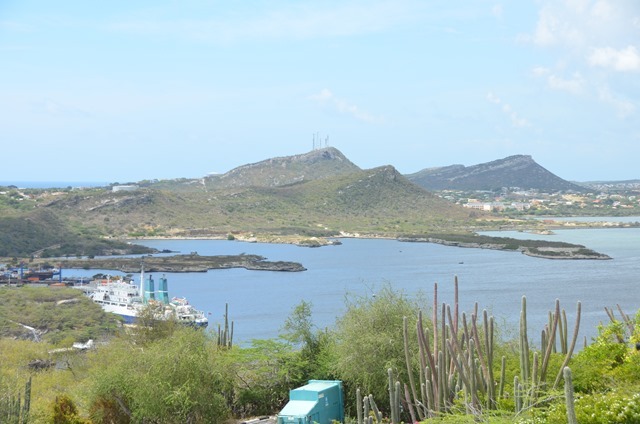 It’s quite a distance from St. Maarten to Curacao, our next port, so the sixth day was a sea day and we started it in the MDR again, this time enjoying sea day brunch with a big table full of people from our Facebook group. The company made the food taste even better than it already did. 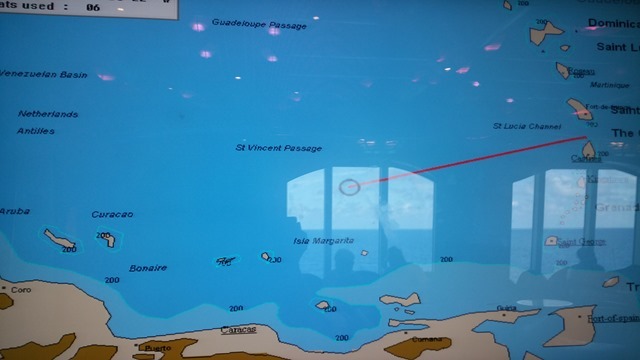 I spent a little time just chillin’ in the cabin after brunch, as we chugged along toward the ABC islands (Aruba, Bonaire and Curacao). That evening, I was in for a treat. 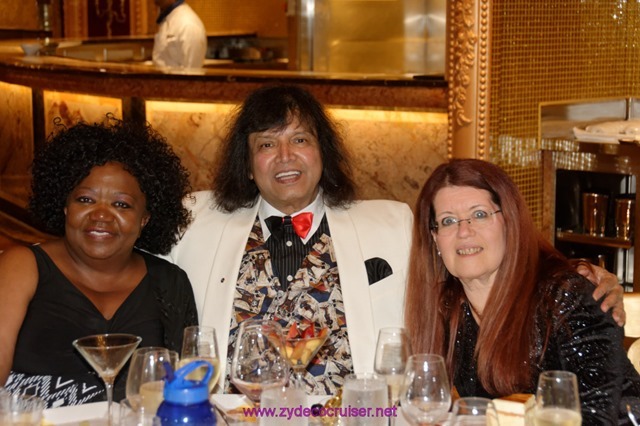 I had somehow ended up being good friends with a large number of the most elite cruisers on this sailing – those with Diamond status (which signifies having cruised more than 200 days with Carnival). 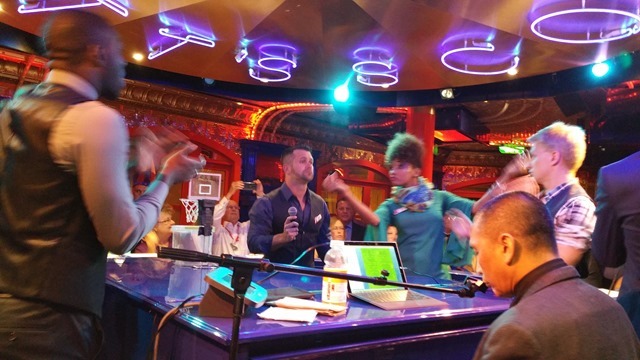 On each cruise, there is a special party for those folks, where the cruise line shows its appreciation for their continued loyalty. 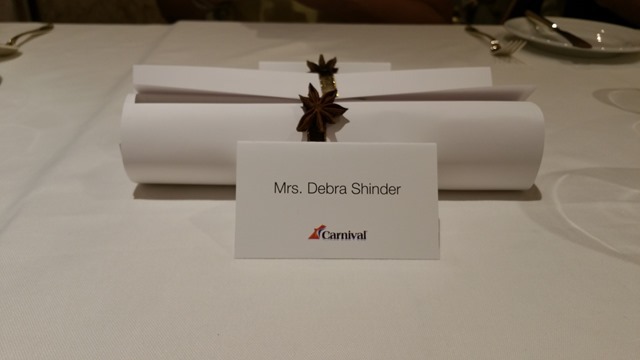 Well, I was (and still am) a long way from Diamond – although I’ve booked a whole slew of cruises in an attempt to catch up – but this time I got lucky. One of those friends had a husband who wasn’t interested in attending the party, so she took me instead. 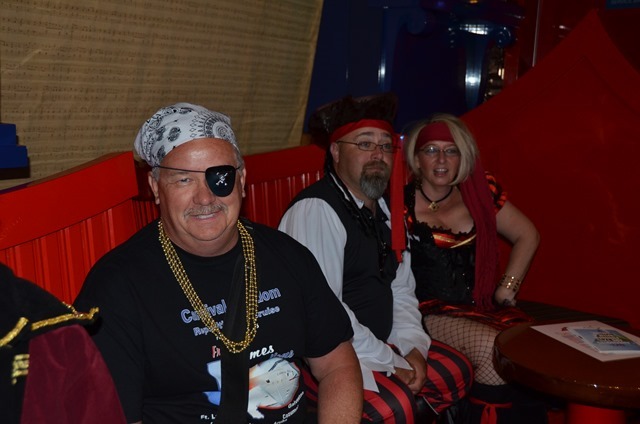 There were appetizers, entertainment, some great people, and we got to have our picture taken with the captain. It was a really great time. At least, the part of it that I remember was. You see, I’m not used to drinking very much. 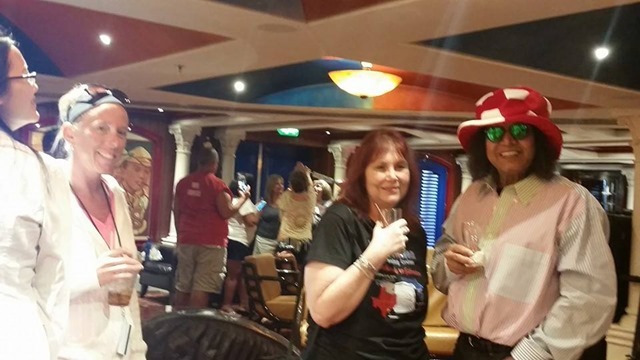 I’m not one of those cruisers who benefits from the “all you can drink up to fifteen per day for $500 deal.” I like to have one, maybe two alcoholic beverages per evening on a cruise, and that feels like a lot to me since my usual quota at home is more like one or two per month. So I don’t hold my liquor very well. 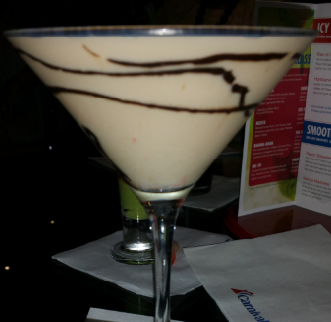 Well, as mentioned earlier, Lola had introduced me to a brand new and very delicious drink: the tiramisu martini. And at the Diamond party, the drinks were free – and they kept them coming (mostly because Lola kept calling them over for refills). I actually only had three, but that was one more than I intended to have, and I hadn’t eaten anything except an egg white omelet many hours before at brunch. The experience did inspire me to write a song. last round that Sam bought. it’s my own damn fault. Somehow or another, with a little help from my friends, I made it to the MDR for dinner after the party, but that part is a little fuzzy. I don’t remember waiting in line, although according to all reports we had a fairly long wait. I do remember ordering the black bean enchiladas, and I remember having the tiramisu for dessert, which seemed like an uncanny coincidence. Actually, by the time dinner was over, the effect had pretty much worn off. I went back to the cabin to change clothes and try to call Tom (wasn’t able to get him). 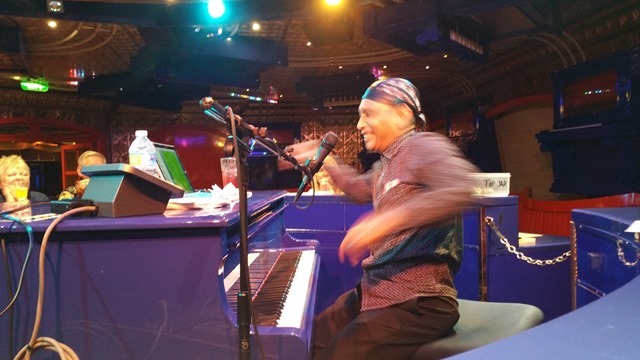 After several tries, I sent email and then my feet automatically took me to the piano bar. That night was our “Tacky Tourist” theme party, and there were some interesting outfits on display (and lots of Hawaiian shirts). 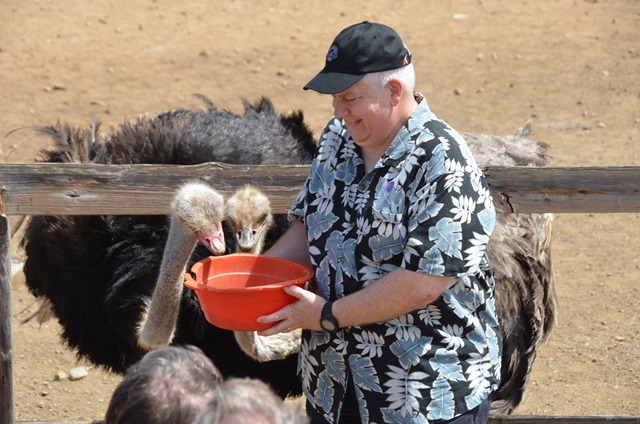 I wasn’t really into the tacky tourist thing and was a little worried about not hearing from Tom so I didn’t stay long. In addition, we had another really great port coming up the next morning. 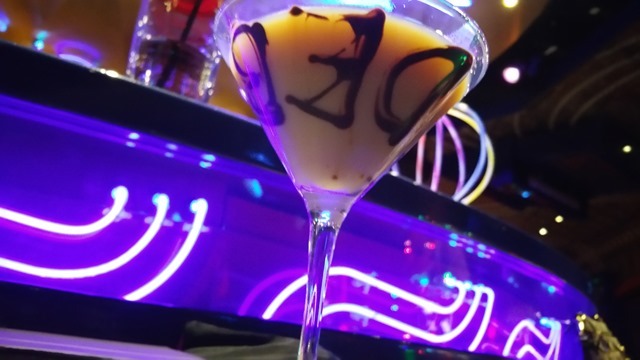 I think I got more sleep that night than any other night of the cruise, so I guess Lola’s tiramisu martinis were good for something. I had been looking forward to this port for a number of reasons. 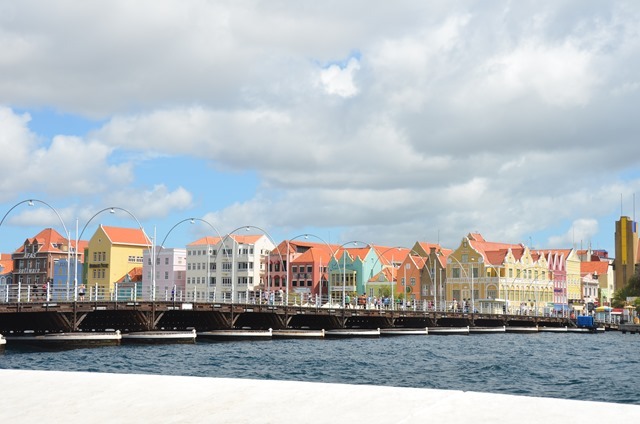 First, I had seen photos of the colorful buildings along the shore and was curious to see them for myself. Second, it was one of those “exotic” ports that Carnival doesn’t go to often, so I might not have this chance again soon. 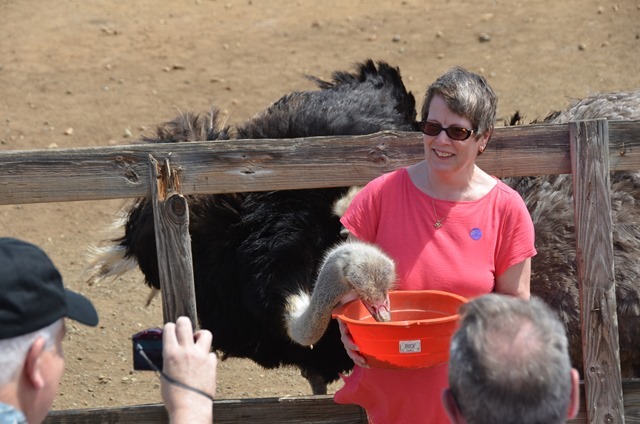 And finally, I had booked an excursion to the ostrich farm with Carol and Richard Hoefs. 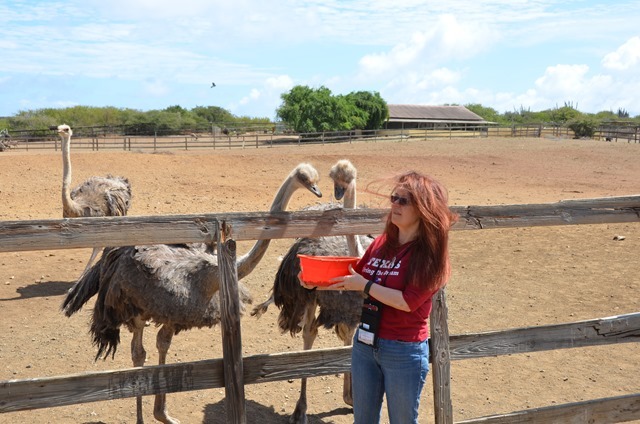 I love birds and I love the Hoefs, so I expected it to be a very fun day. I wasn’t disappointed. I was up early to get ready for the excursion and happy to see my first glimpse of the city. 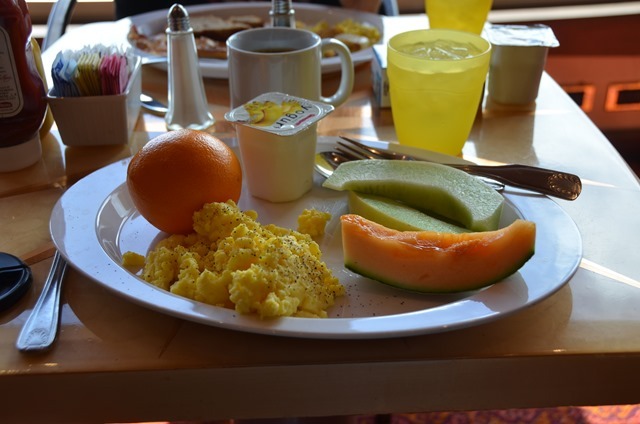 Before leaving the ship, I started things off with a healthy breakfast. 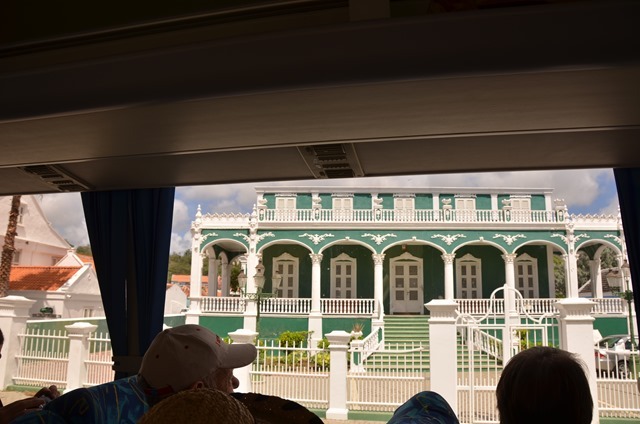 The tour began with a bus ride through the city of Willemstad, the capital of Curacao, where we got to see many more colorful examples of Dutch architecture. 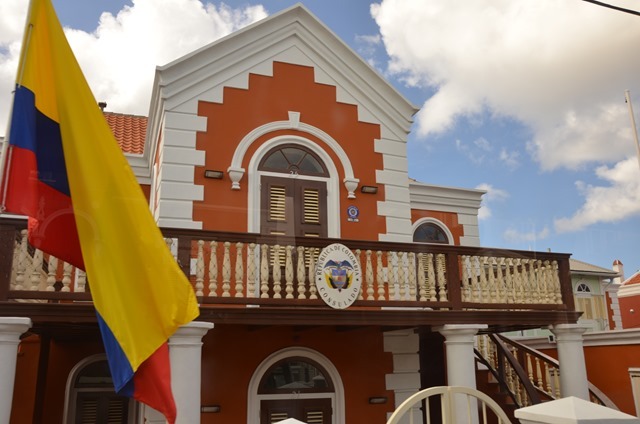 Curacao is another island that’s part of the Kingdom of the Netherlands. 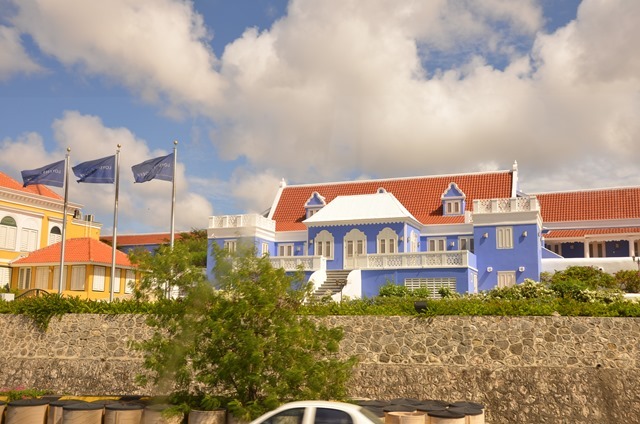 The buildings were originally painted white, but the Dutch governor believed the reflection of the sun on the white buildings caused his headaches and decreed that buildings had to be painted other colors; this accounts for the vivid coloration along the shore and throughout the city. It’s a fascinating place for anyone who’s interested in architecture. Even the bridge is painted a bright blue. 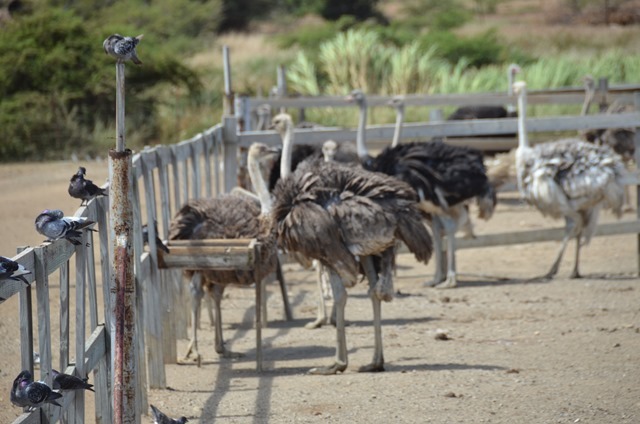 Our first stop was the ostrich farm. 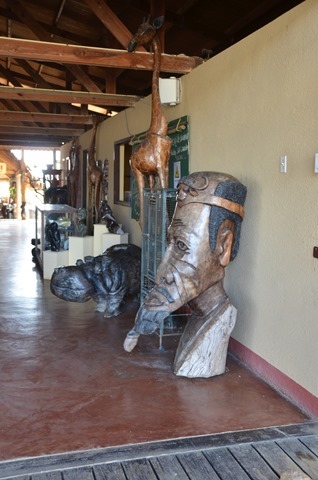 When we arrived, we had some time to check out the exhibits, gift shop and restaurant before embarking on a tour of the farm. 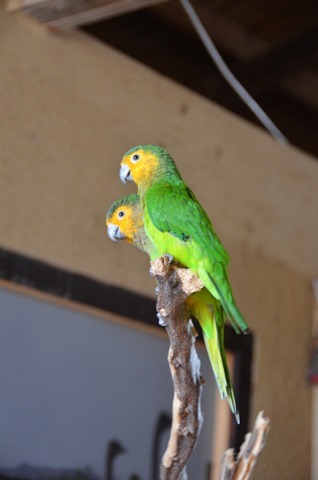 A pair of tame parrots provided entertainment. 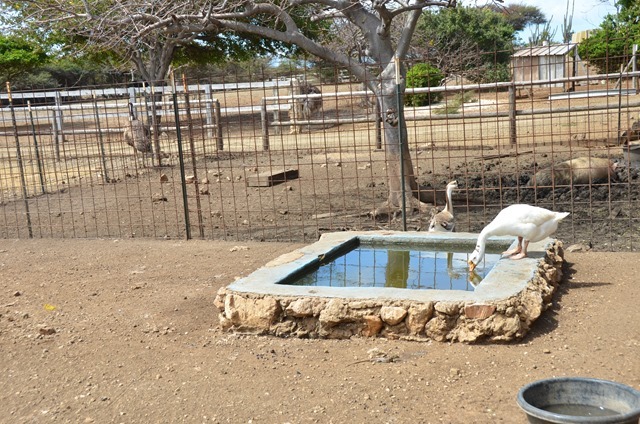 The farm was in an isolated, rural area that seemed far from the hustle and bustle of the port and city. 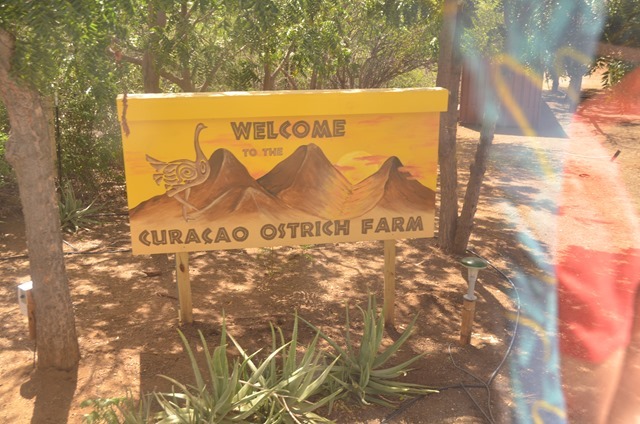 Finally we were called to get on a truck, and our guide told us all about the farm, the ostriches and the other animals that live there. 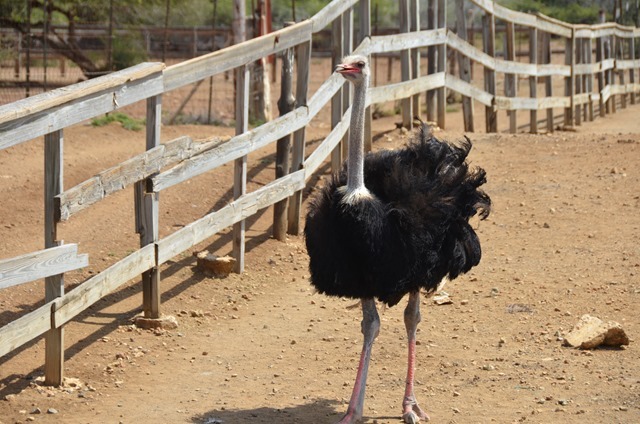 We moved from pen to pen and the guide entertained us with stories about the different ostriches and their unique individual personalities. 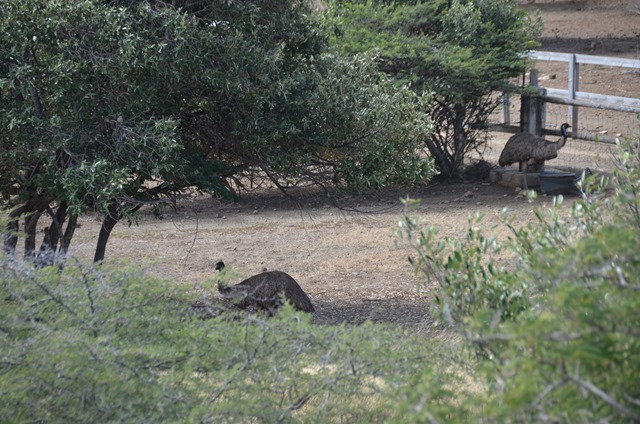 We learned to distinguish the males from females and the juveniles from adults. 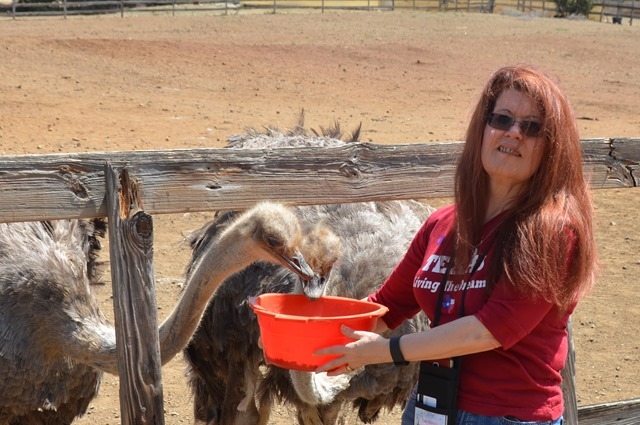 We got to feed the ostriches, who sometimes got a bit overly eager for their snacks. 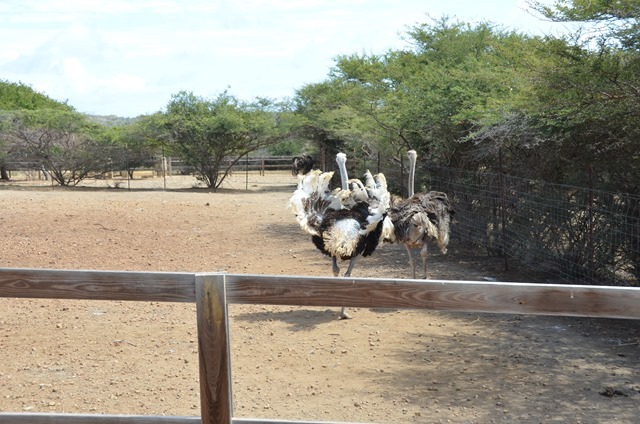 We learned about the ostrich mating dance that the male performs to win over the female – or in response to someone he perceives to be a rival (who doesn’t necessarily have to be an ostrich). 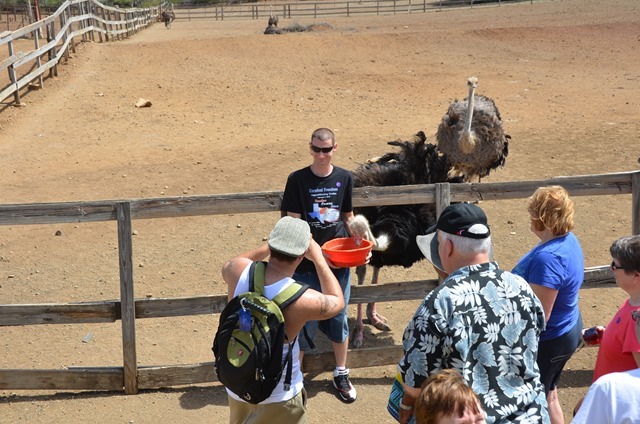 One fellow put on quite a show when the guide apparently made him think he was about to lose his lady to a human suitor. 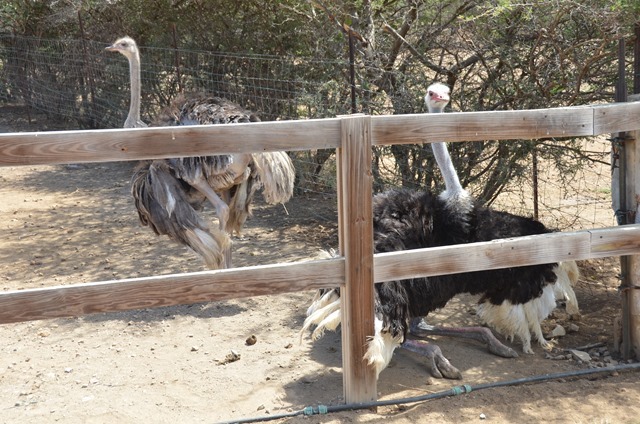 Luckily for all concerned, the ostrich got the girl and they strolled off into the sunset together. 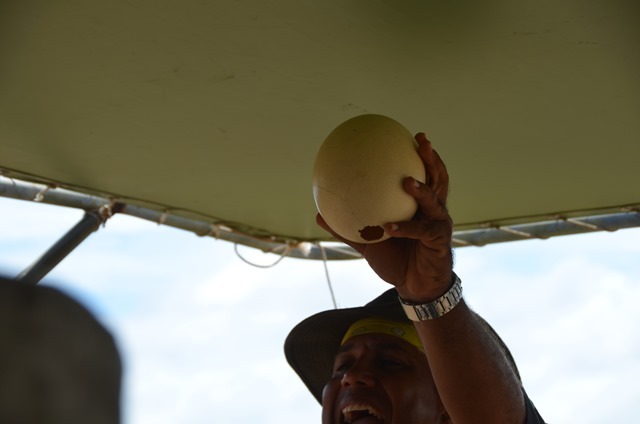 We got to see ostrich eggs – one of which would make a heck of an omelette in the MDR – and even stand on one, proving how strong they are. 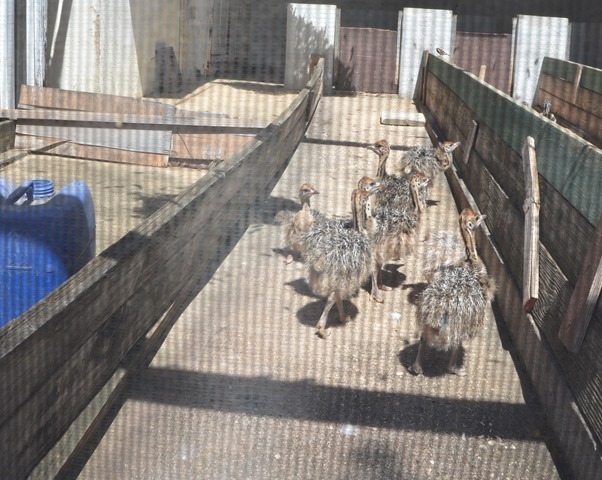 We also got to see the ostrich chicks – who gave no indication that they would grow up to be such big birds. After the tour, we were hot and sweaty, but took some time to have a cold drink and ice cream bars before we piled back onto the bus for more sight-seeing. 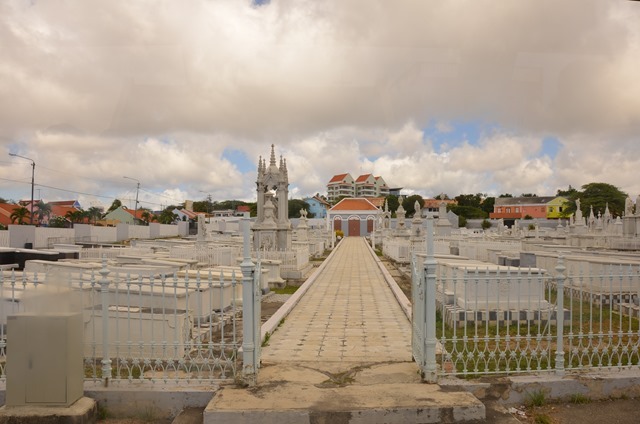 We saw the cemetery, a great view of the Freedom on the other side of the main bridge, and the harbor. 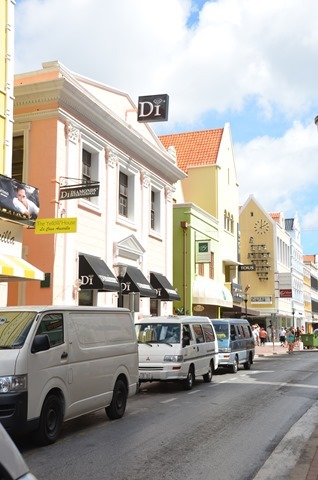 Then we headed to the downtown shopping area where those who wanted to walk back to the ship could get off and spend some time souvenir-hunting (which I did). 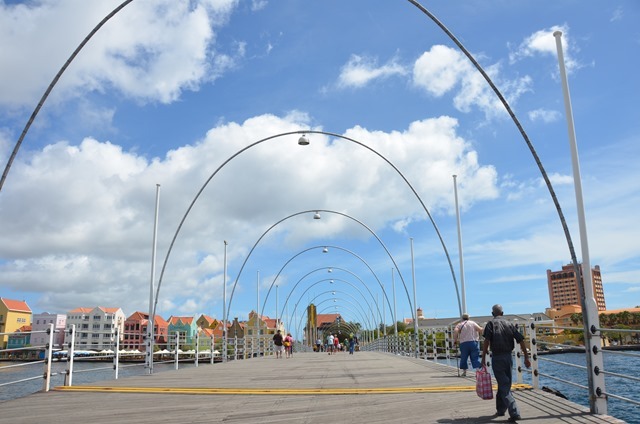 I crossed the floating bridge to check out the downtown streets. There I met up with Lola and Travis, who were were doing some shopping. We bought some things and then took the ferry back across the water to the port. 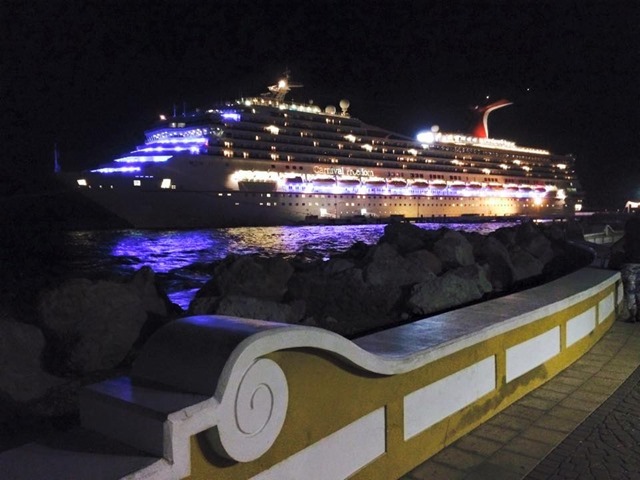 I got a great shot of our ship on the way “home,” and a friend captured the same view after dark. It was a full and fun day, but it wasn’t over yet. 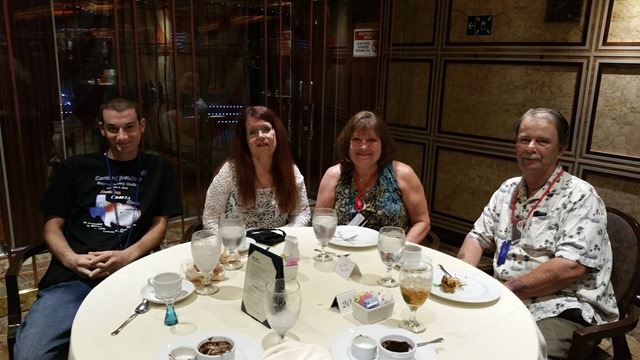 That evening, I went to dinner in the MDR with Joey and Susan and Terry, and got to meet Joey’s friend and our waiter, Michael, who proved to be one of the best of the MDR staff on that cruise. By now, the routine was pretty well established. Back to the cabin for Skype call (and glad to hear that Tom’s foot was a little better that day, although he was still having a tough time getting up and down the stairs). 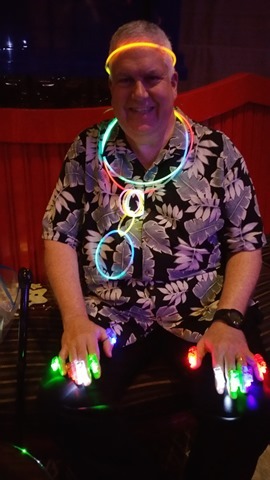 Then it was on to the piano bar, where that night we were all so happy we positively glowed. Literally. 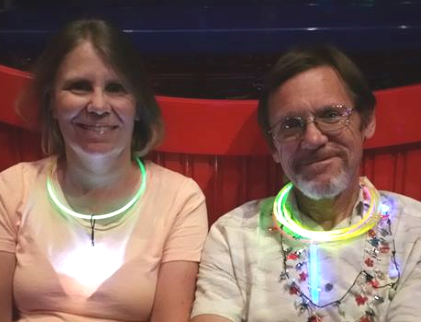 This was the night of our pre-planned “Glow party,” where we brought glow sticks, bracelets, necklaces, LED jewelry and other colorful accessories to light up our lives. 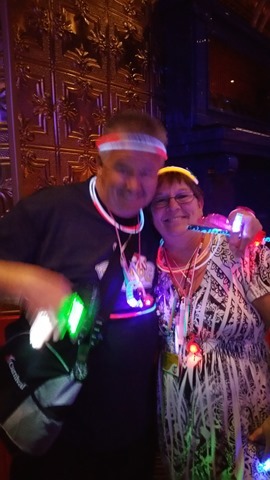 It was a fun time, as everybody got into the act. And there was plenty more fun yet to come. 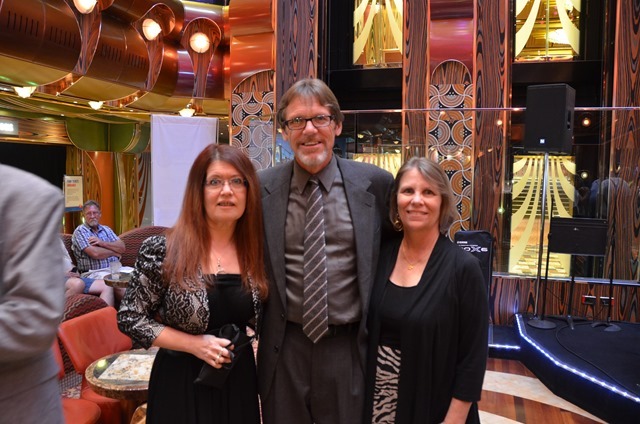 We were only a little more than half-way through the cruise. 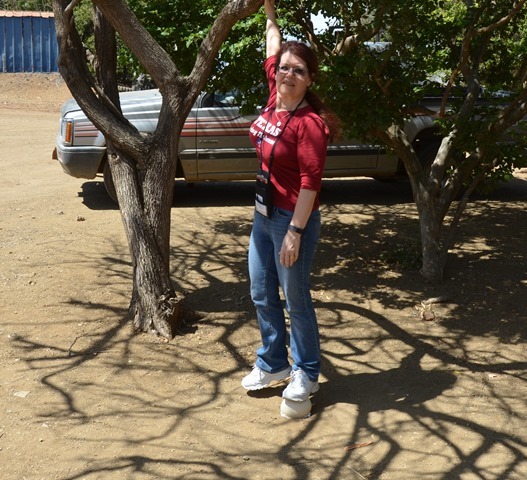 The next day, February 9, unfortunately turned out to be another working day for me. 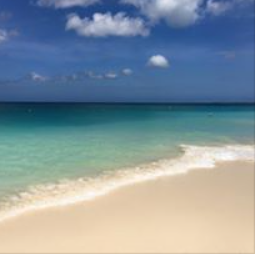 Unfortunate because I really wanted to get out and see Aruba, but the job comes first – it is, after all, what pays for the cruises. However, I wasn’t feeling so great anyway so it was just as well. I had a tour reserved but I cancelled it; luckily someone else wanted to take my place. I spent most of the day at my little desk in the cabin, writing about some boring server technology. After I finished the short article, I tried to nap but that didn’t work out so well. There was a crew safety drill going on that was punctuated by bells and alarms and the sounds of running feet in the corridors. I did get some reading and (finally) relaxing done. And I did get to live vicariously that evening through the photos of friends who were unfettered by contracts and deadlines (or as I prefer to call them, dreadlines). 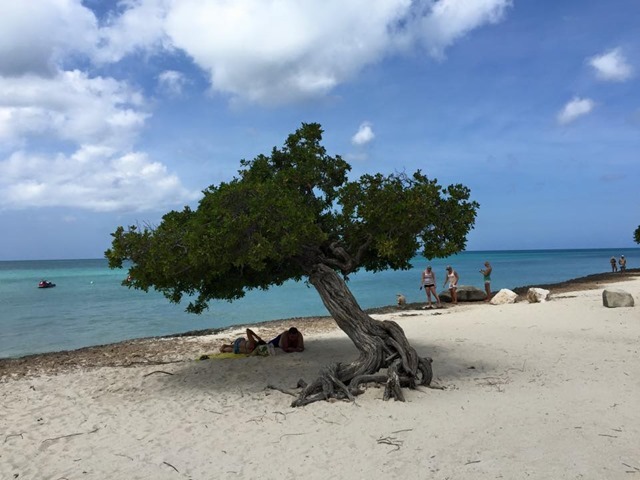 Aruba is a beautiful island and I will be back – and next time I’ll plan things so that I definitely get to spend some time exploring and taking pictures. 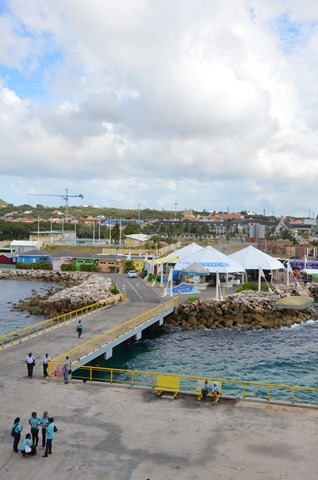 I did get a chance to go up to Lido to grab some lunch and get some photos of the port area from the ship. 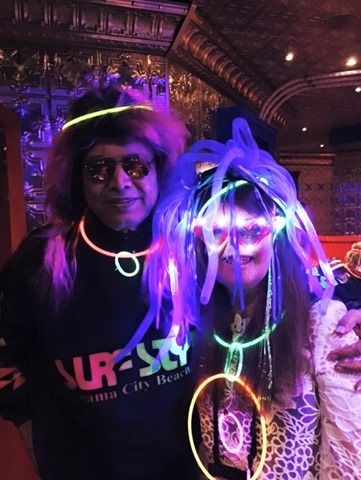 Because this ship had so many passengers with “status” – Gold or above – and because there were so many more Diamonds than usual – I heard it was close to 100 – they had set up two Past Guest parties instead of just one, and the second one was that night. 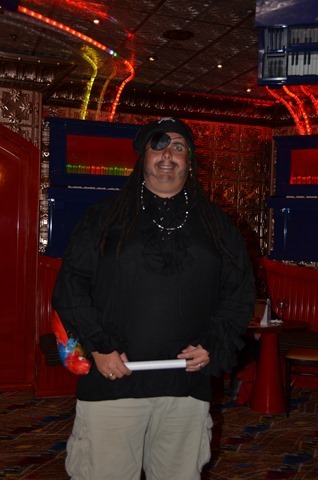 Although my invitation was for the first, I figured it wouldn’t hurt to try so I got dressed up and took my invitation, armed with my explanation about how I had missed the first party, down to the main theater. Well, there was no problem at all getting in, and I quickly found a group of friends to sit with and enjoy the party. The waiters, overloaded with requests, solved the problem in a unique way: when I asked for a BBC, the waiter brought me three so he wouldn’t need to go back again. 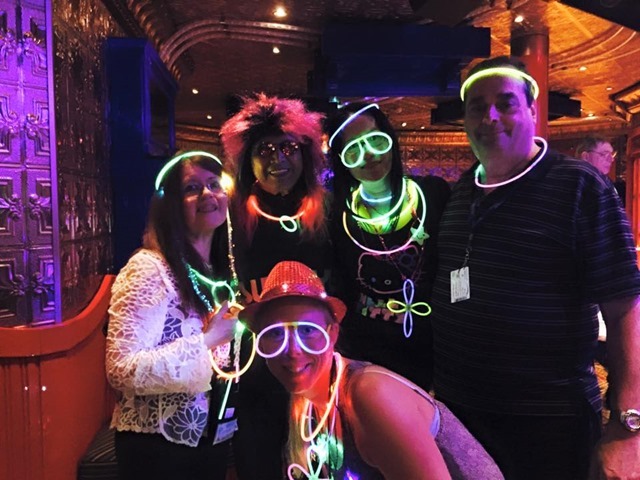 Jen, the Cruise Director, introduced the captain and select crew members, did her spiel, there was music and dancing, Mardi Gras beads were distributed freely, and then the Diamonds – many of whom were my good friends – were called on stage. After that, more music and any couples (or singles for that matter) who wanted to were welcome up on stage to dance as the party ended. After the party, I got back to the cabin to find email from Tom saying he was skipping the evening’s call. 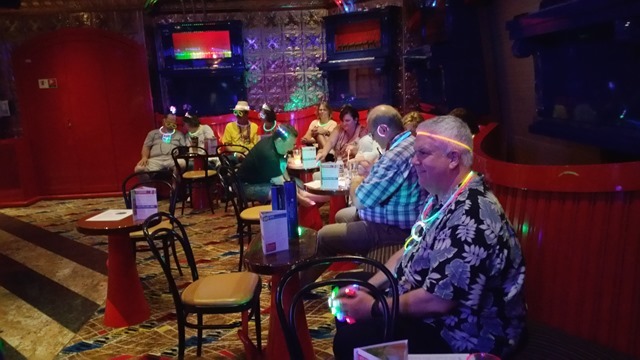 Late evening was a bit subdued; most of the folks who had been out and about in Aruba were tired and sunburned and there wasn’t much going on in the piano bar that night. We did go for pizza afterward, and then I went back to the cabin and read my book until I fell asleep (slightly earlier than usual). 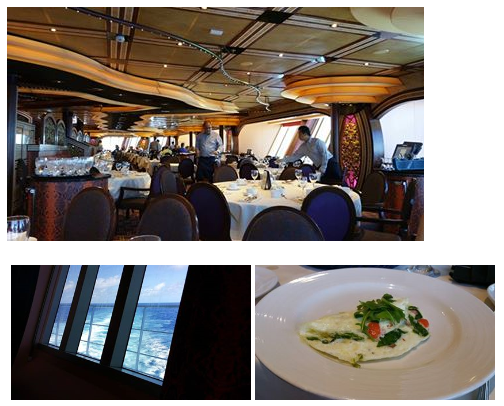 February 10th was another sea day, and a group of us gathered in the main dining room for brunch. 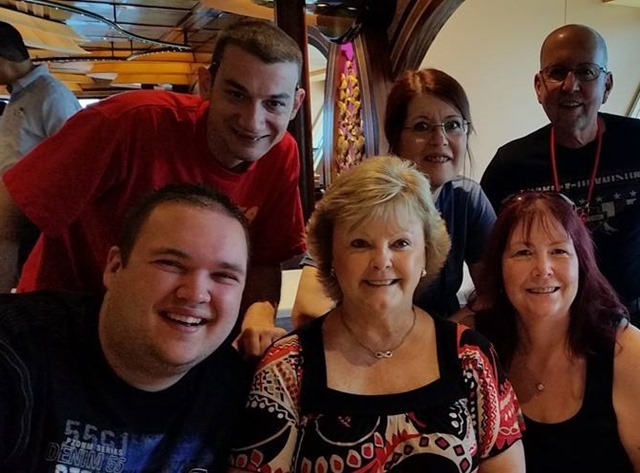 Had a great wake-up meal with Carol and Richard, Sharon, Lola, Lenore, Anna and Jeff, Karen and Frank and Bill. 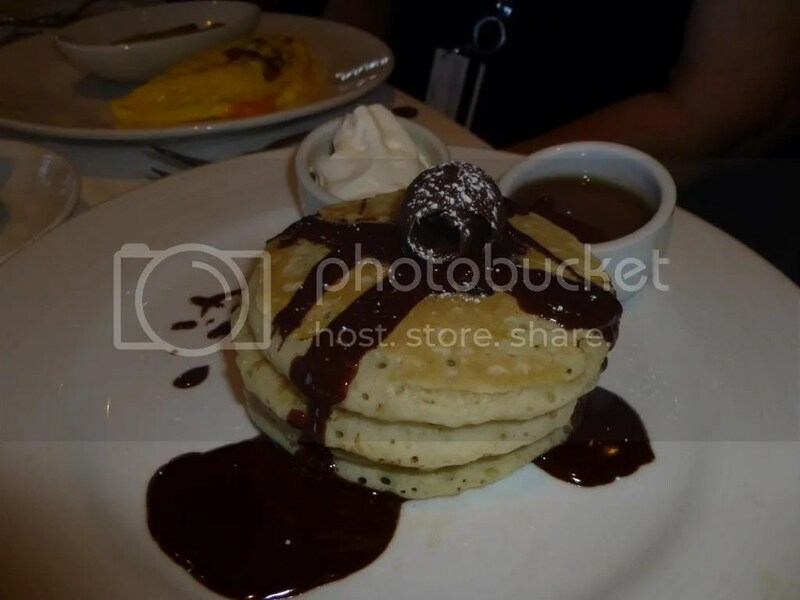 I ordered my Sea Day Brunch favorite, that I only get once per cruise (in the interest of not gaining dozens of pounds): the chocolate chip pancakes. They were delicious as usual. February 10th was also Microsoft’s Patch Tuesday, which meant another working day for me. One of my many regular assignments is doing a roundup of the security updates that are released each month on the second Tuesday, summarizing the technical details and any special instructions or “gotchas” for each, and getting that article out to my readers as quickly as possible. I was glad it fell on a sea day, since at least I wouldn’t have to miss another port to get it done. This was neither a particular light nor a particularly heavy month, with nine updates released (it can range from 2 to close to 20). I spent the rest of the morning and much of the afternoon on that, and then grabbed a late, light lunch on Lido (the grilled onions in the picture below), since I had been invited to dinner that evening at the steak house by Sam and Rose. At 4:00 pm, I stopped by the Atrium Lobby to sit in on the 80’s trivia game and then the Beatles-themed “Guess that Song” contest, although I didn’t actively play. Then back to the cabin to take a leisurely shower and relax a little before dressing for dinner. And what a wonderful dinner it was. As I made my way to the other end of the ship, I had to stop for a moment to stare at the most gorgeous sunset, which was the perfect opening act for the perfect night ahead. 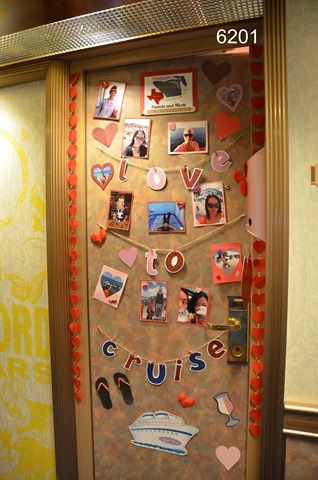 This is why I cruise. There is no other sight quite as awe-inspiring as the sun setting (or rising) over the open sea. 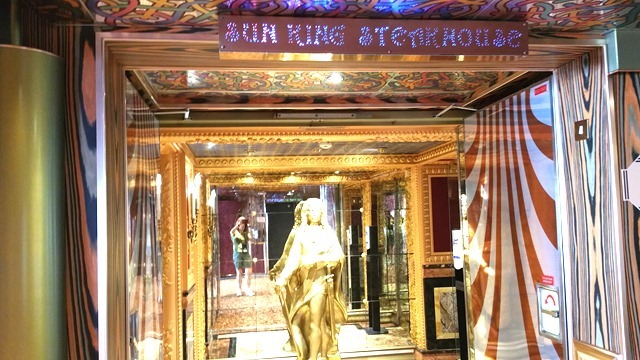 The Sun King Steak House on Freedom is, in my opinion, one of the best I’ve experienced on any of the ships (rivaled only by the steak houses on the Spirit class ships that are open to the sky through the skylights in the funnel). It’s a little tricky getting to it – I had to go outdoors and around, and of course it started raining while I was out there – in my fancy clothes and carefully coiffed hair – but oh, well. I eventually found the entry and it proved to be more than worth the trouble. 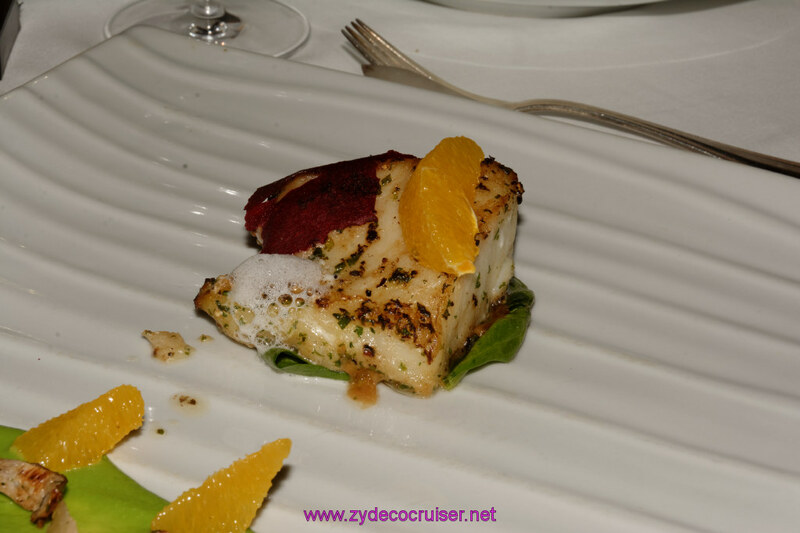 The food was absolutely delectable, as the food at the Carnival steak houses have always been in my experience. It’s the same fare, but I never get tired of it. 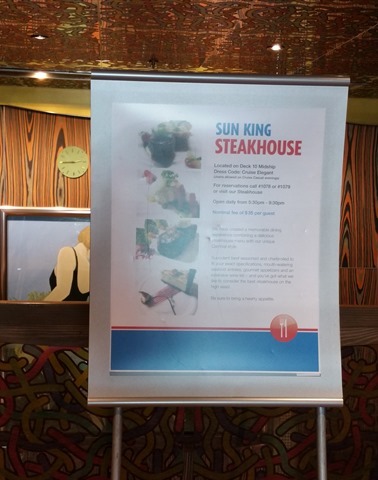 Even though I don’t eat steak (or any other mammals), the steak house is by far my favorite dining venue on the ships, and they always have wonderful seafood dishes (or vegetarian by special request). 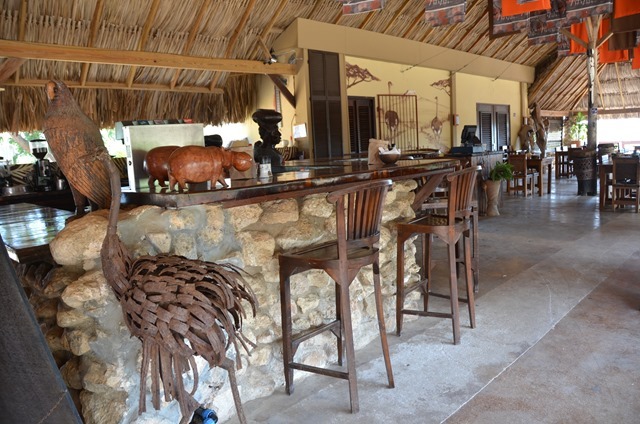 The fantastic cuisine was greatly enhanced by the good company. 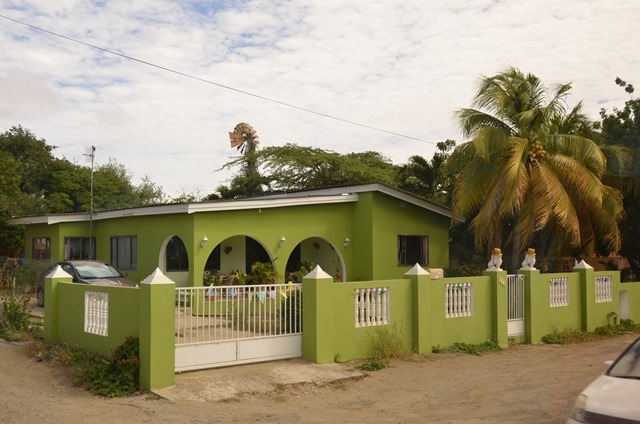 Sam and Rose were exemplary hosts and had also invited Norm and Di, Bill and Elizabeth, Randall and Karen, Jackie and Barry, and my new “soul sister” Lacy (Linda). 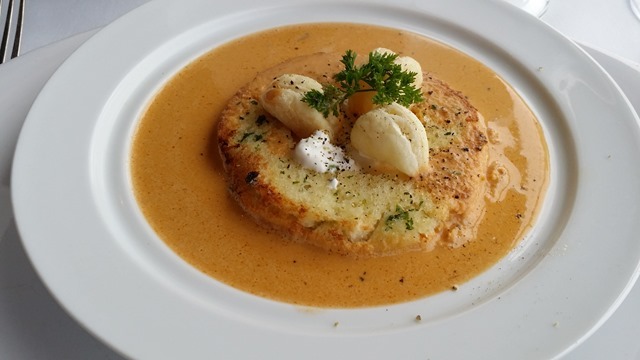 When it came time to order, as usual I was torn between the Maine lobster, the lobster ravioli and the Chilean sea bass, and also as usual, I ended up ordering the latter and getting my lobster fix via the appetizer: the excellent lobster bisque. Some others in our group did go for the big lobster. 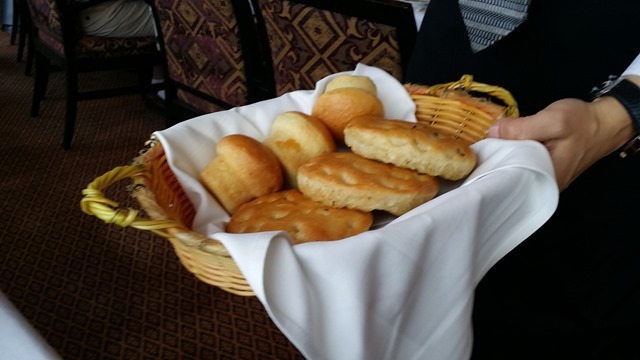 Of course, the absolute best item isn’t even on the menu; it’s those to-die-for big round rosemary rolls that could be a meal in and of themselves. I had been good for the last 9 days (well, except for that Chef’s Table night), but this time I just couldn’t resist: for dessert, I ordered the gargantuan hazelnut cheesecake that is soooo smooth and creamy and sweet but not too sweet. 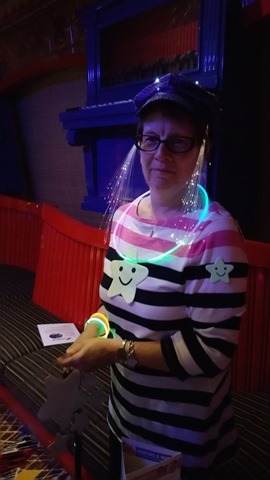 I know I should’ve had the fruit cup instead (which some in our party had the willpower to do), but I’m going to blame it on the wine, which was flowing freely. Maybe I’ll at least get points for not finishing the cheesecake, but probably not since eating the whole thing would be humanly impossible (at least for me, and I’ve tried many times). All in all, it was a lovely evening and I hated to see it finally end. 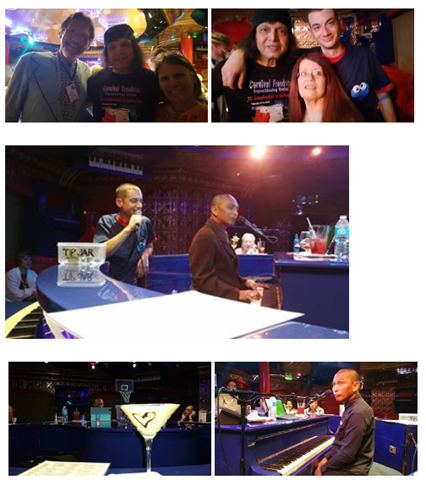 We met up with Joey and the others for a bit afterward but it was Russell’s night off so the piano bar was empty. 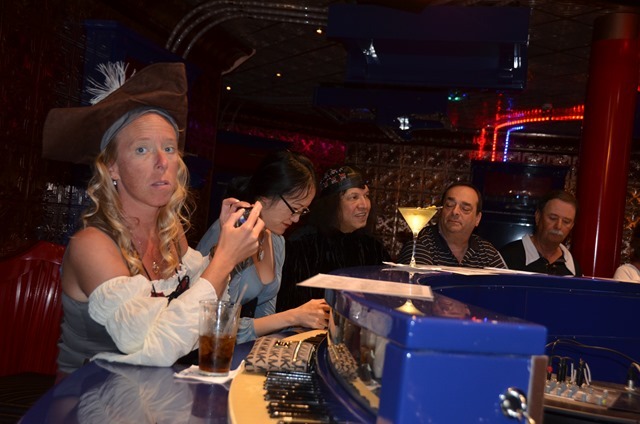 Some of us sat at the Alchemy Bar for a while. 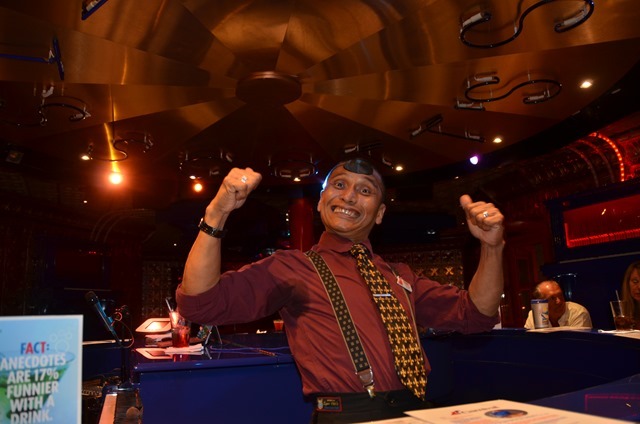 They have some really great bartenders there (they’re the ones who make the drinks for the piano bar, and the tiramisu martinis that they make there taste – and look – much better than the ones I got in the MDR and other bars on the ship). 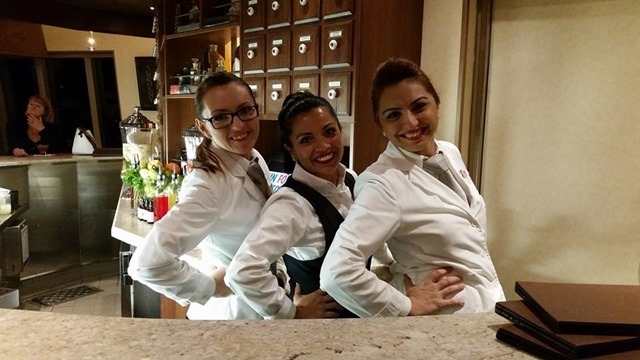 The waitresses are also super. 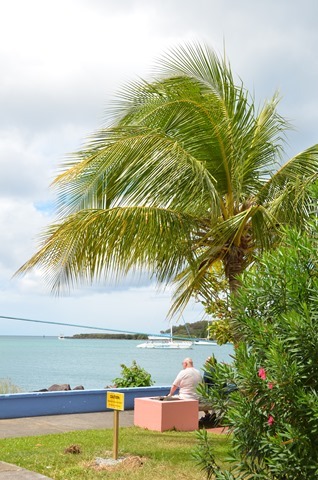 Feb. 11 was another sea day (I loved all these double sea days – even though I really enjoy exploring new ports, for a cruise like this that’s so people-centric, lots of days at sea is a definite good thing). It was also the day of the infamous Bella Perlina sale, which meant I made a point to avoid the Atrium Lobby at 2:oo pm. Those sales get a little crazy – almost like Black Friday. It was a lazy day, and for once I didn’t have to worry about getting an article done. 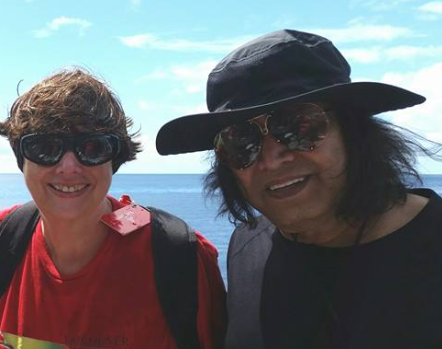 In fact, I had all my work done and could, at last, enjoy what was left of the cruise as pure vacation. It was also the second elegant night, and I toyed with the idea of going to the salon and getting my hair braided or put in an up-do but decided against it. 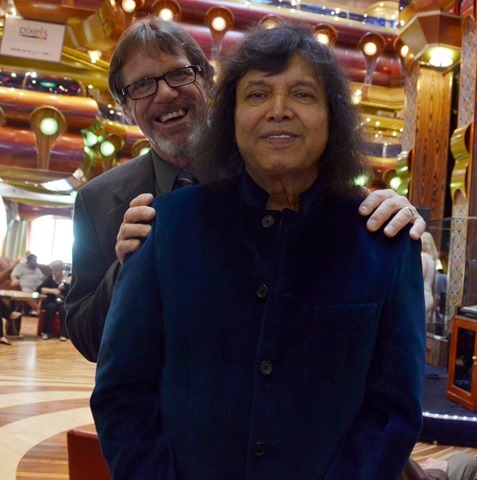 The prices on the ship are pretty high and my hair was looking good, thanks to the ship’s reverse osmosis treated sea water. One of the reason I would love to live on a cruise ship all the time (if I could have Tom and the dogs there with me) is the way my hair responds to that water. It makes me sad to come back home to our horrible, hard, mineral-laden water that leaves it frizzy and lifeless. Some of my friends attend tea but since I can’t stand tea, any kind of tea, and don’t like to wear hats, it seemed sort of pointless. 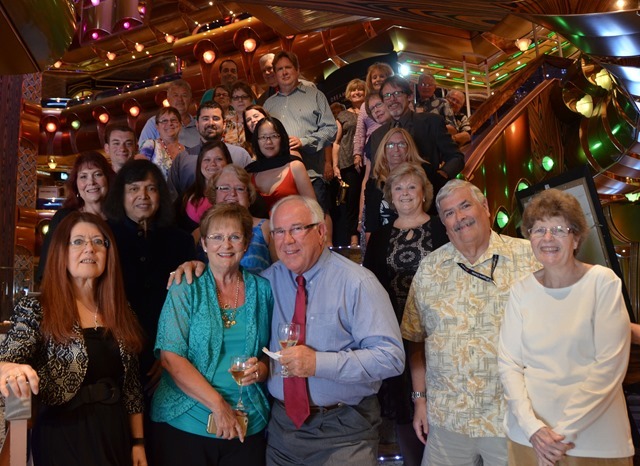 🙂 I spent some time on the Serenity deck and some time in the gym, and before I knew it, it was time to get ready for the elegant group photo that the group had planned. 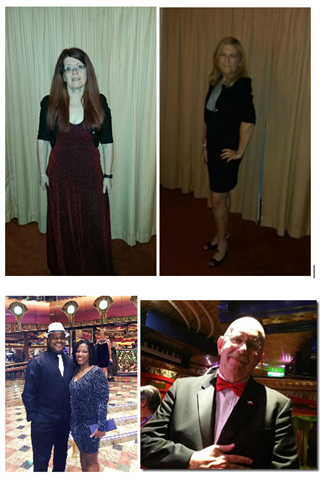 We met before dinner in the atrium lobby and recruited a photographer to snap some shots, one on the stairs and one in front of the elevators, which turned out pretty nicely. We did all look pretty spiffy, if I do say so myself. We had a wonderful dinner that evening in the MDR with Sam, Joey, Nicole, Mike and Pat (who were in a romantic mood after a couple of tiramisu martinis). 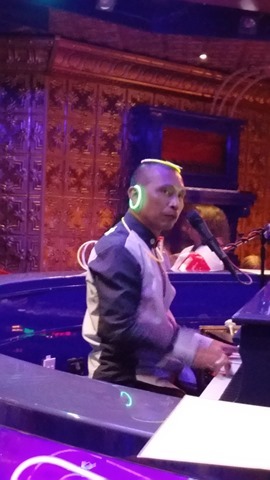 The piano bar didn’t open at 9:00 that evening as usual – but for good reason. 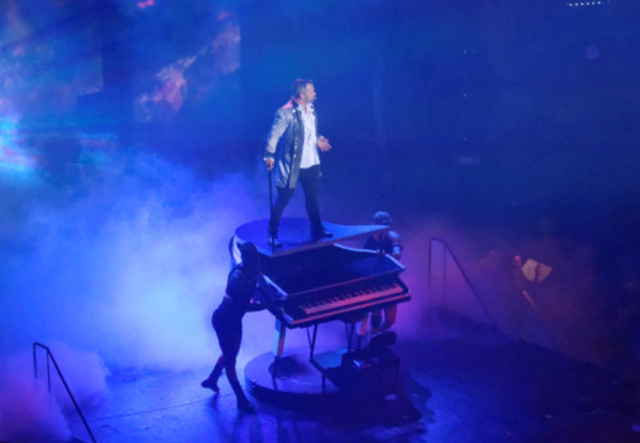 Russell was performing in the main theater in the “88 Keys” production, which was a fantastic show. 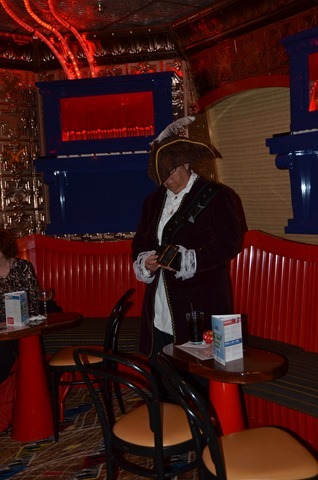 He was back later, though, and the singers and dancers from the show also stopped by to join us for a while. 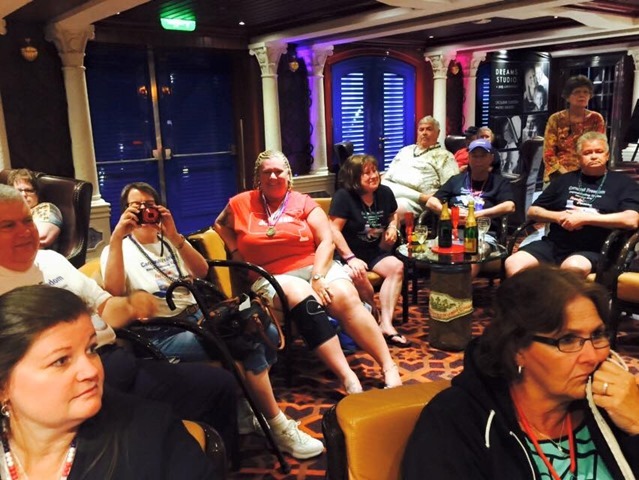 We all knew the cruise was coming to a close, and there wouldn’t be many more nights like this. 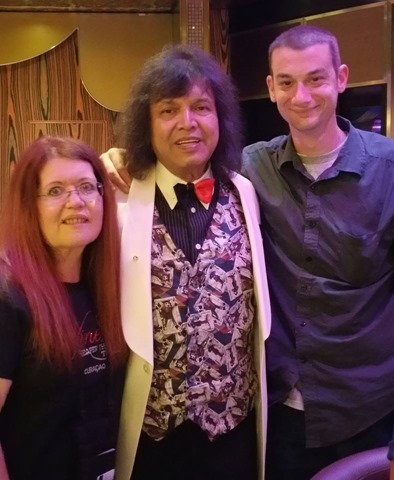 Lacy and got to have our photos taken with our favorite piano man. 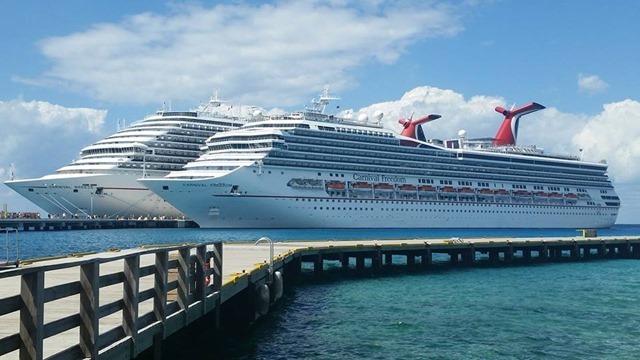 Our last port was Cozumel, and we arrived there on the morning of Feb. 12 to find that Freedom’s “big sister,” the Breeze, was already there to greet us. 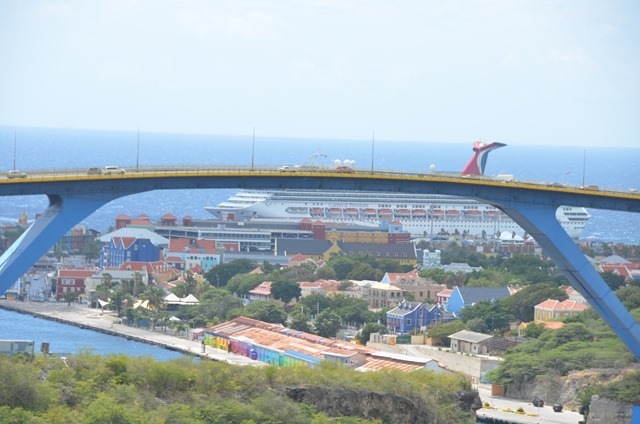 The two carnival ships weren’t the only ones in port, either. 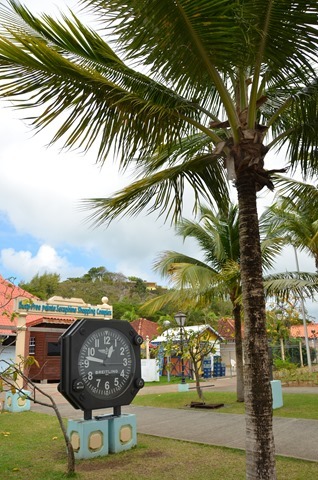 I didn’t have any excursions planned there, but I got off the ship and walked around a bit and enjoyed the sunshine and most important, bought some rum cakes to take back home. After wandering around for a while, I made my way back to the ship. Dinner that evening was the always-excellent vegetarian lasagna at Joey’s table, and when I got back to the cabin after dinner, this guy was hanging around. 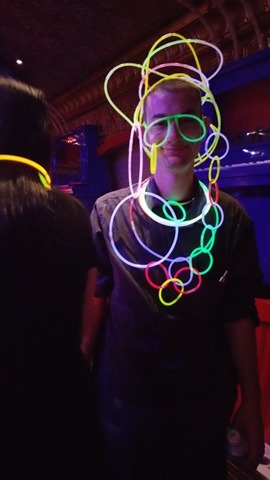 For some reason, the Internet connection went wacky after we left Cozumel. 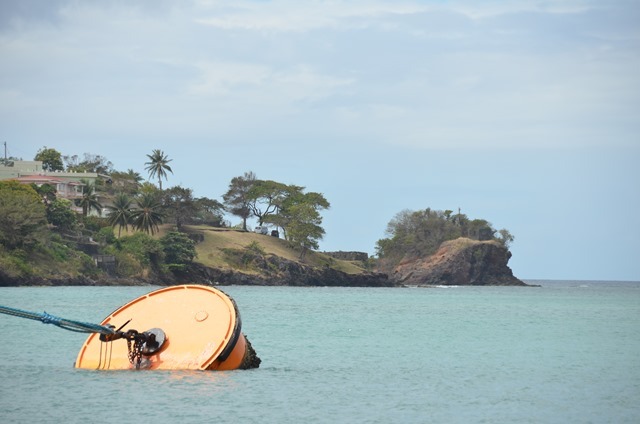 We had some choppy seas so maybe the weather was the culprit. Whatever the cause, Tom and I kept trying to talk but the connection kept dropping, which was frustrating. We finally gave up. 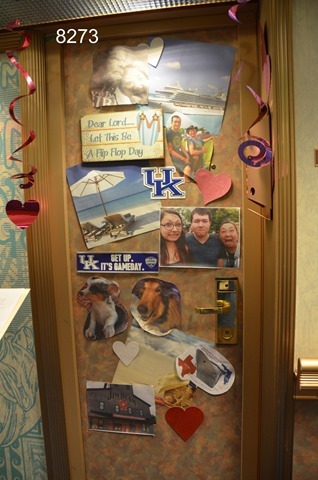 It wouldn’t be long until the cruise was over and I was starting to miss him and the pups pretty badly. 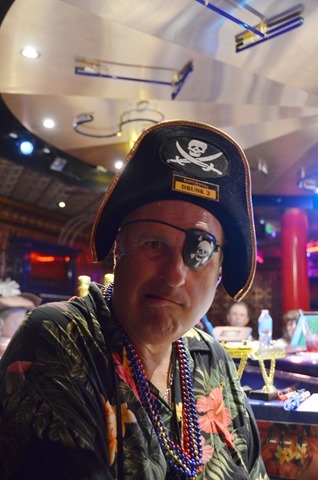 By the time I got to the piano bar that night, it had been invaded by pirates. 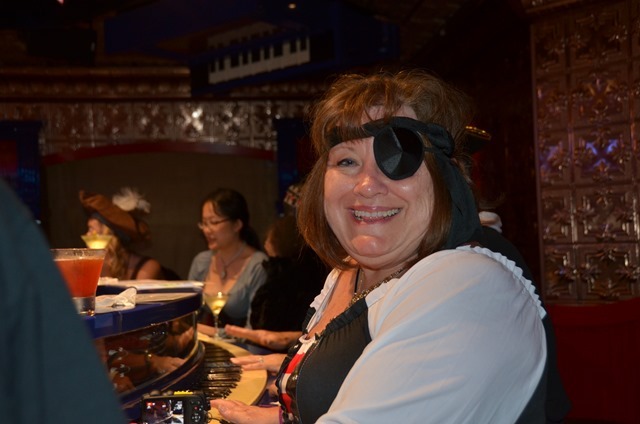 They were everywhere – eye patches, tricorne hats, carousers, scallywags, strumpets and wenches, perhaps a picaroon or two. 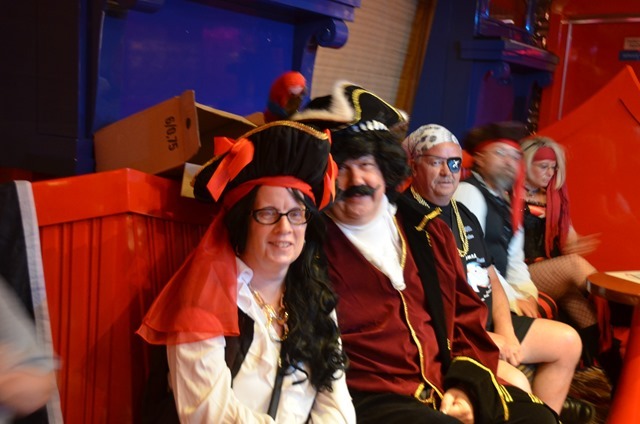 It was pirate night, and so folks had really gone all out for the party, donning elaborate costumes and amazing accessories; I think some of them must have brought entire suitcases just filled with pirate gear. 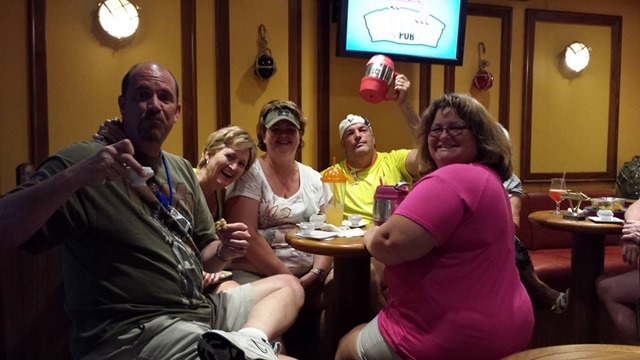 With this group, the fun just never stopped. They pillaged and plundered long into the night, and I fear a few got a wee bit squiffy from the rum and other intoxicating beverages floating about. But those who needed it had plenty of friends nearby to provide a helping hand back to their cabins. Friday the 13th: and it was a bit ironic in that we all felt a tiny bit unlucky, knowing that this was our final day together. 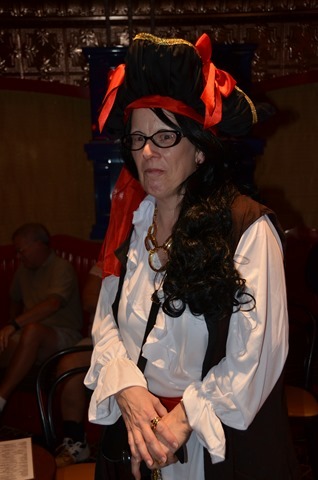 There was a just a touch of a somber tone throughout the ship all day. Maybe it was because we were all either hung over or just plain exhausted from the pirate antics the night before, but that last brunch didn’t draw a very big crowd and wasn’t nearly as festive as the ones before. After breakfast, I hurried back to my cabin to finish up the slide show presentation that I’d been working on, to show at the goodbye party that we had scheduled for that afternoon. This day was the only one when the formerly excellent Internet connection was dropping out badly, and it was driving me nuts because I couldn’t access all the online photos I wanted to include in the slide show. Consequently I ended up using mostly the pictures that I had taken myself, and that limited the scope to those people I had spent my time with. It made me sad because I had wanted the slide show to be more inclusive and representative of the entire group, but sometimes you have to work with what you’ve got. And work I did, frantically, right up to about 15 minutes before the party was scheduled to start. 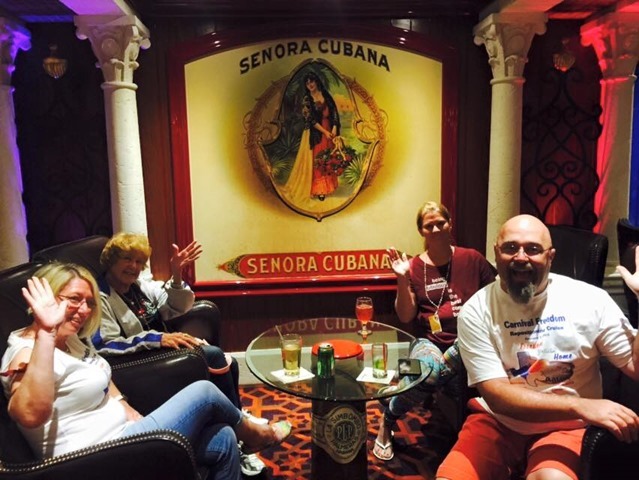 Then I grabbed my Surface and camera and headed for the Havana Lounge, which Norm had procured for us to use. It’s a great venue and as promised, they had a projector and screen set up for us. The only problem: the projector cable had a VGA connector. Umm. The Surface, like most newer laptops, only had an HDMI video output. 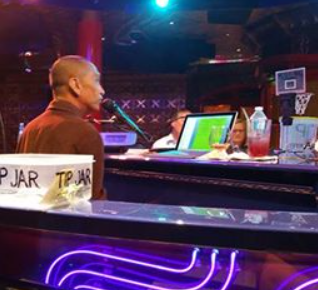 I have an HDMI-to-VGA adapter, but of course I hadn’t brought it on this cruise. So all of my expected setup time was spent trying to find someone with a) an older laptop with VGA output that had PowerPoint installed or b) an adapter. 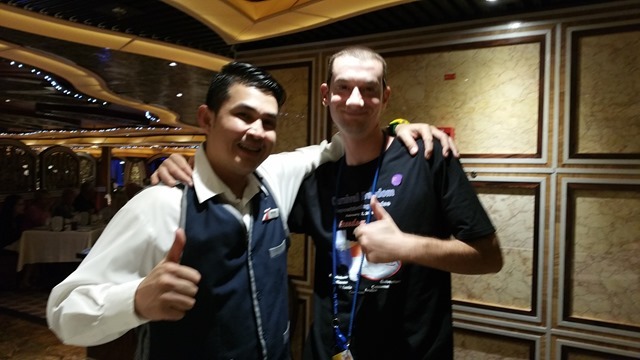 Finally the fantastic guest services guy saved the day, locating one of the ship’s IT people who had an adapter. I hooked it up and we were in business. Meanwhile, people had been trickling in and the room – a really lovely venue for a party, by the way – was fuller than I had expected. We had at least a couple hundred people there. My little presentation was a top-of-the-head thing that I had thrown together at the last minute, but it expressed my feelings – and, I think the feelings of at least some of the others – about this absolutely incredible twelve days that we had spent on the sea and exploring the islands together. I invited others up to the microphone to have their say, too. There was a brief attempt to disrupt the solidarity with complaints about a conflict that had developed between some of the group members and another one, but I refused to let it happen, noting that it wasn’t the time or the place. This was a time for saying goodbye, for people who had come to care about each other, for fostering good feelings and not for fomenting divisiveness and animosity. A couple of people didn’t like that and left, but it was only a small minority and the party went on without them. 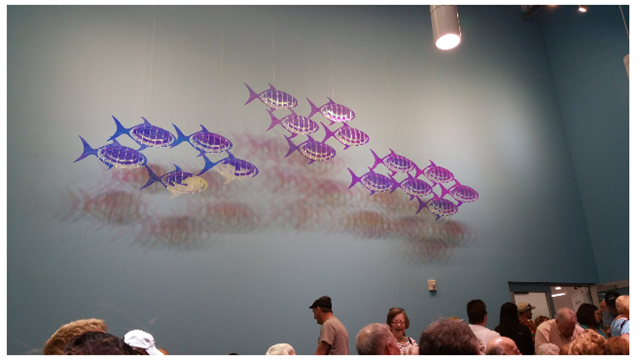 The rest of us lingered for a long time afterward, not yet wanting to let go of each other. There was a lot of picture-taking as we scrambled to capture the memories in visual form before they could get away. There were a lot of hugs and more than a few tears. We all got together for one last, mammoth group photo and then split into our own little groups of closer friends to exchange contact information, make plans to sail together soon, and relive the good times we’d had since leaving Fort Lauderdale, which in some ways felt like yesterday and in others felt like a lifetime ago. 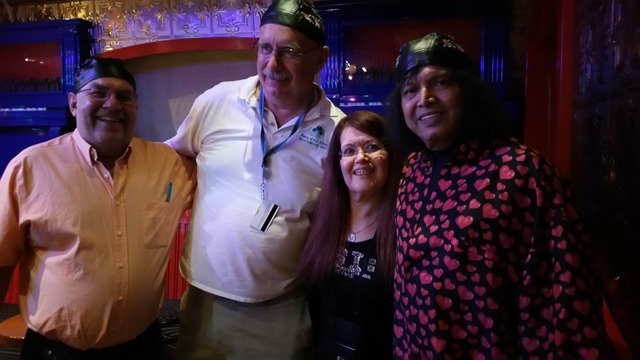 NOTE: The tee shirts that most of us are wearing in the photo above are the ones that were made for us by Patti Dressler Brower. I talked to Tom that night and we made plans for him to pick me and Sharon up at the port. He had driven down to Houston to go to the race track the night before and my son was staying with the dogs. 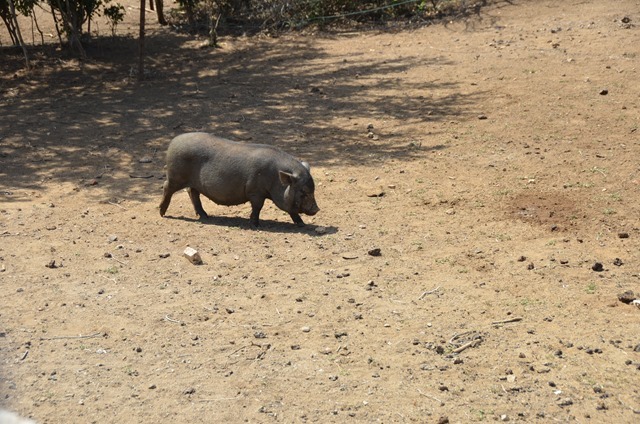 The worst seemed to be over as far as his foot/ankle was concerned, which was a relief. 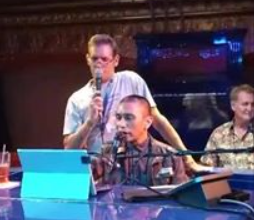 Then came the hardest part of all: our last night in the piano bar. 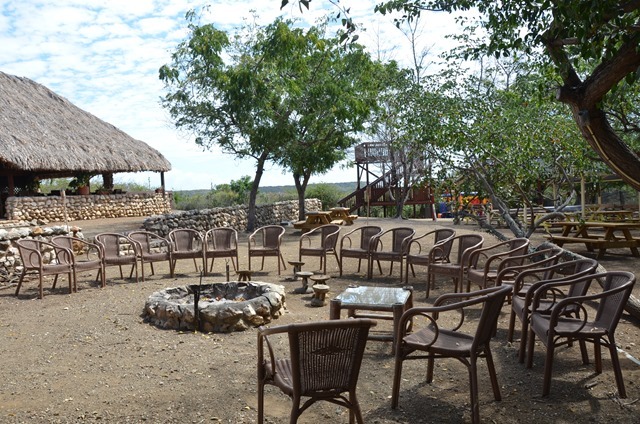 The small group of us who had gathered there every evening had formed a very special kind of bond. 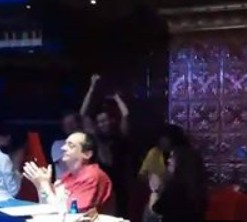 There would be other cruises, and there would be other piano bars, but I think we all knew that the unique dynamics sparked by these people in this place at this time will probably never quite be duplicated. Over the last twelve days, our group had evolved from strangers we “knew” only or mostly through our Facebook interactions to friends with whom we discovered many things in common and then into something almost akin to family – complete with its little family feuds and its black sheep – and for some of us, to BCFFs: Best Cruise Friends Forever. 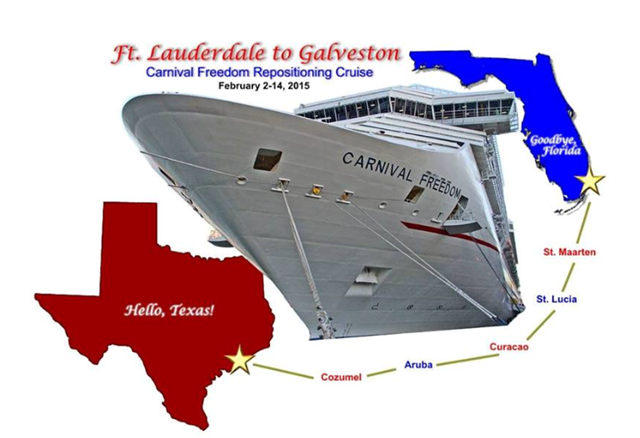 On Saturday, Feb. 14, by the time most of us woke up for the last time in the cabins that had come to feel like “home,” we were already docked in Galveston. 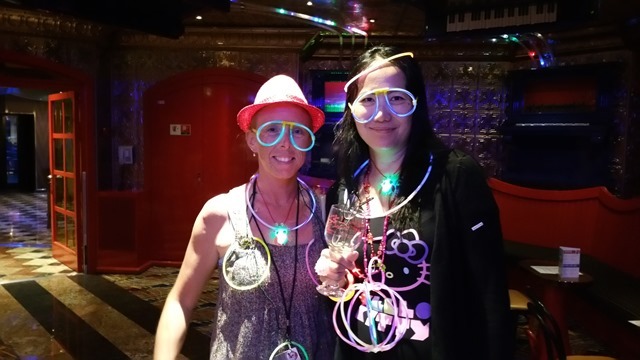 The usual post-nautical depression was already setting in, even before we got off the ship. Debarkation day is never a cheerful one; everyone was sad to be leaving, even those of us who were glad to be getting back to spouses, kids, pets and our own beds. Our bags were, as the song says, packed and ready to go – our carry-ons (or should it be “carry-offs”? ), that is. Our checked bags had been picked up outside our doors the night before. 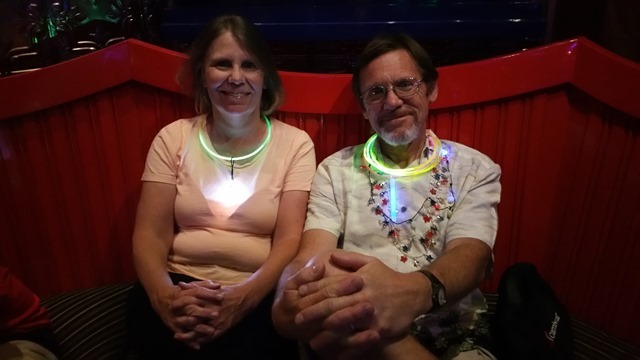 There was nothing left to do but wait for our zone to be called (and with so many Diamonds on board, even with Platinum status our cabin was relegated to zone 5). It was, unlike on some cruises, a smooth process and soon we were off the ship, had found our bags, gotten through the customs and TABC lines (a fewer dollars poorer and with shiny new tax stamps for our bottles of Sheridan) and were standing outside at the curb, along with hundreds of other cruisers, waiting for our ride. 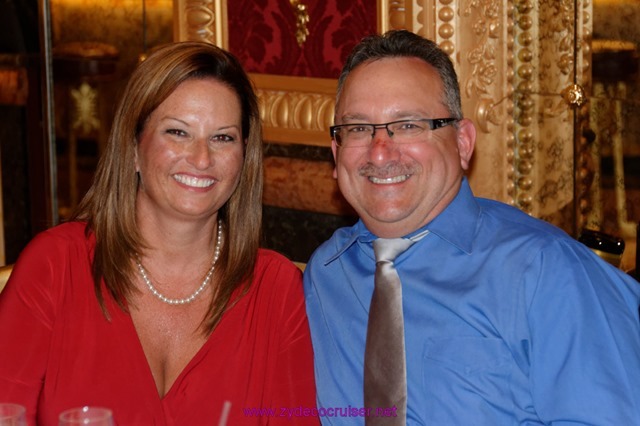 Tom and I had been messaging as we debarked, and it wasn’t long before he pulled up and we loaded our bags into the Caddy and began the 5 hour drive back to Dallas. It was over. But it would never really be over. 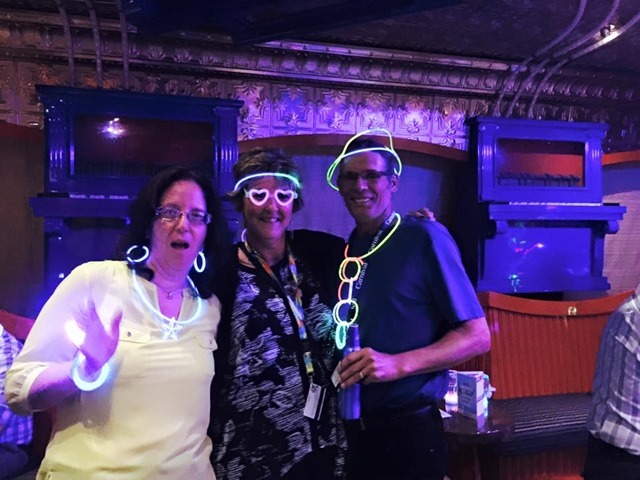 They say every experience you have changes you in some way, and this cruise changed us all – some in subtle ways and others in more profound ways. It was truly an epic adventure. 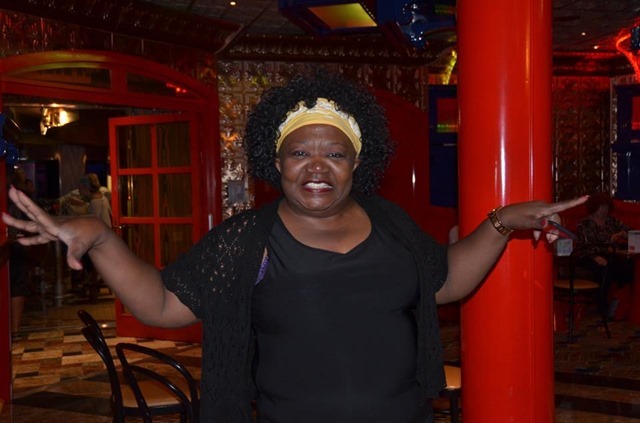 Even my many Diamond friends who have sailed so many times to so many places – across the Atlantic, across the Pacific, across the equator, to Europe, to the Baltic, down under, and way up north – have said that this cruise was different. It was special. It was one of a kind. Those twelve days were like a bubble in time. On that Saturday morning, the bubble in which we had been floating popped and we came back to earth. 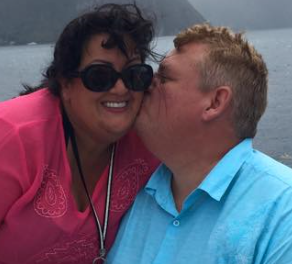 It was somehow appropriate that our little dream ended on Valentine’s Day, as if one of cupid’s arrows had pierced it, bringing us all back to the “real world” and our everyday lives and our jobs and families and the people and places we loved. All good things must come to an end. And that’s okay. It’s the fleeting nature of those unexpected magical times that makes them special. On Day 13, I was no longer sad. I felt invigorated, energized, and happy to be going home. I wanted to take a little of that magic with me, and share it with those who matter most to me. 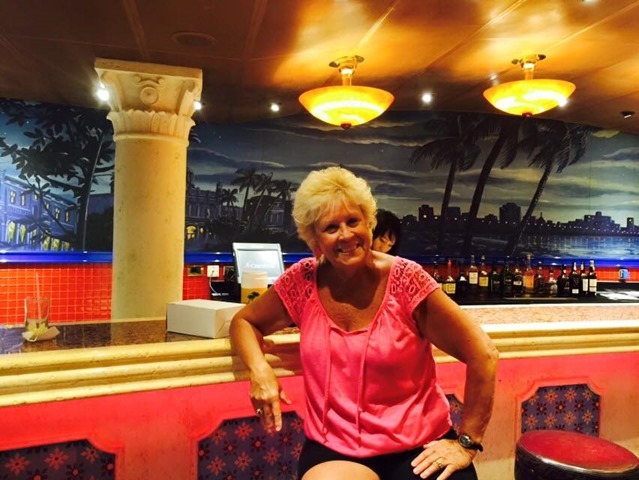 Cruising has opened up new vistas for me, and new ways of thinking and doing and being. It’s taught me things I couldn’t learn anywhere else. If I had to articulate the most important thing it’s taught me, I think it would be to make my life less about collecting things and more about collecting memories. It’s also taught me to be grateful. 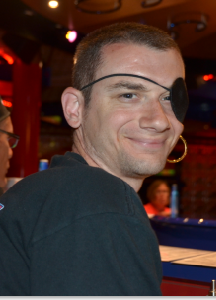 To my cousins, who first talked me into trying a cruise when I was sure it wasn’t something I would be interested in. To Tom, for supporting my dedication to my newfound hobby/addiction, for taking care of the house and my “babies” when I’m sailing and for the times when he joins me and shares the experience even though the sea doesn’t call him in quite the way it does me. To my son and his roommates, who house- and pet-sit so that Tom and I can have those times together. To my daughter, who has lived on a ship off and on for almost two decades and so maybe understands a little bit. 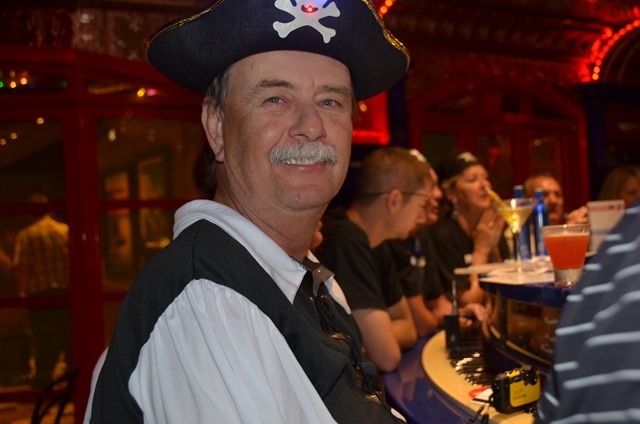 To all of the captains and crews and cruise line personnel whose job it is to make it all possible. 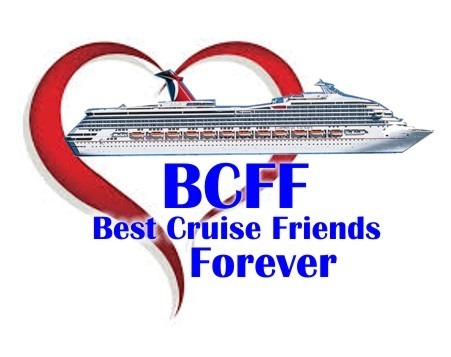 And to my BCFFs, both the ones I met on this cruise and the ones who I’m sure will be added to the family on future cruises. holds one in the net of wonder forever. Author’s Note: As excruciatingly long as this review is, I know I’ve left out a lot. There were people with whom I spent time – long or short – whom I didn’t mention. There were folks who helped me with things, with whom I had great conversations, who gave me gifts, who accompanied me at shows or activities, who took pictures with my camera for me so I could be in the photo, who shared a meal or a drink or a laugh or a sad or happy story, whose tales I didn’t repeat here. If you don’t see your name here, if I didn’t get a photo of you or if I did but didn’t include it in this post because I simply ran out of space and time, it doesn’t mean you didn’t touch my life. 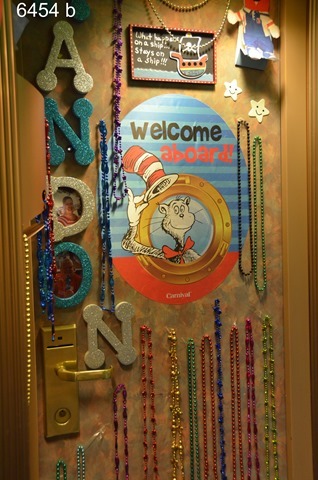 There were many activities, such as the slot pulls and other casino events, the Seuss at Sea breakfast, the Behind the Fun tour, and many group excursions in which many of our members participated but I wasn’t a part of them so I didn’t have photos of them and couldn’t write about them from personal experience. 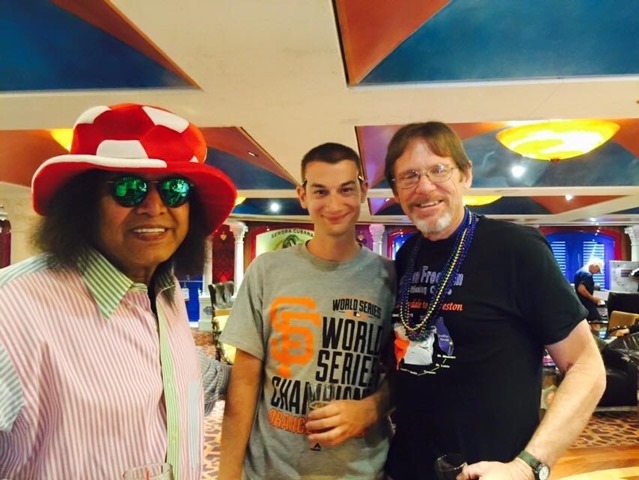 This cruise was much, much more than what I’ve recounted here. 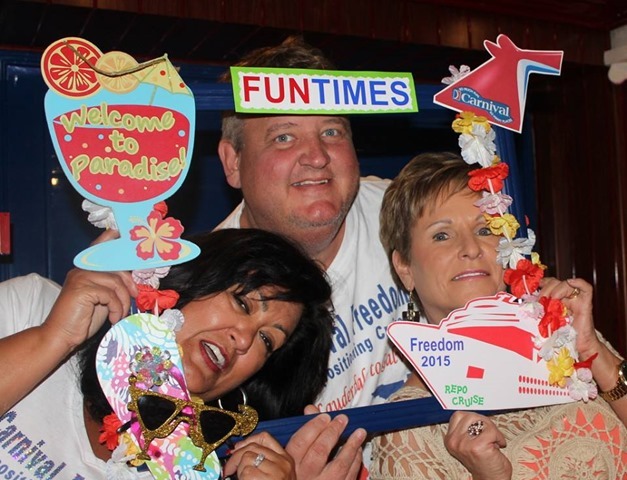 Note to my fellow Freedom Riders: I ended up with a lot of photos from this cruise, saved to various locations. The vast majority of them I took myself, but I know some of them were shared with me by other people. I’m not sure exactly which ones those are or, in most cases, who took them. I’m not trying to take credit for your photography and if you see a picture here that was yours and you want me to remove it or add a credit line identifying you as the photographer, please let me know and I will. 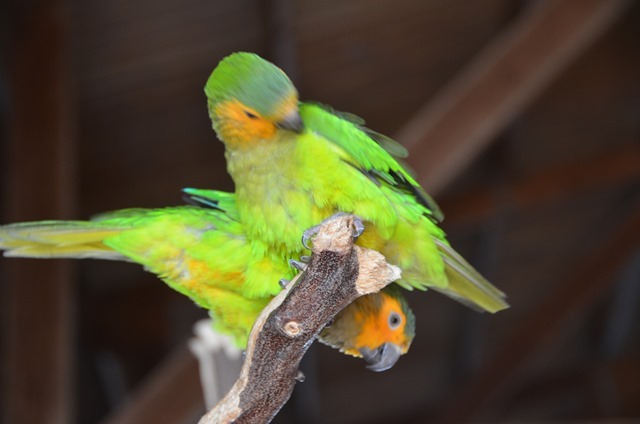 Please feel free to share the photos I took with others; I took these not as a photographer creating intellectual property but as a friend wanting to capture and preserve the wonderful memories for all of us. Finally, I’m sure there are plenty of typos in this novelette-length piece. I wrote it (and wrote it, and wrote it) over a two-day period, almost non-stop for hours. There aren’t that many words compared to many things I’ve written in less time but finding all the right photos and getting them inserted at the right sizes and in the right places was tedious work. 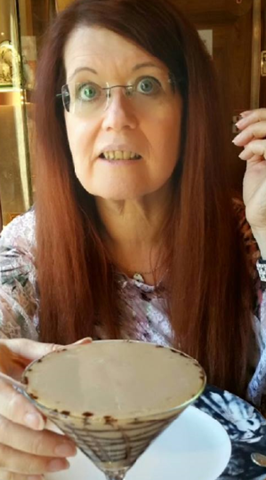 I’ll fix the typos as I discover them; meanwhile please be kind enough to overlook them and know that when you see a grammatical or spelling error, I probably know better – sometimes my fingers just get ahead of my brain. 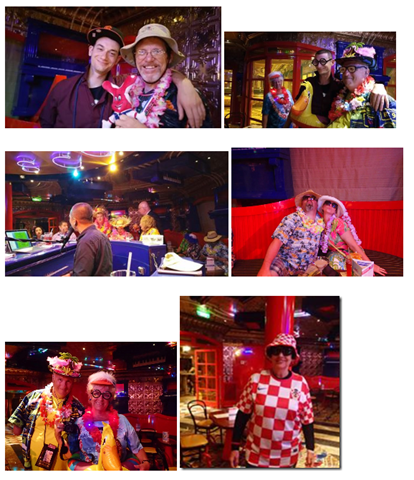 Enjoyed it… although my Surface only loaded a few of the pictures. That really was a special group. Wish we could have participated more. 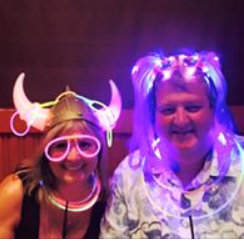 We keep trying to book that GSOV….maybe one day we will beat you to it! Thanks, Sue. Sorry the photos aren’t coming through for you. 😦 I checked them on three different web browsers and they do load on my Surface Pro 3. You might try clearning the browser cache. Also, it could be the connection from your Internet provider. Also sometimes your security software can cause images not to load. 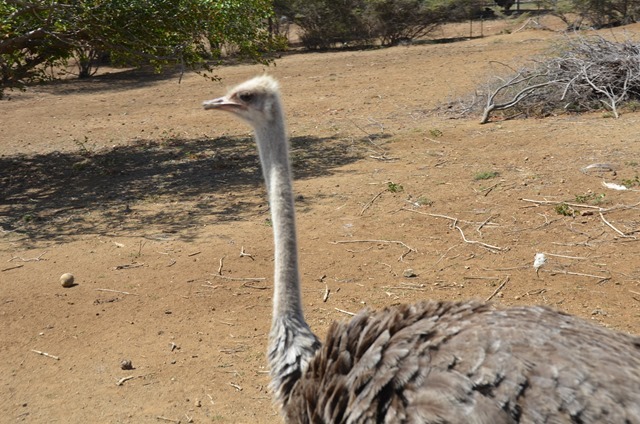 Anyway, I’m glad you enjoyed the post although I know the experience would have been better with the photos. Took awhile, but they finally loaded. 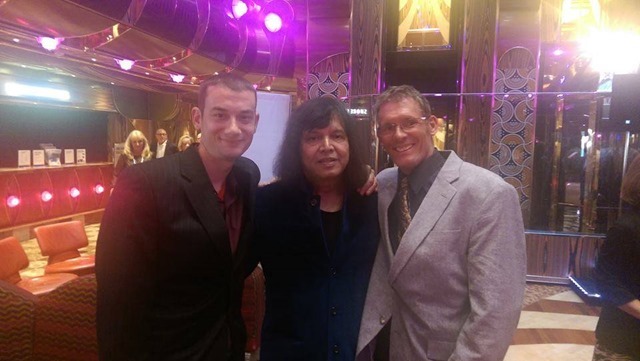 This was a cruise of a lifetime. 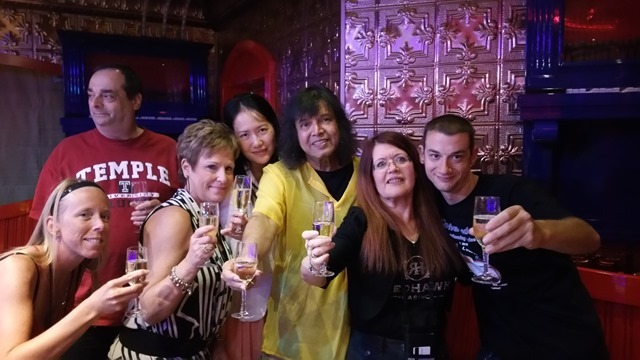 I just loved meeting everyone. This is a Fantastic presentation–thanks for everything you have done. 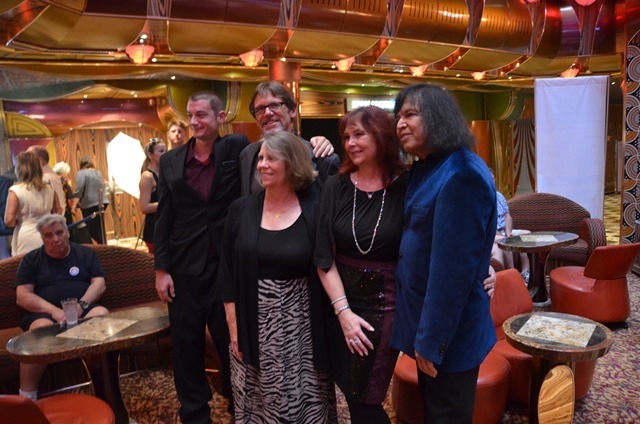 I know, while there are many more cruises in my future–there will NEVER be another 1 like this! My love sent to everyone.